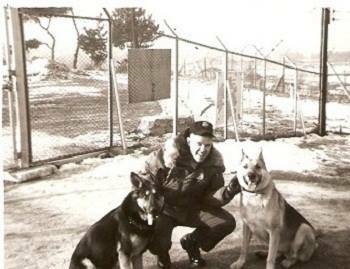 1953 - Some of the first K-9 to be used in the Korean war. 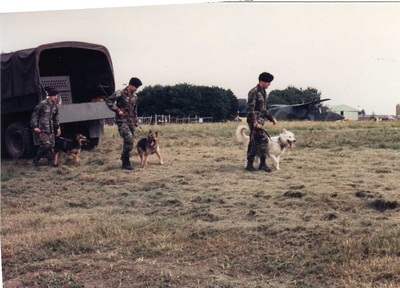 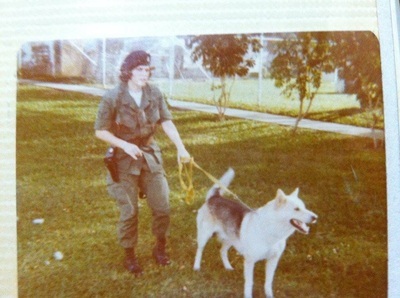 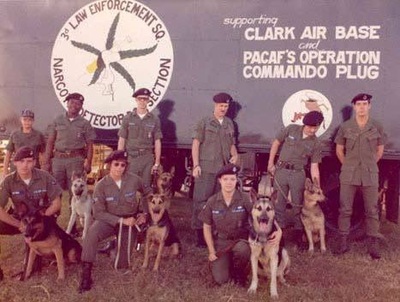 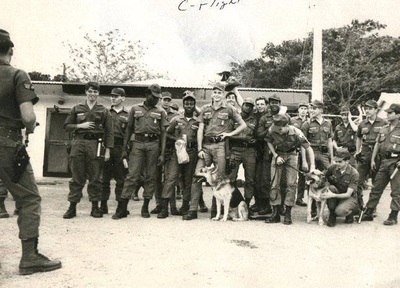 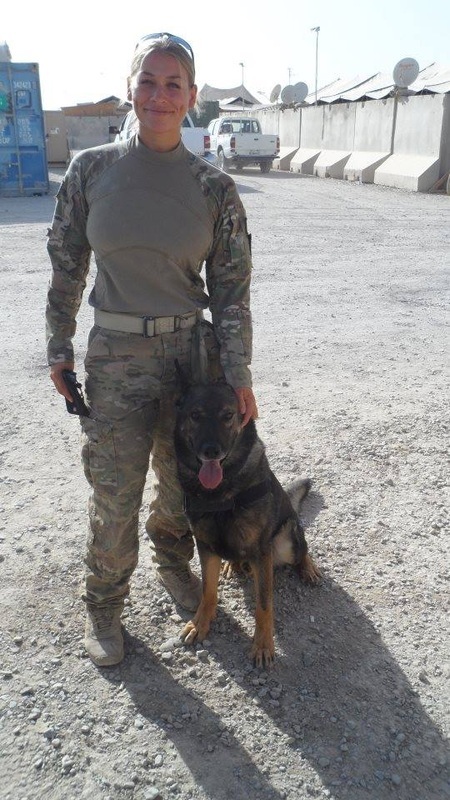 First all-female MWD exhibition team Clark AB, Philippines. 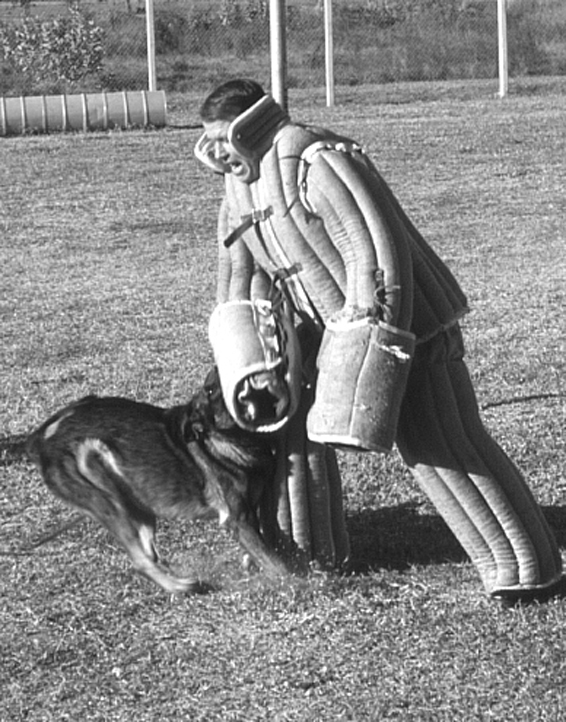 People have used dogs to protect themselves and property since prehistoric times. 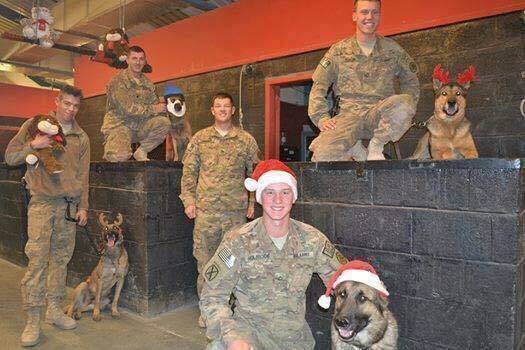 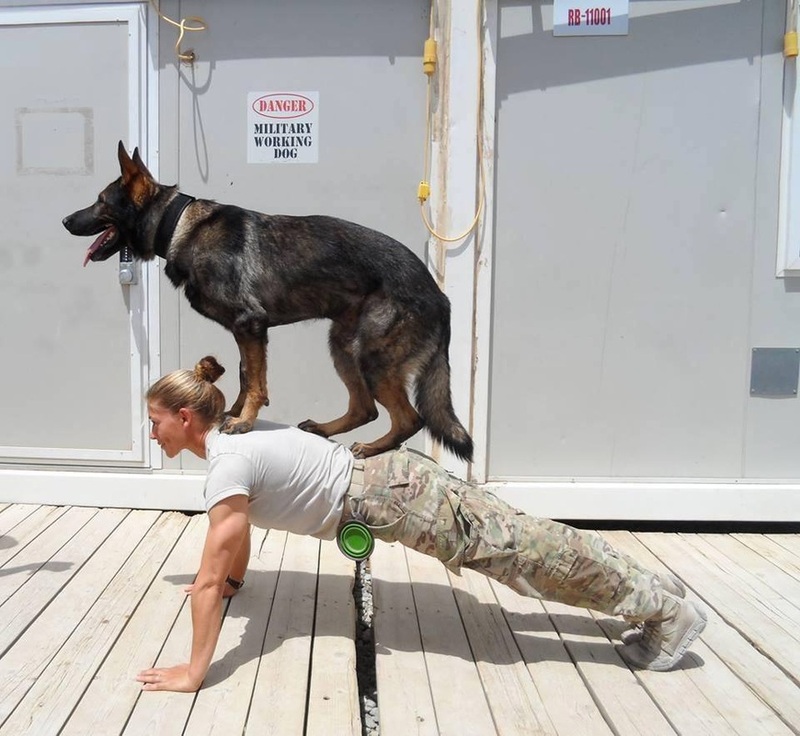 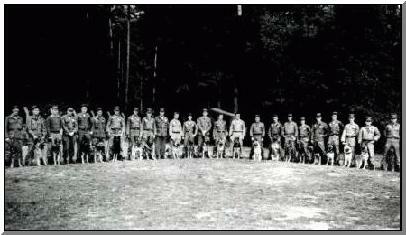 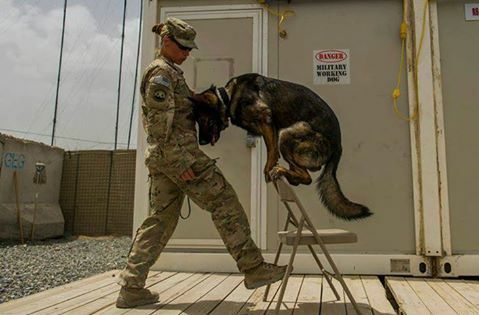 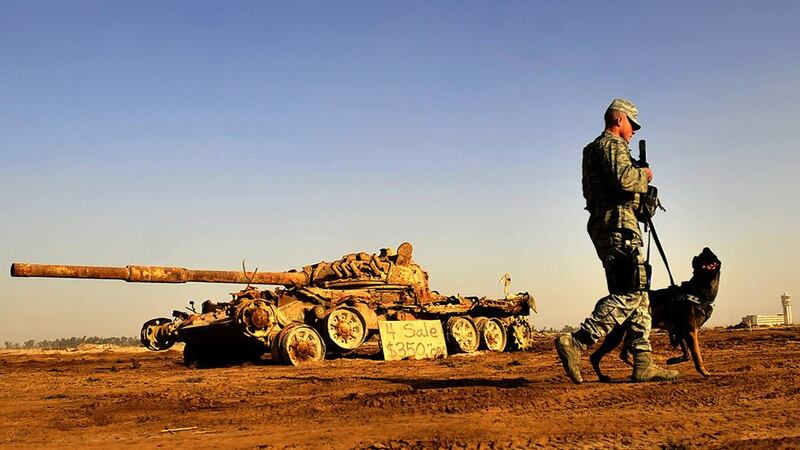 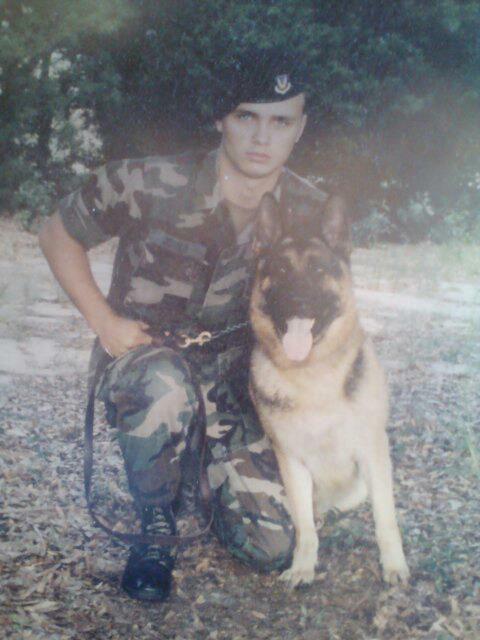 Military forces have used trained dogs the world over since the first military units were organized. 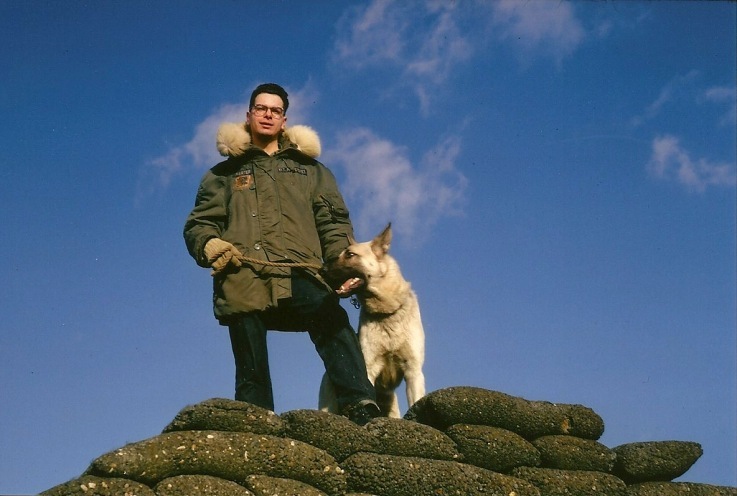 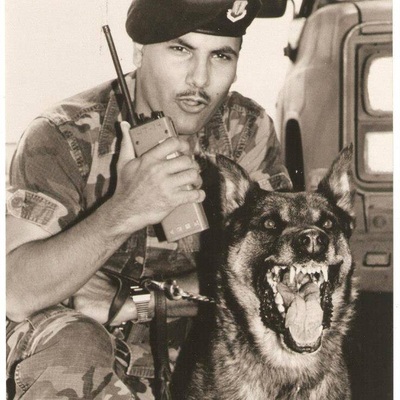 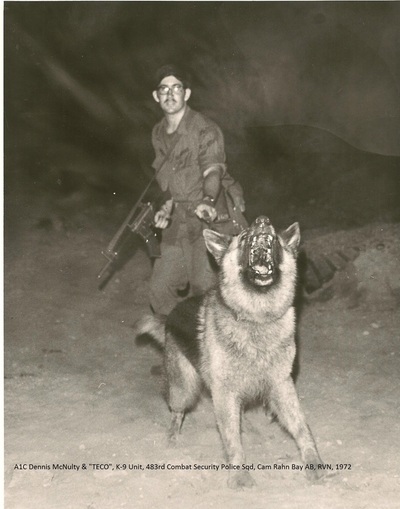 Canines were used in warfare throughout history supporting combat operations. 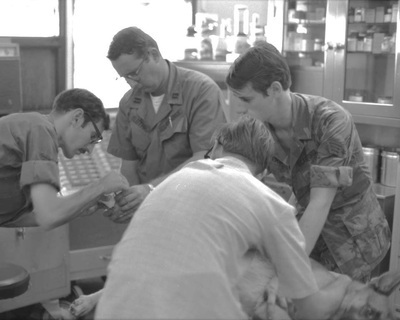 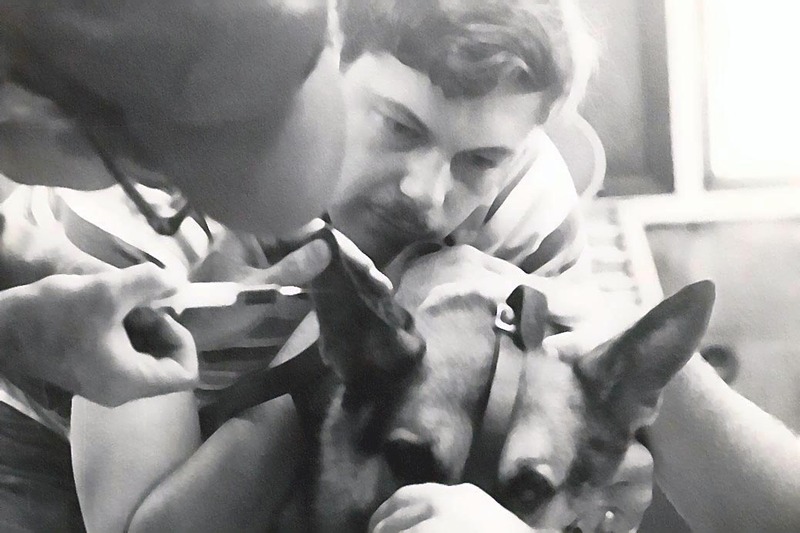 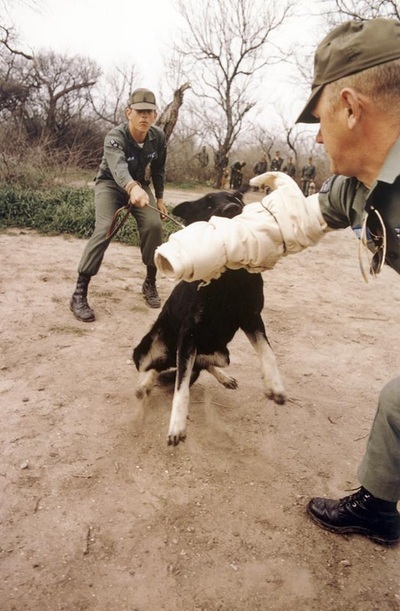 From these ancient beginnings, over 30,000 dogs have served in the US military in harm‘s way and are responsible for saving thousands of lives. 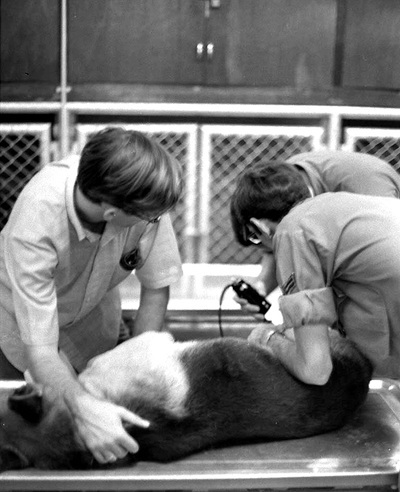 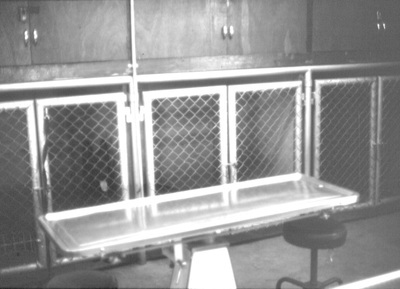 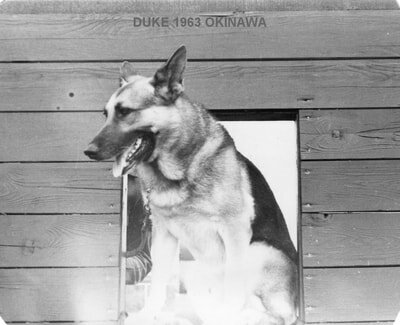 The United States did not make extensive use of dogs prior to 1942. 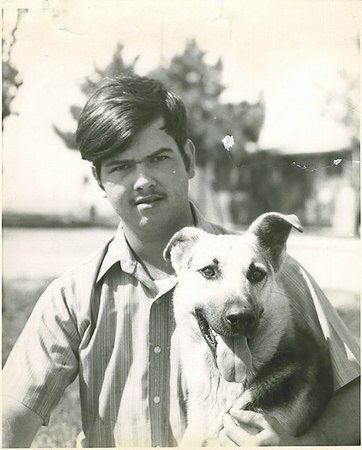 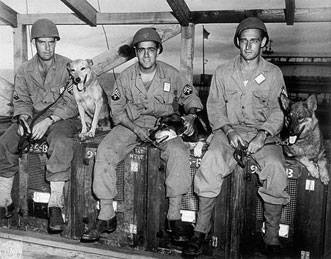 In early 1943, Mr. James M. Austin organized the War Dog program and by that July, more than 11,000 dogs had been procured. 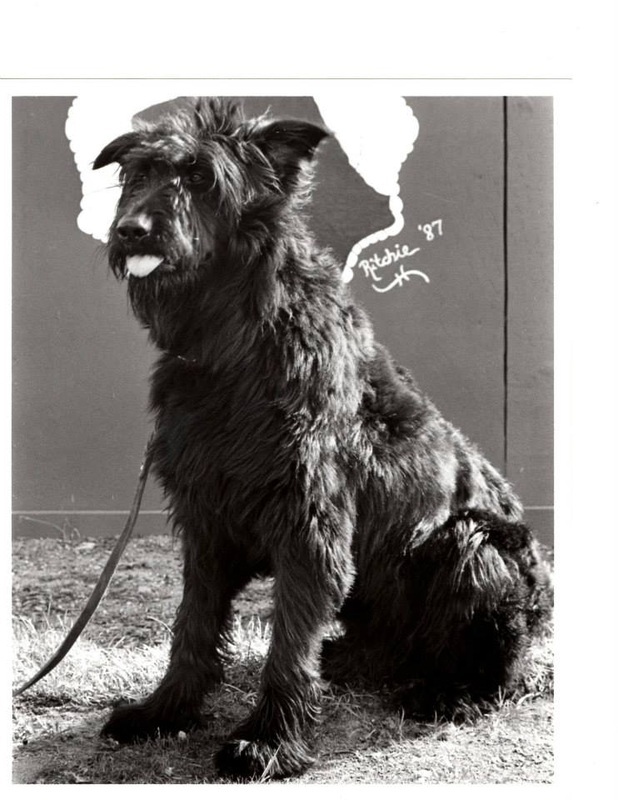 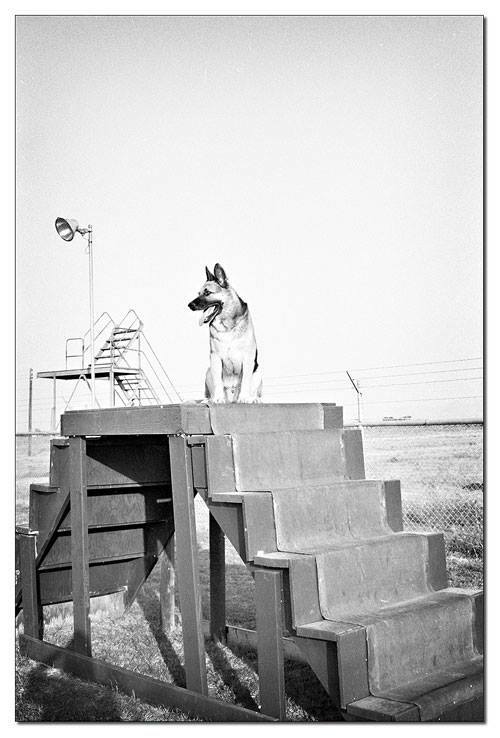 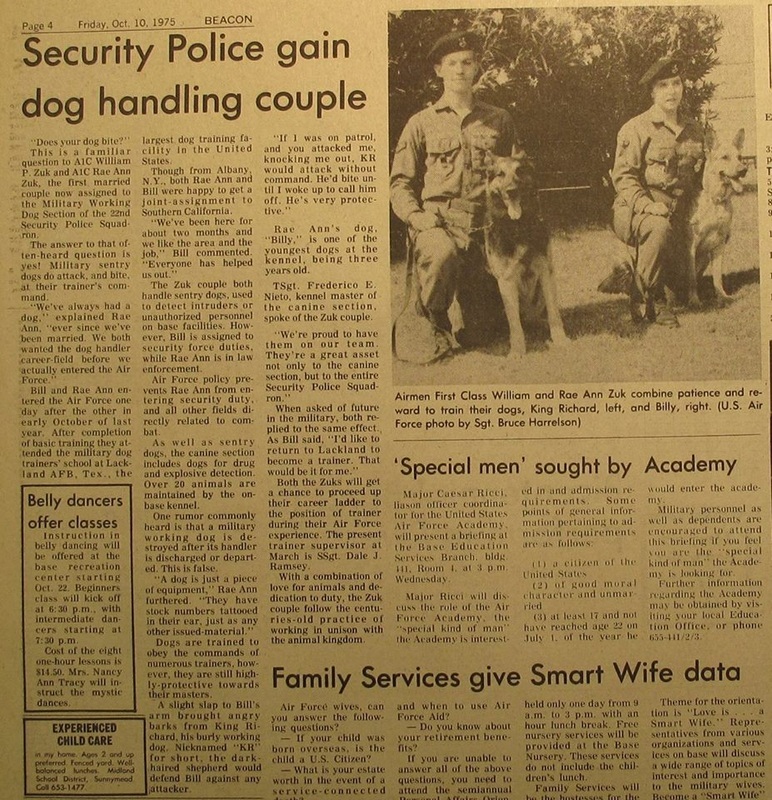 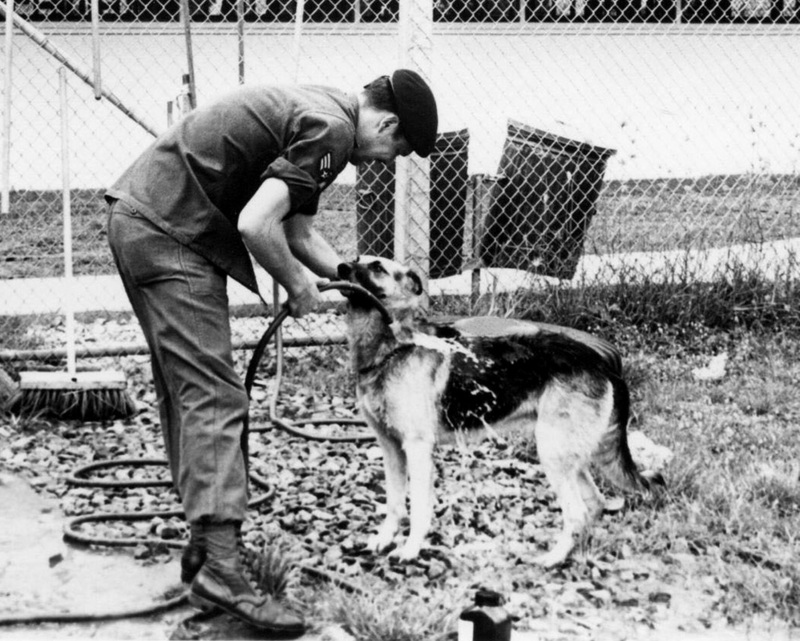 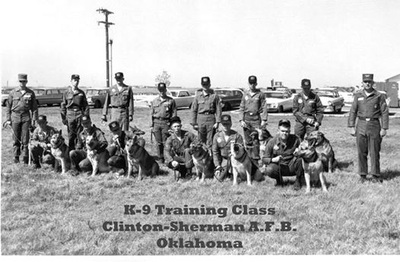 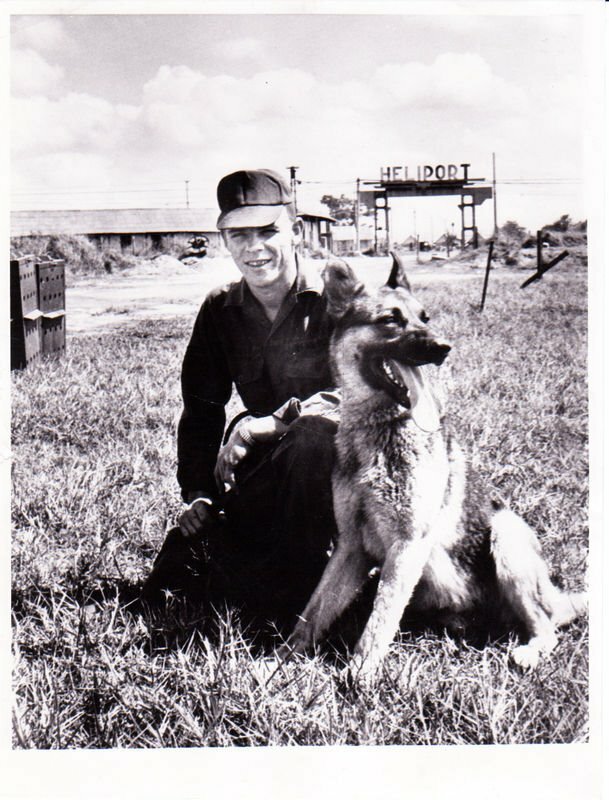 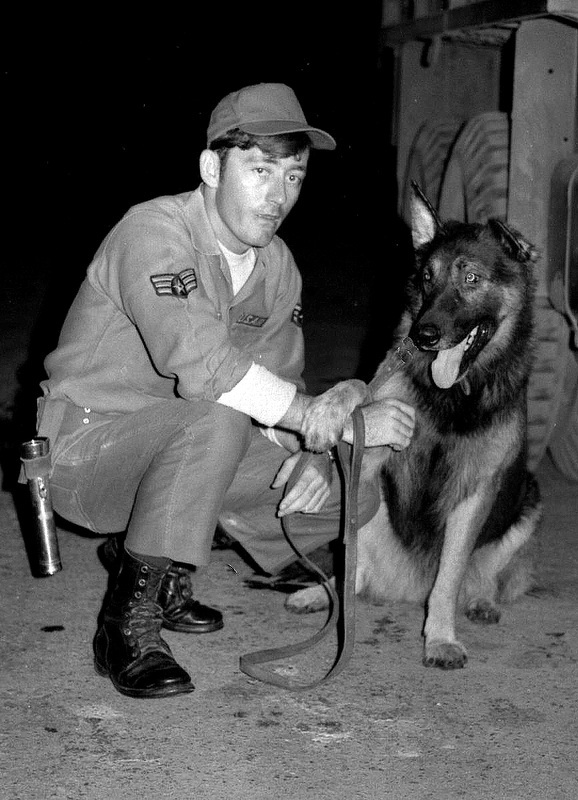 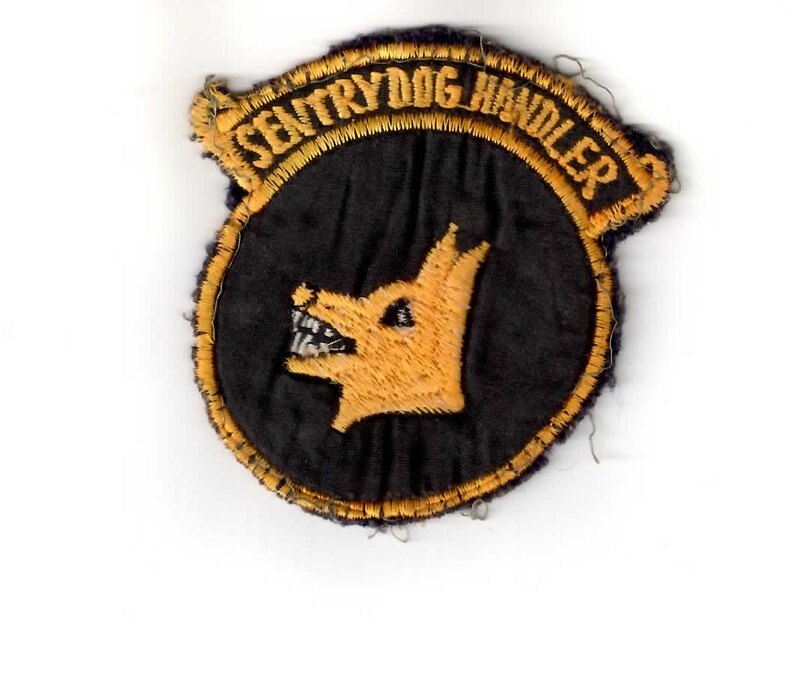 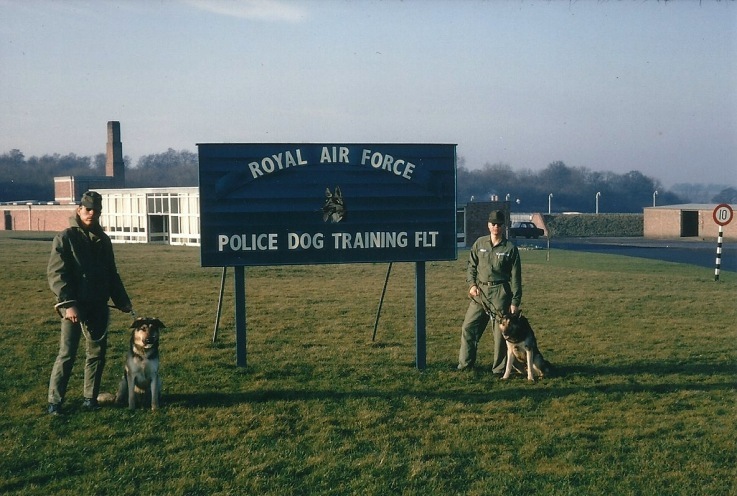 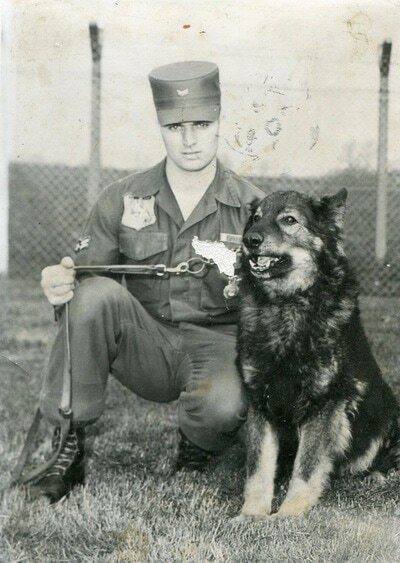 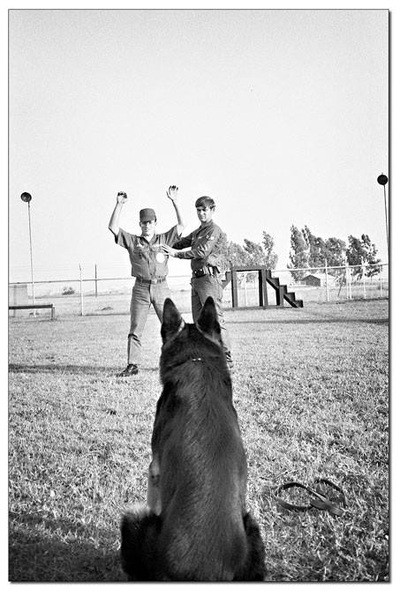 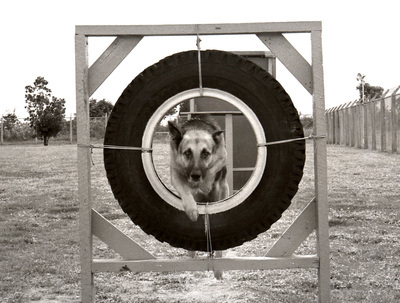 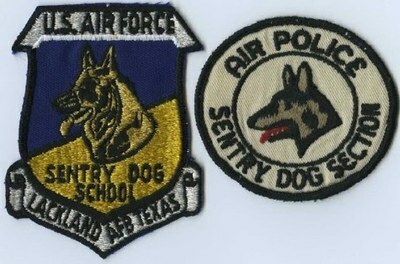 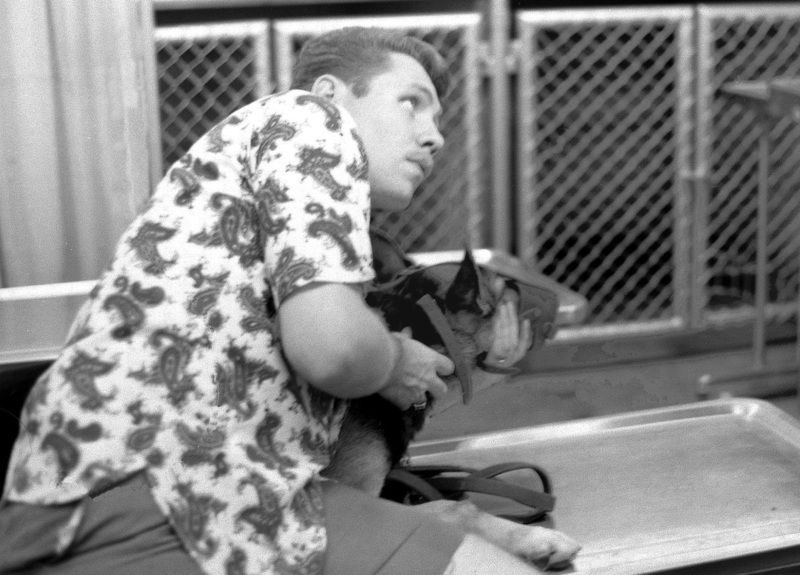 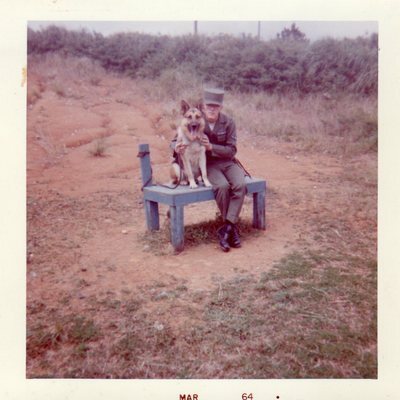 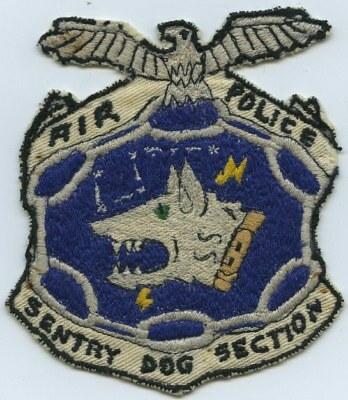 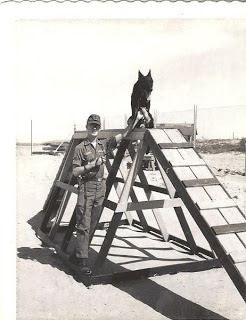 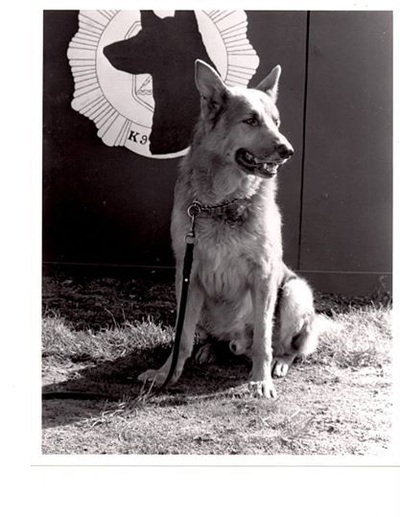 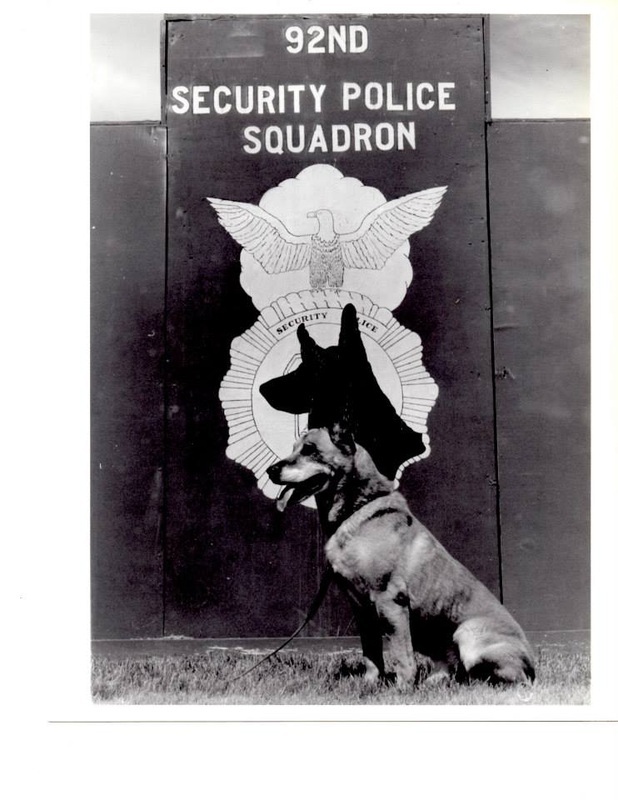 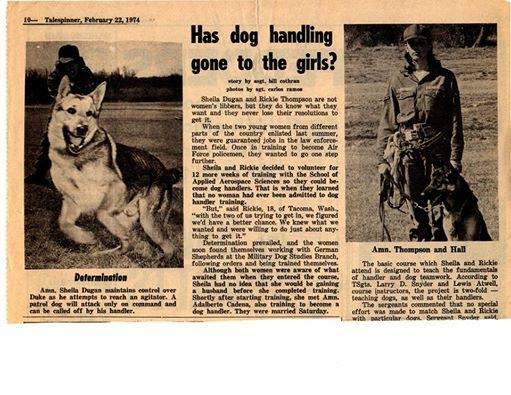 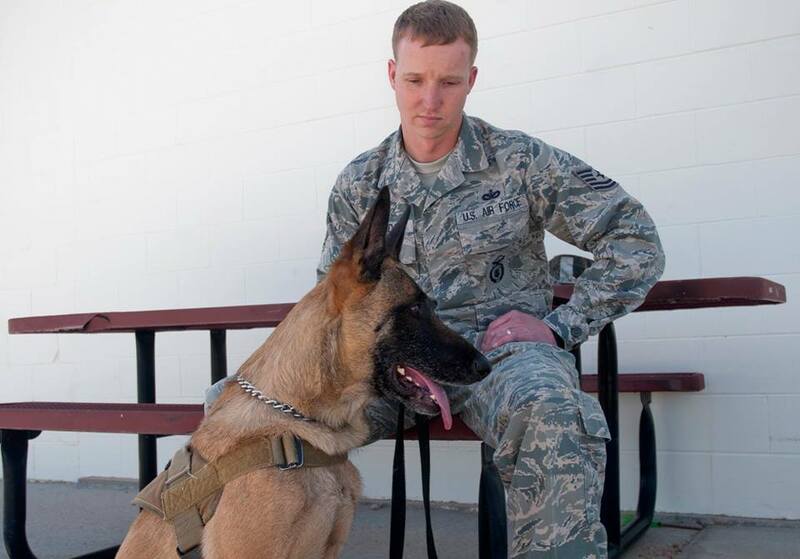 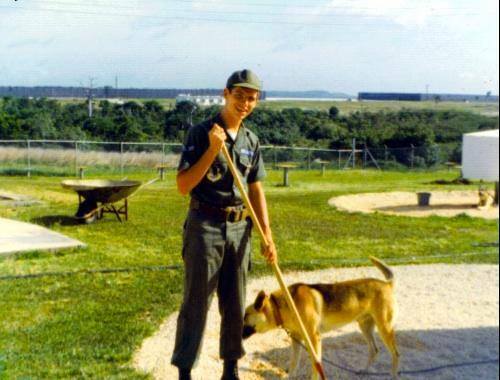 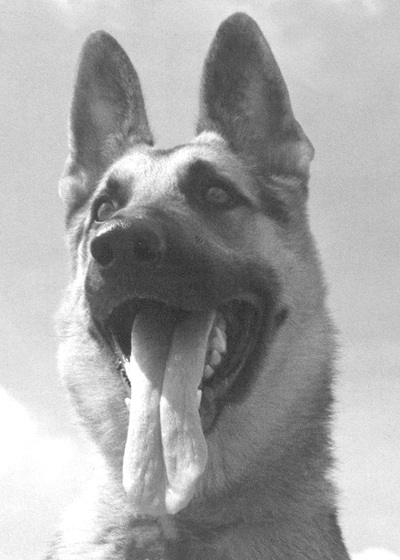 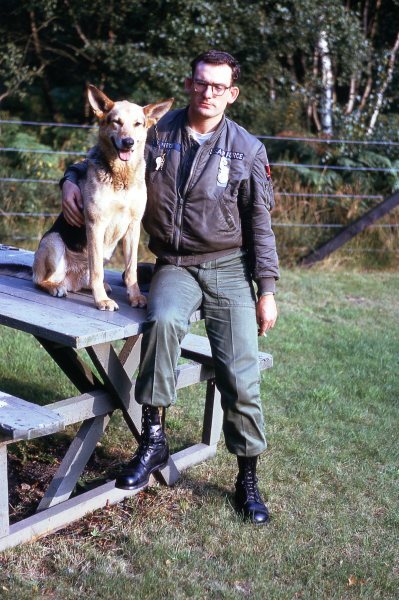 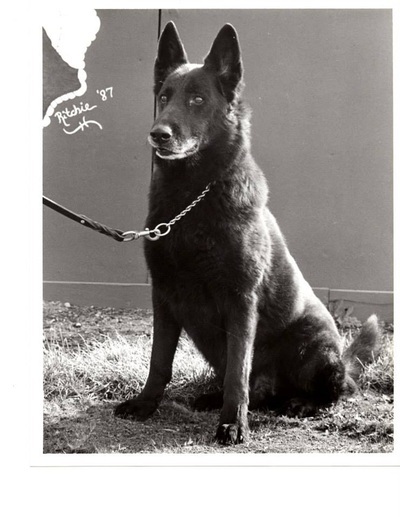 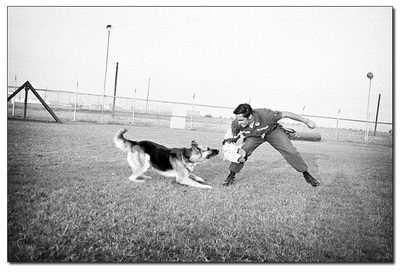 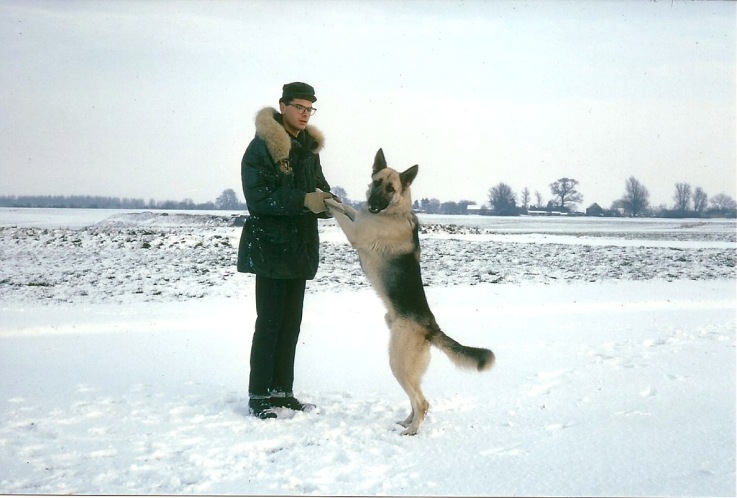 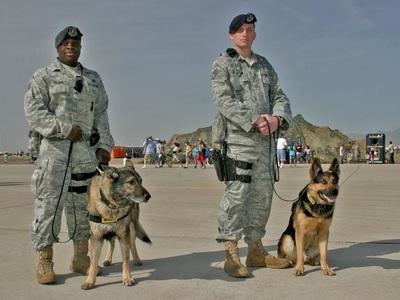 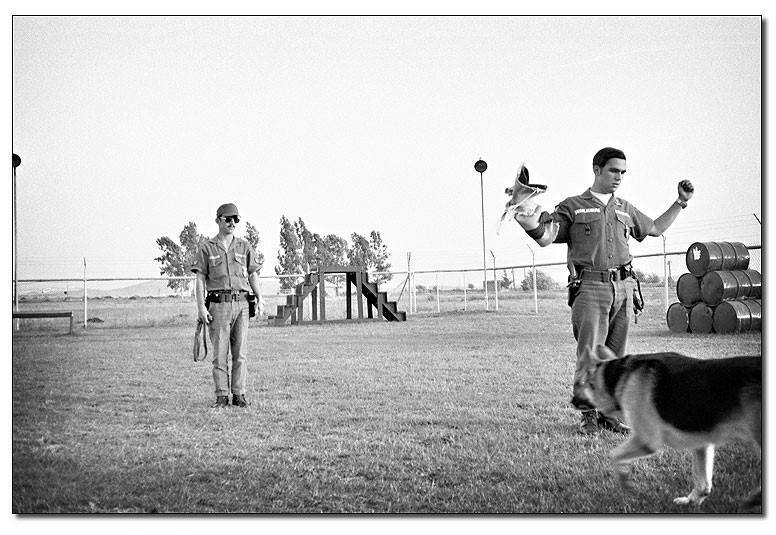 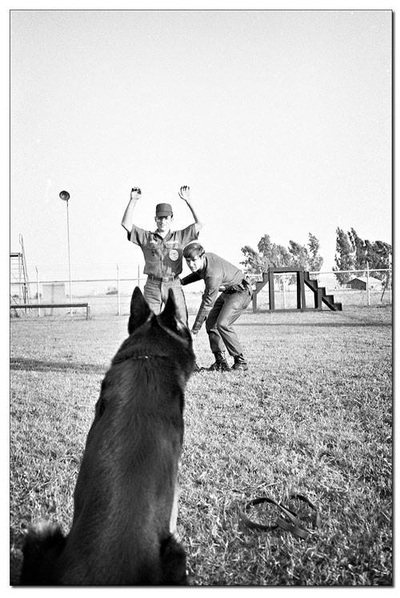 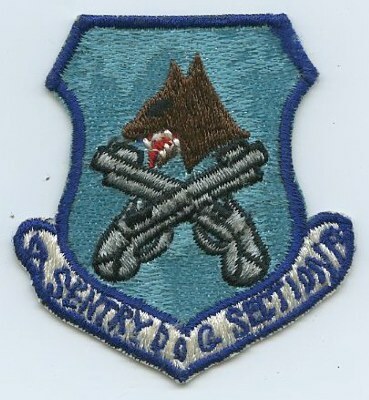 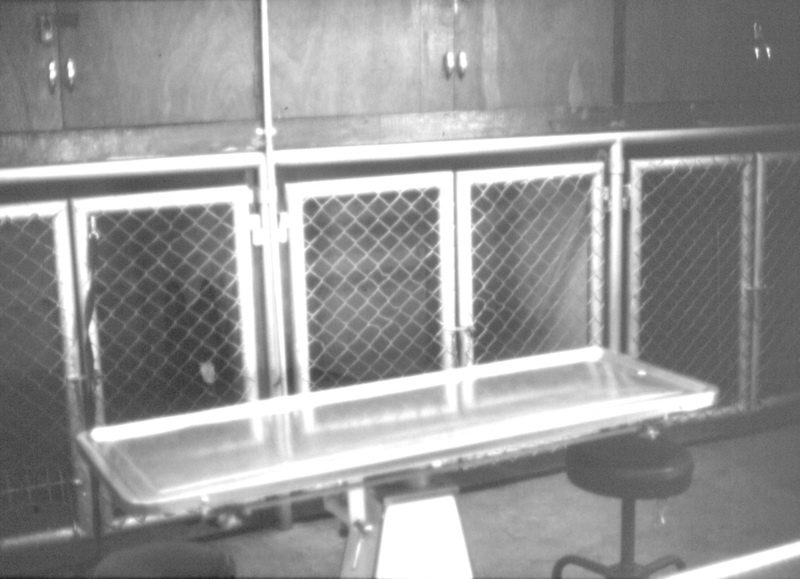 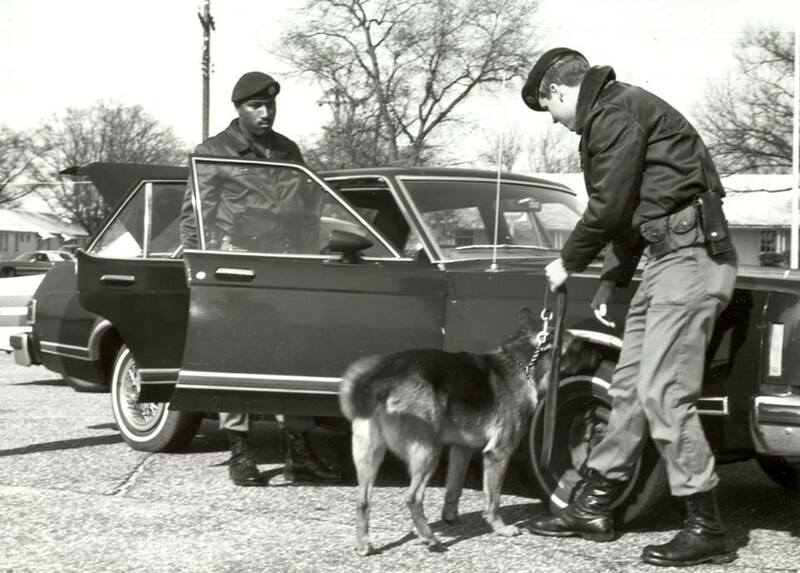 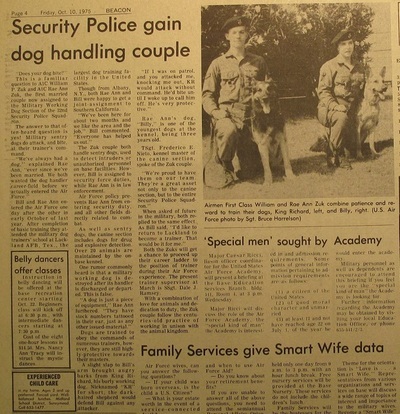 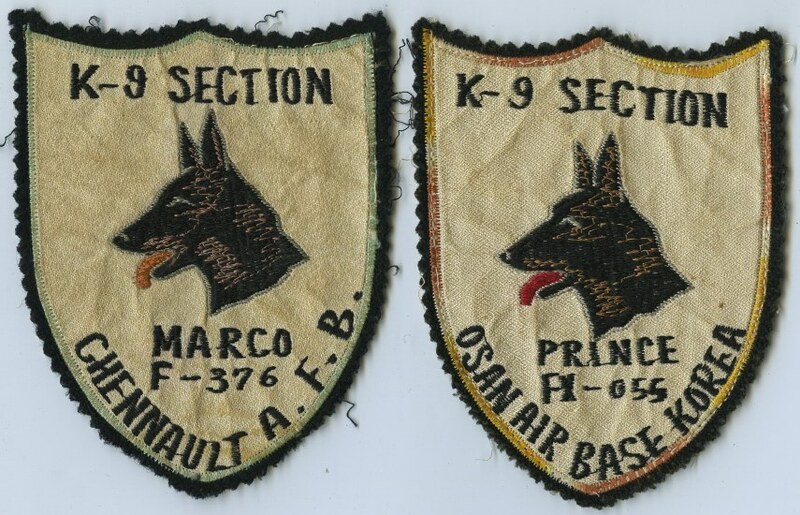 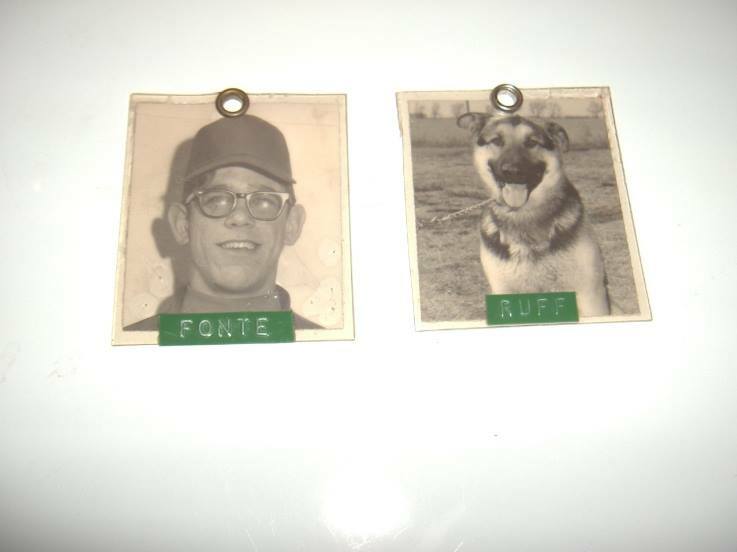 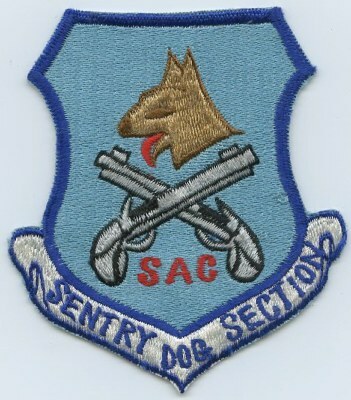 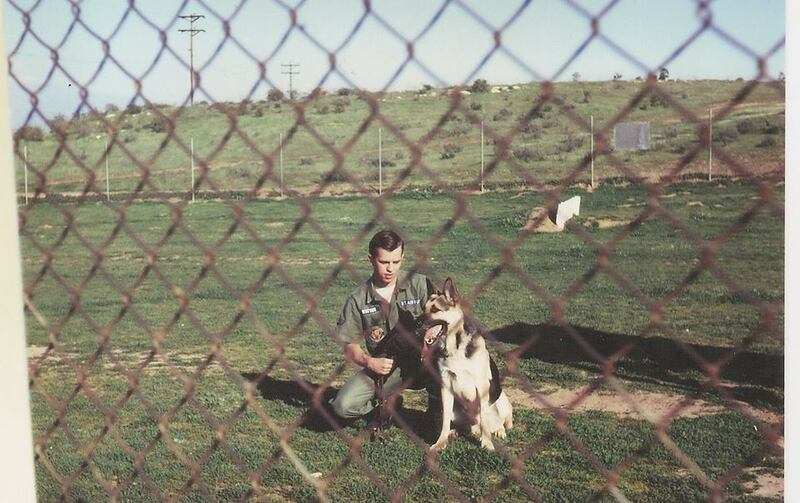 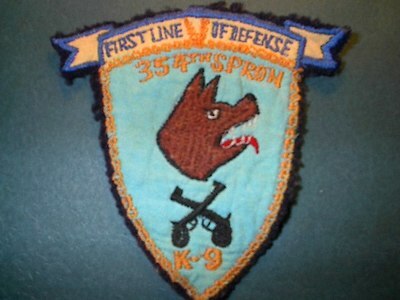 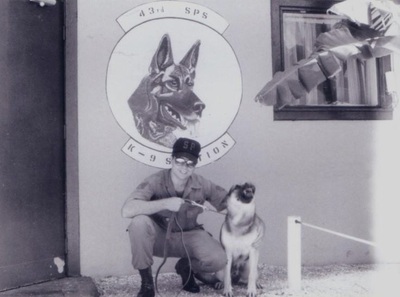 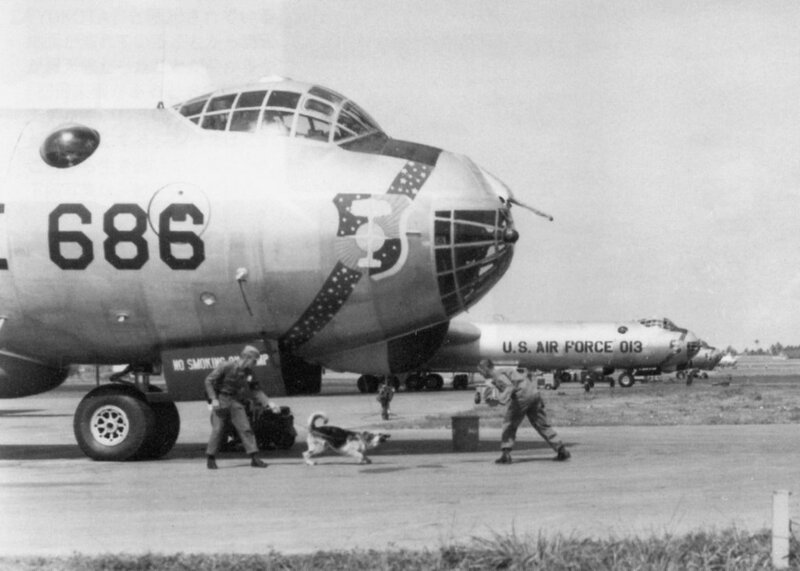 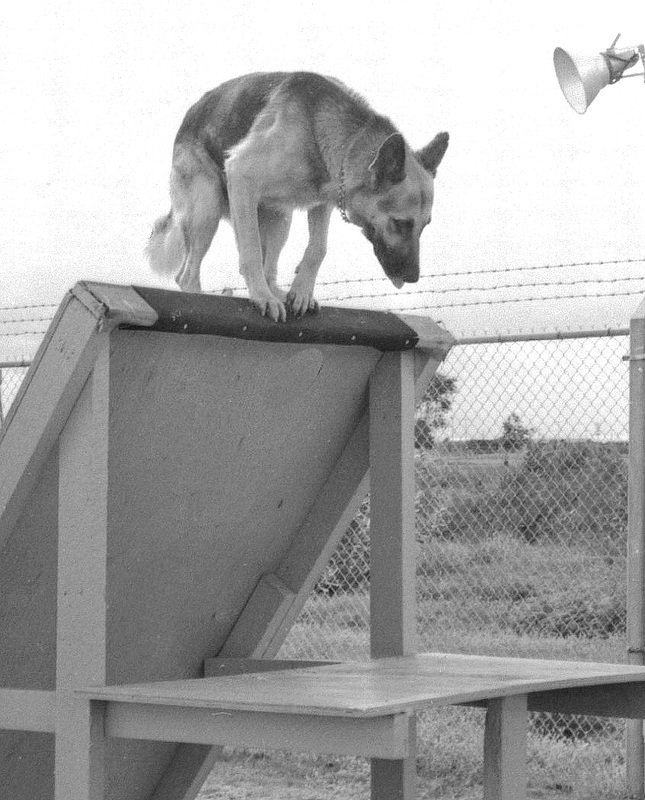 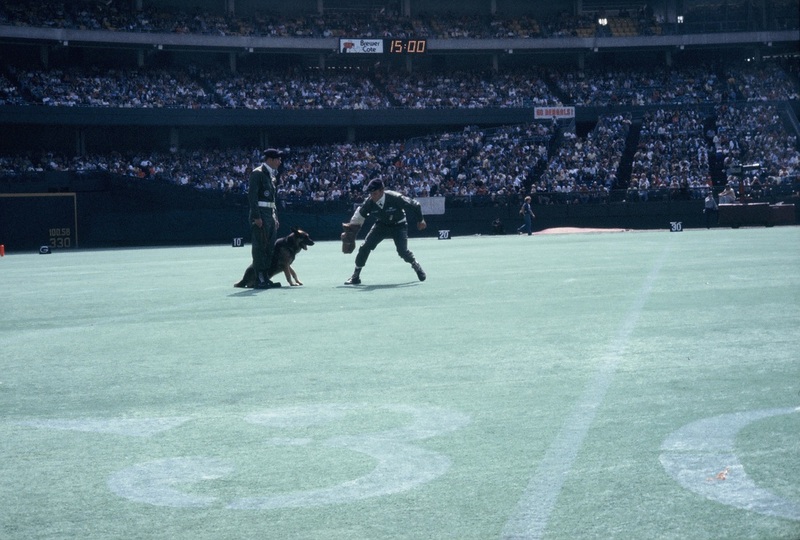 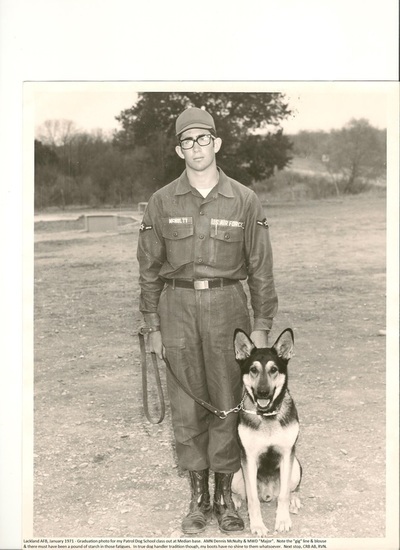 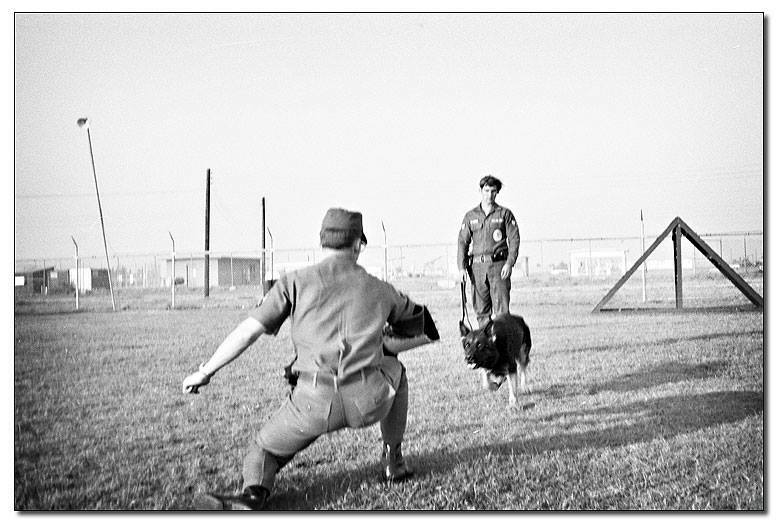 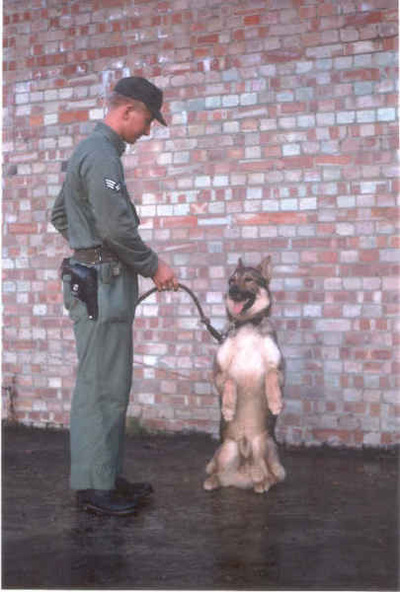 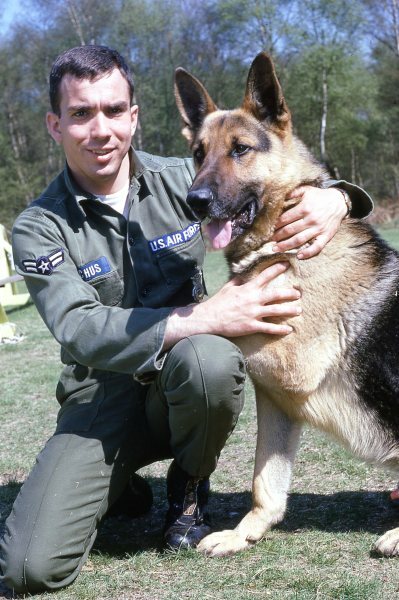 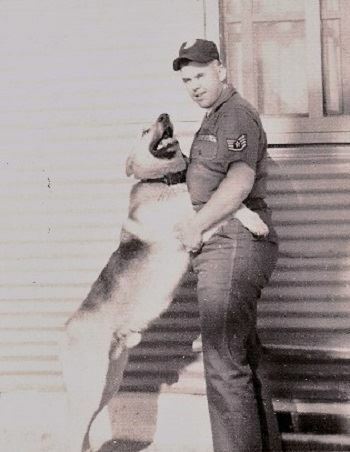 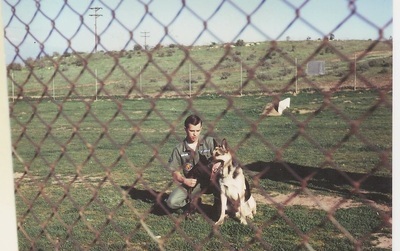 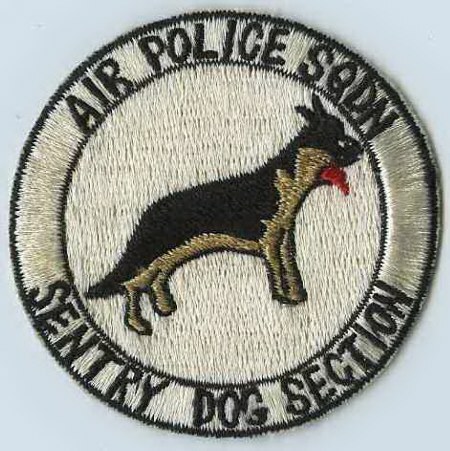 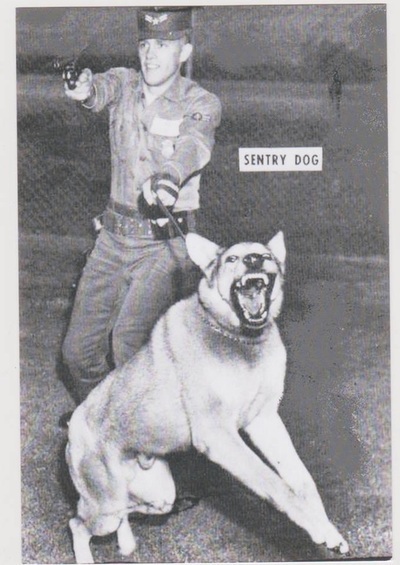 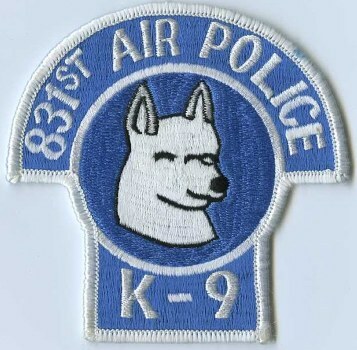 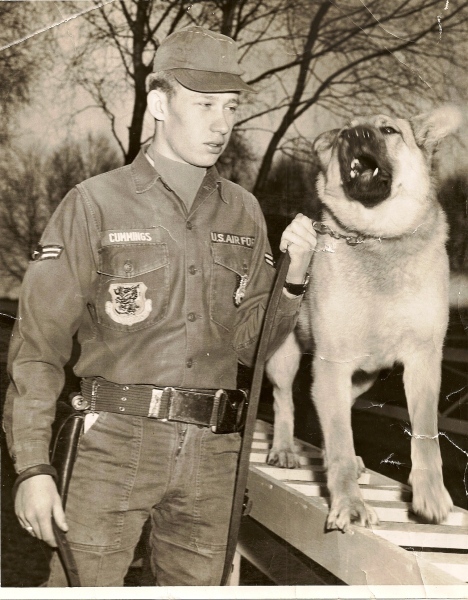 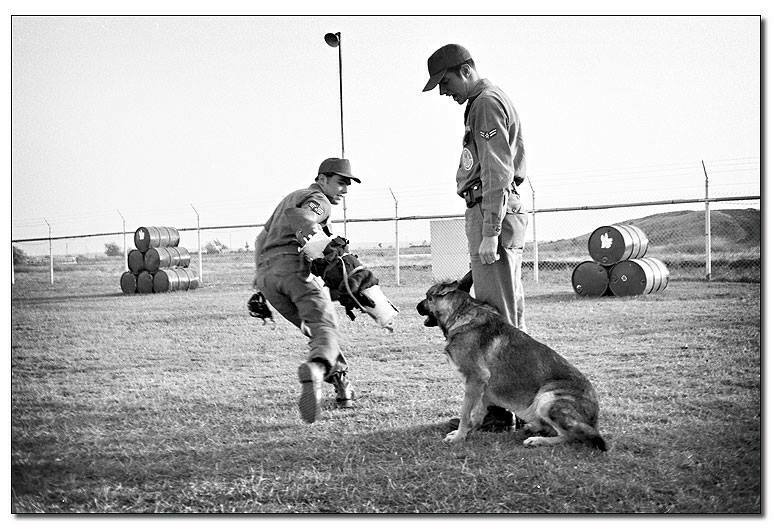 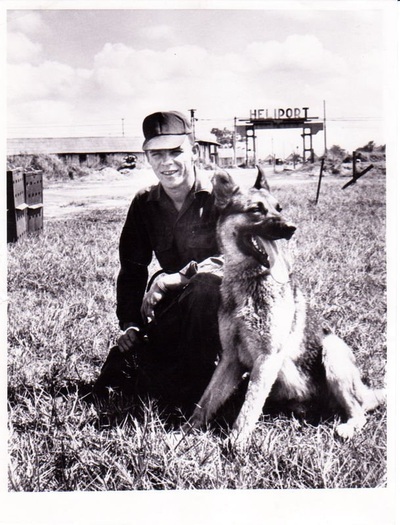 On May 1, 1957, the responsibility to train sentry dogs was taken over by the Air Force from the Army. 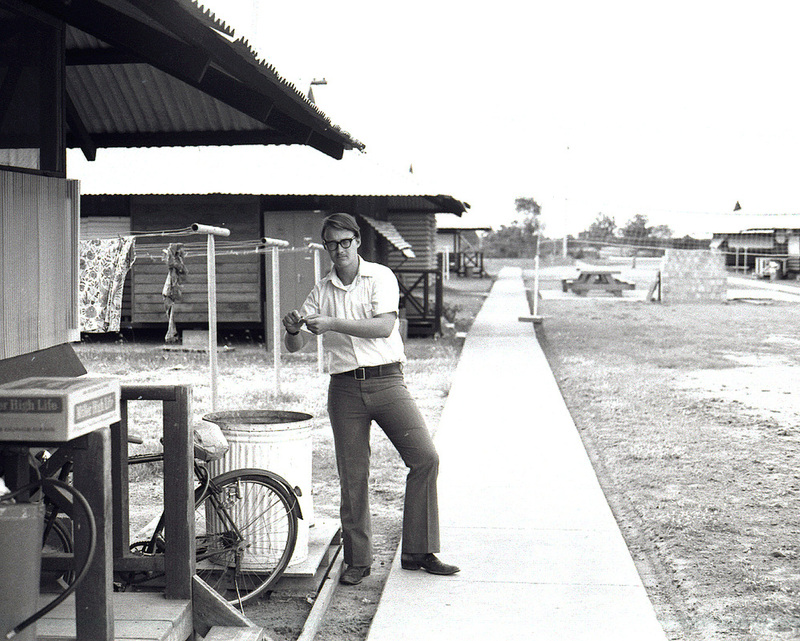 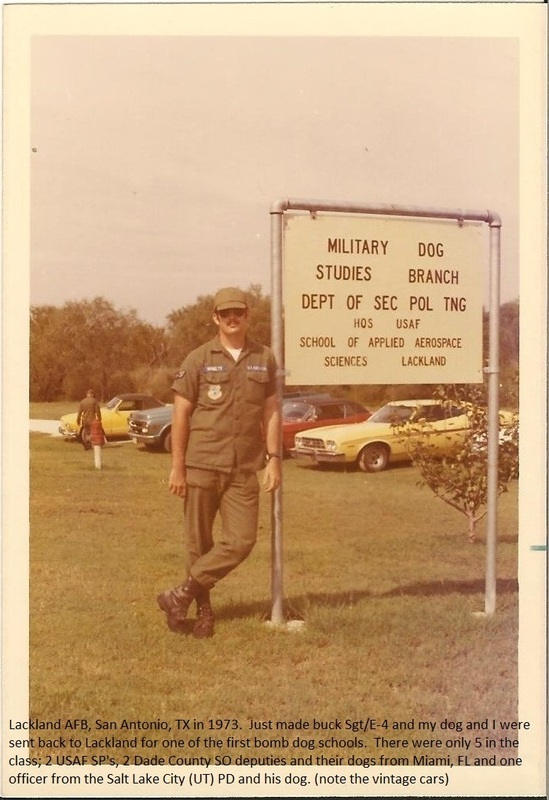 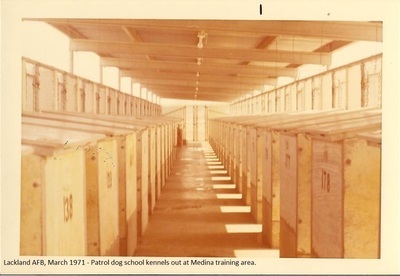 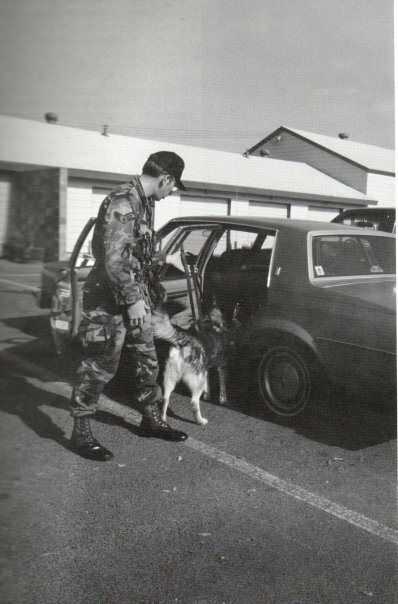 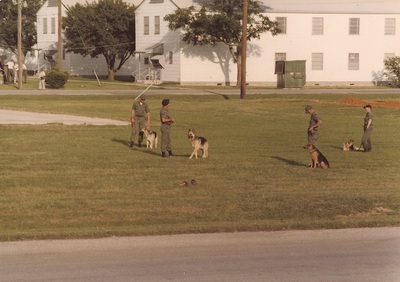 The first dog school was established at Lackland AFB, TX, where it remains to this day as the DoD Military Working Dog School. 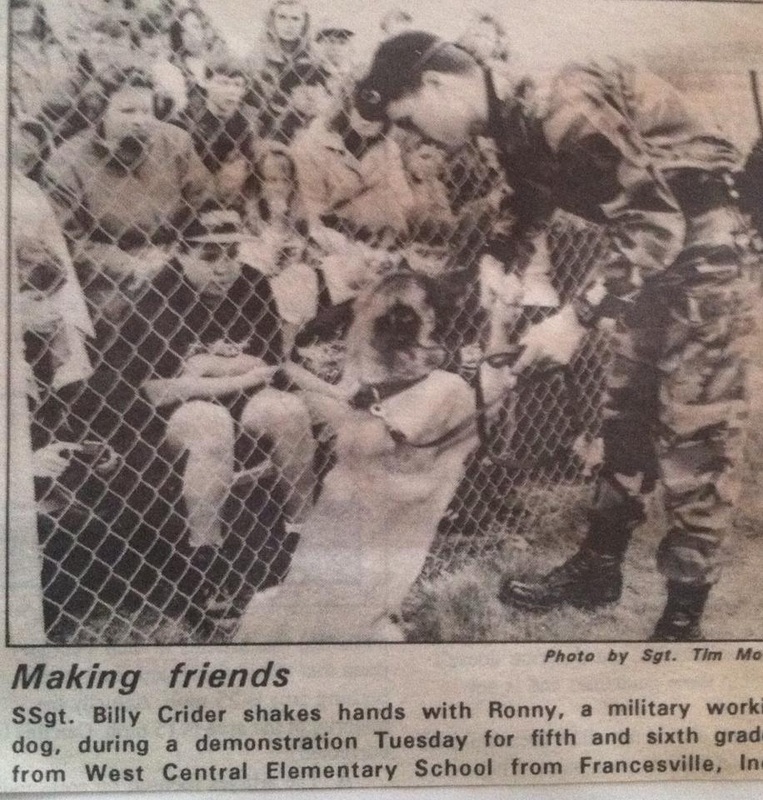 The school is responsible for procuring all dogs for the DoD and training dogs and handlers for all branches of the military. 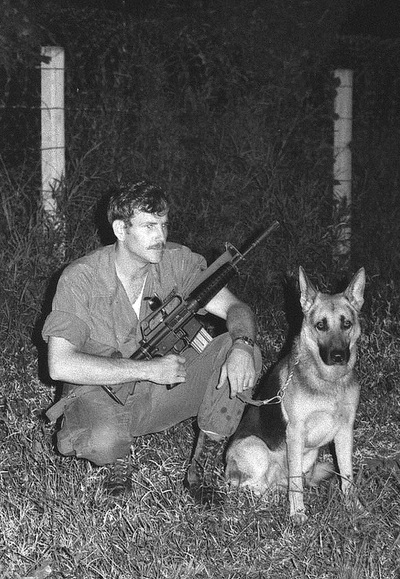 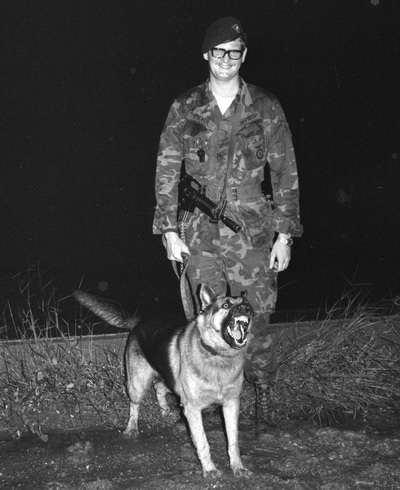 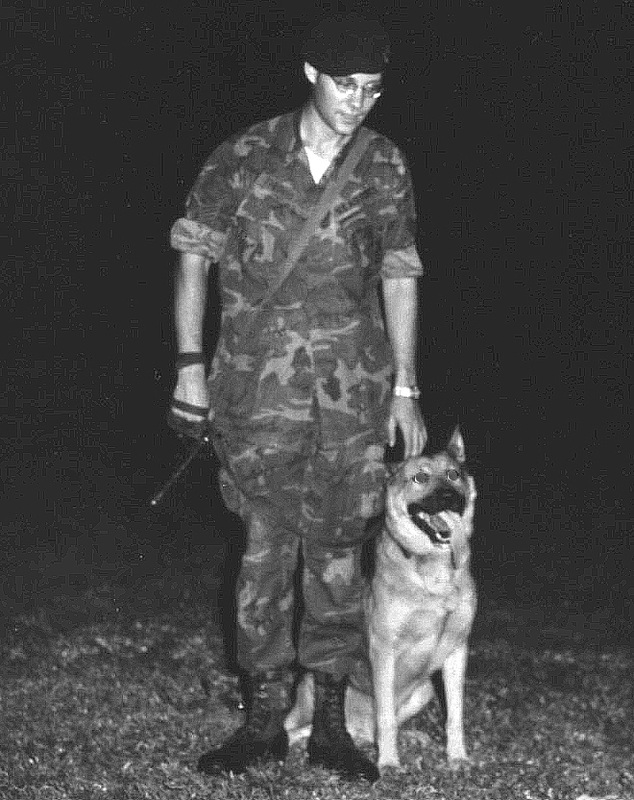 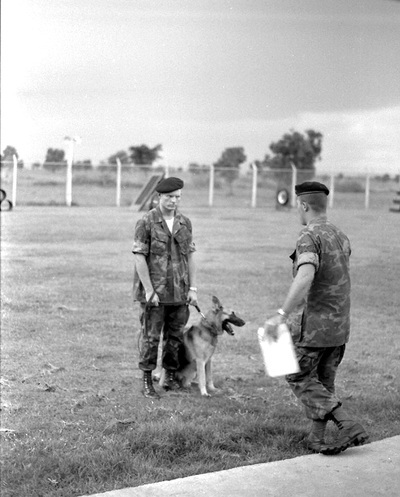 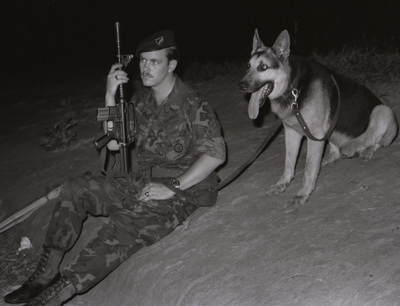 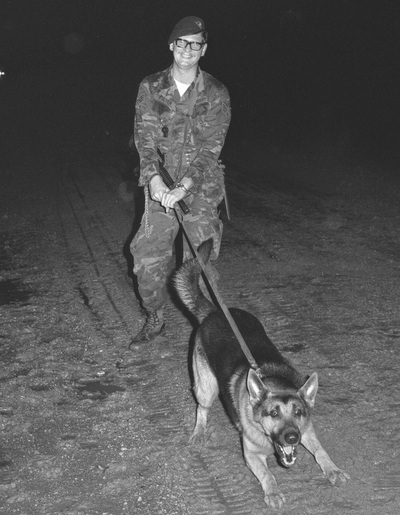 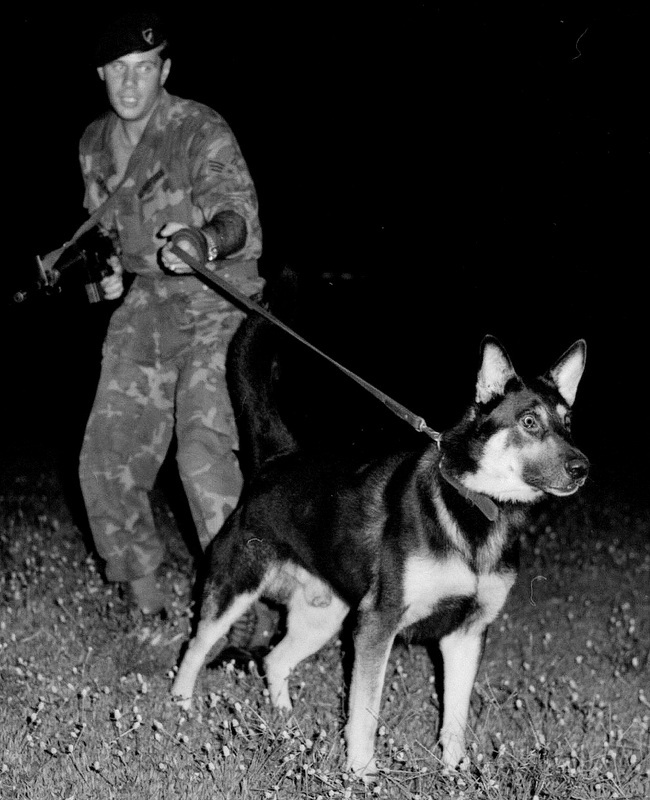 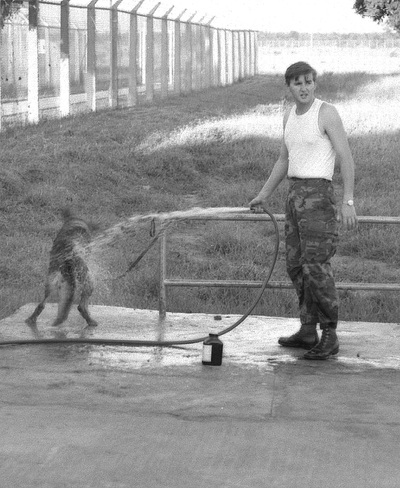 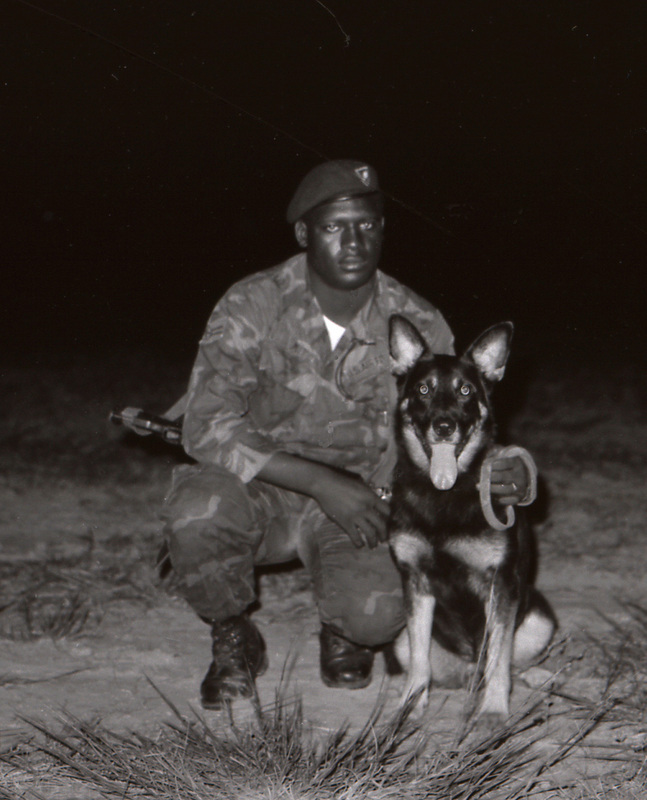 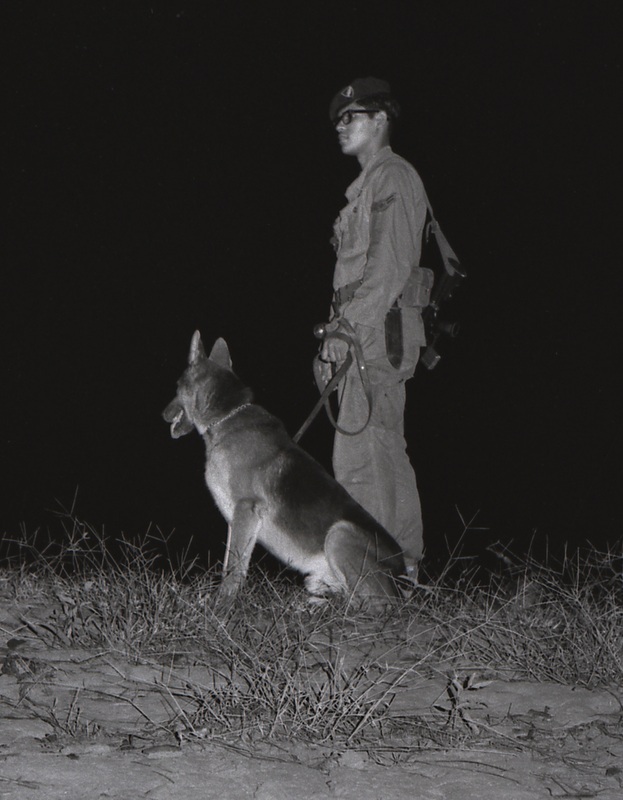 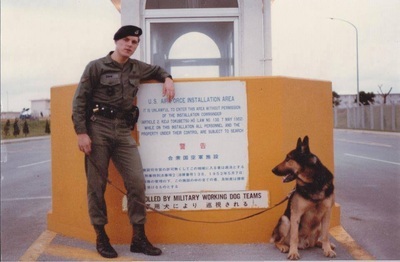 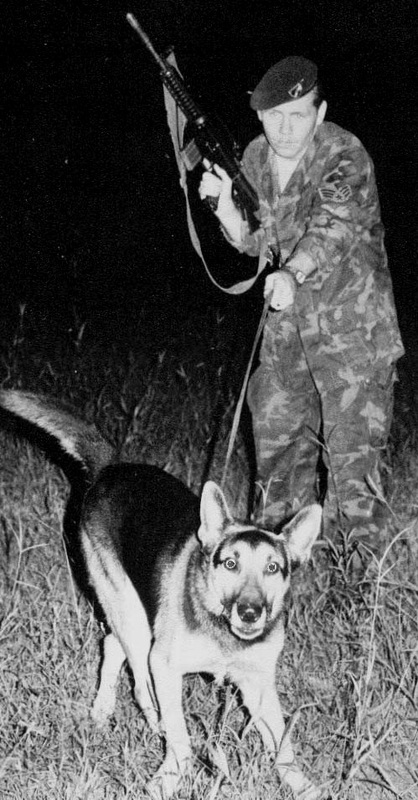 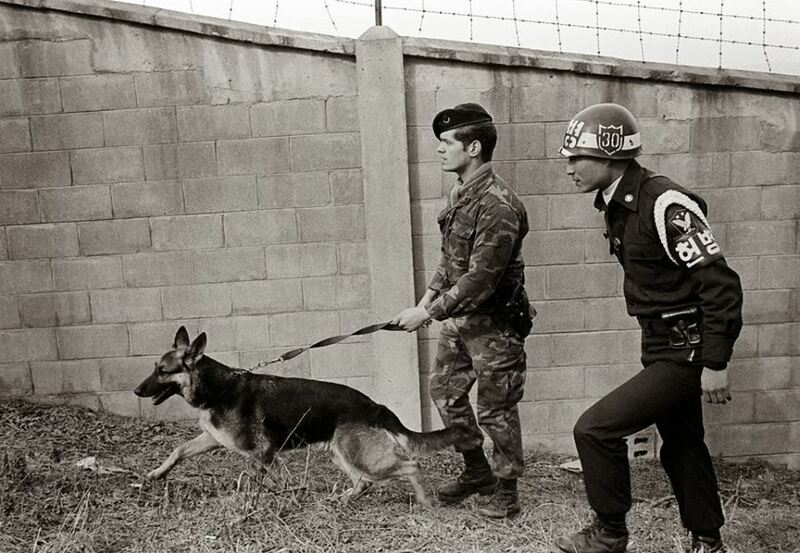 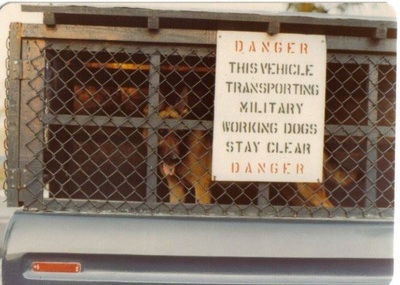 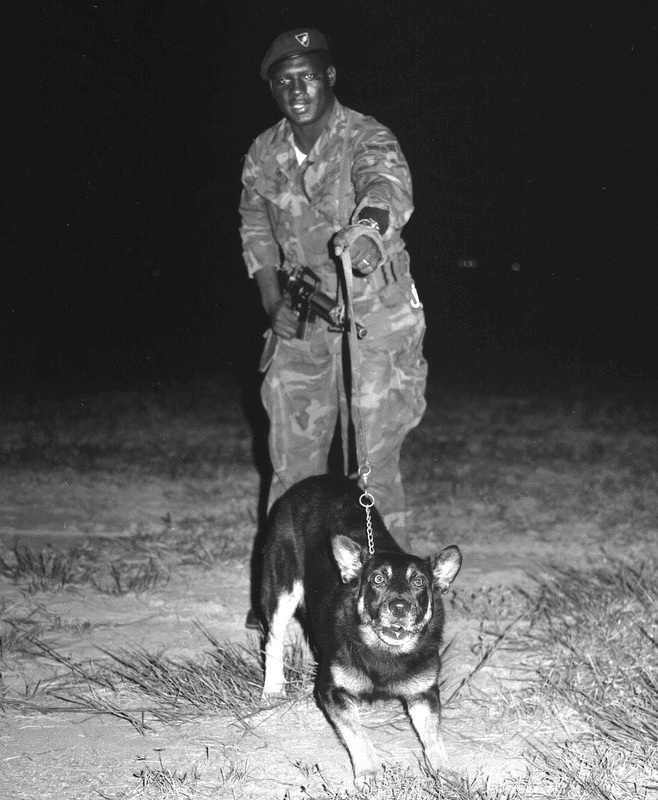 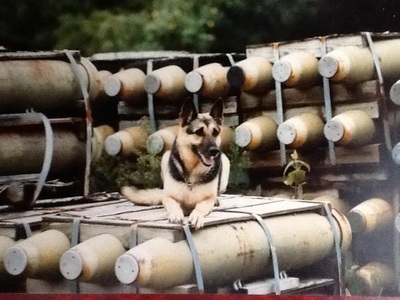 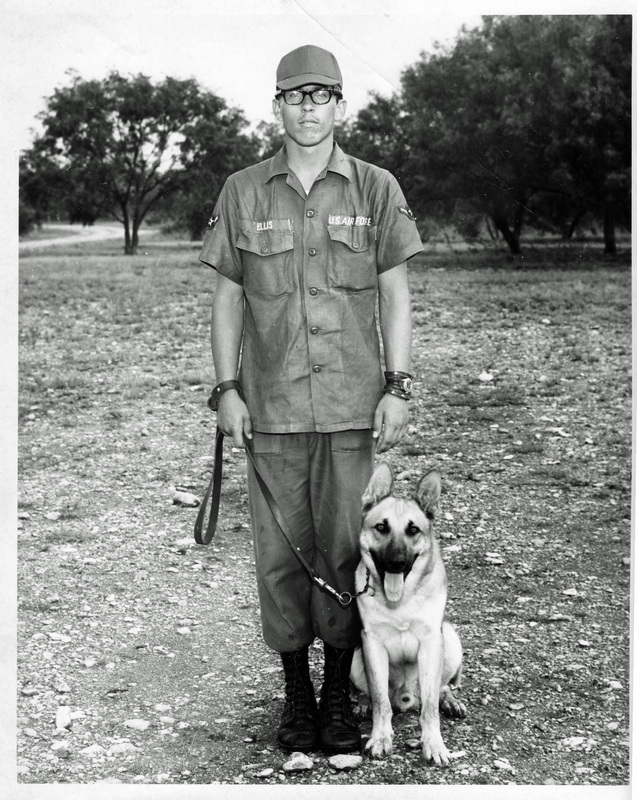 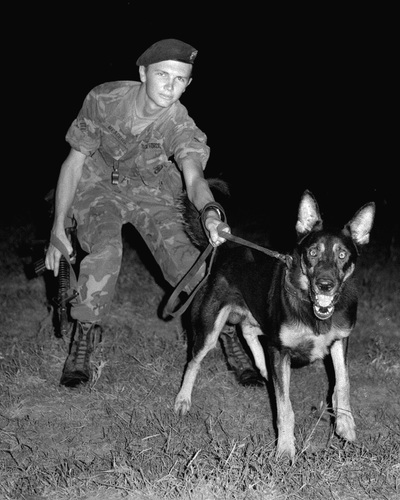 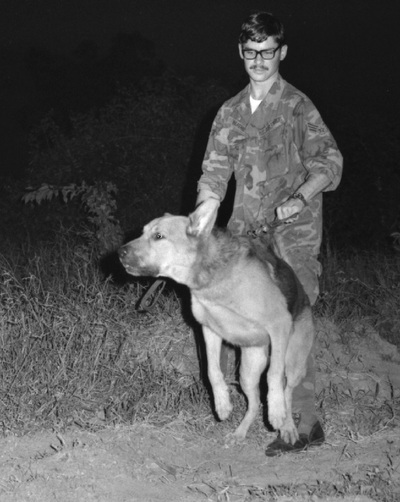 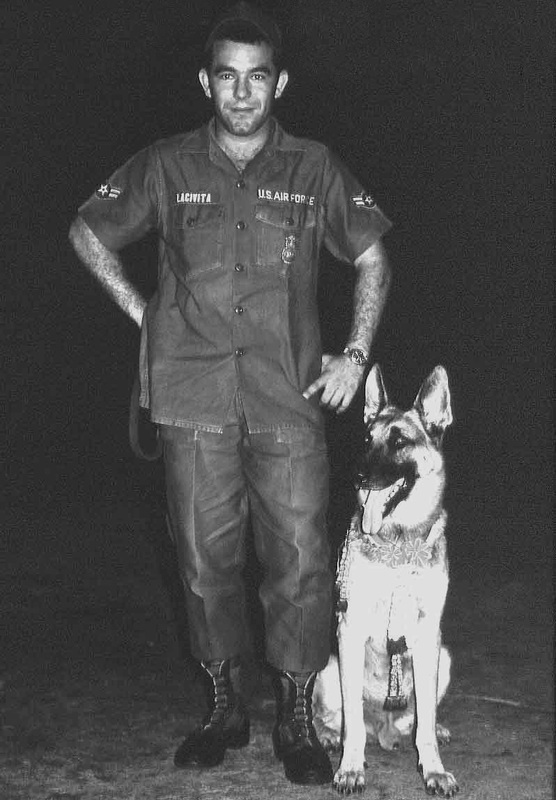 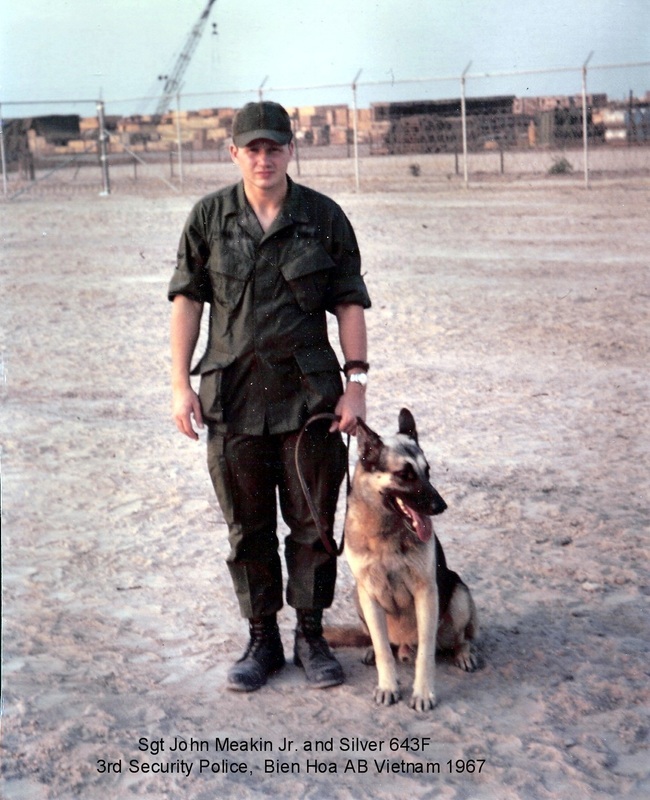 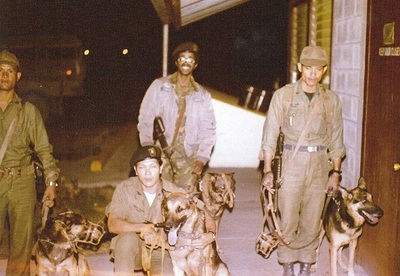 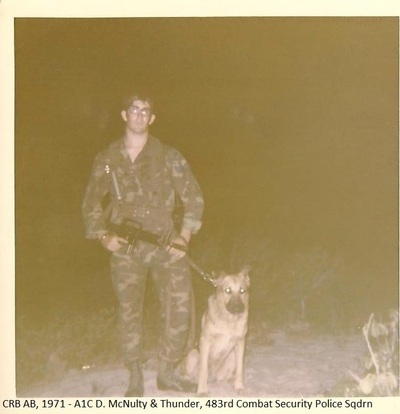 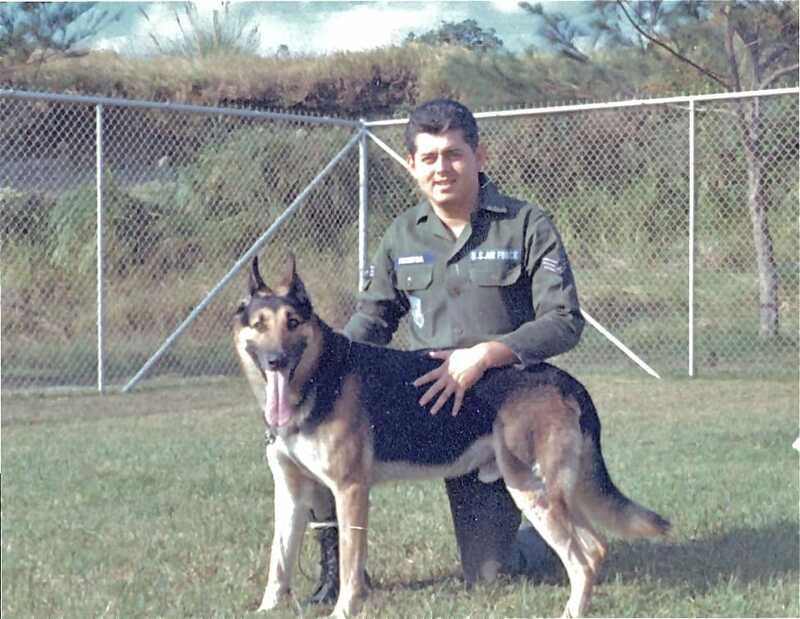 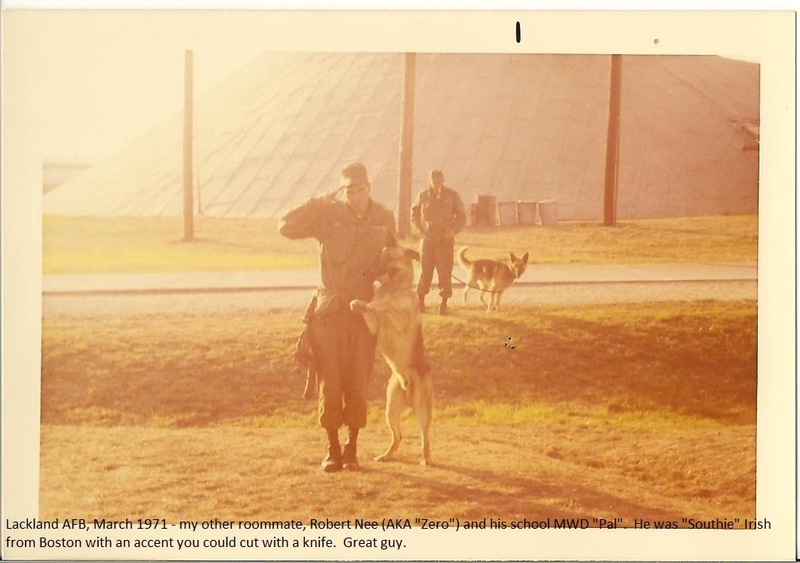 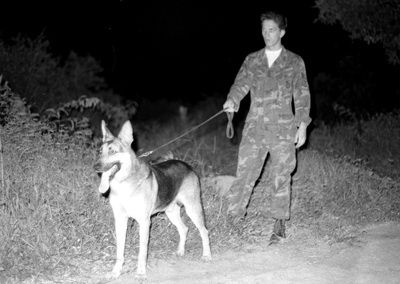 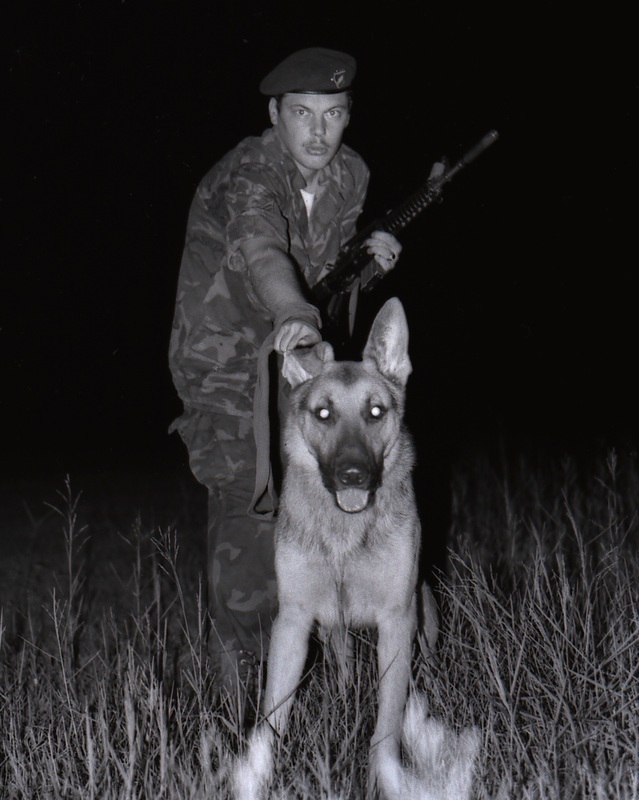 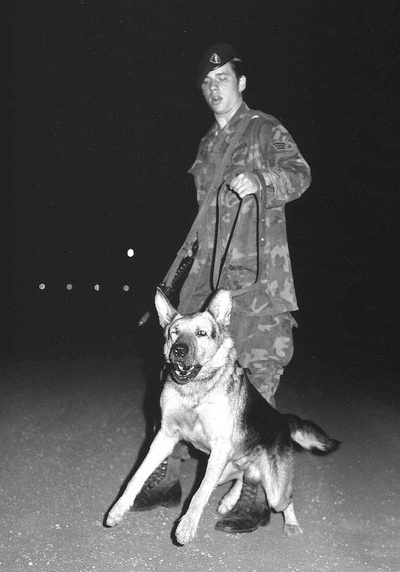 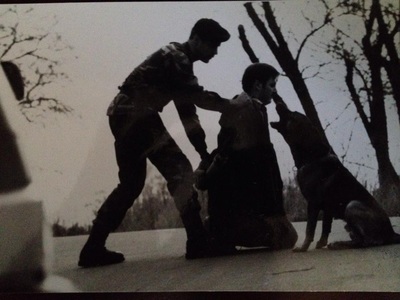 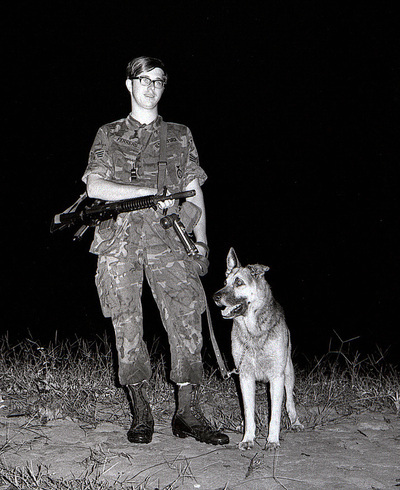 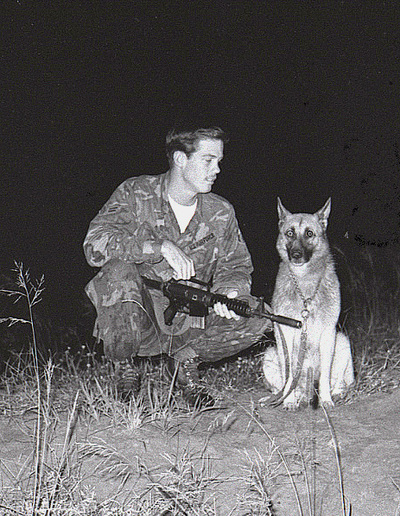 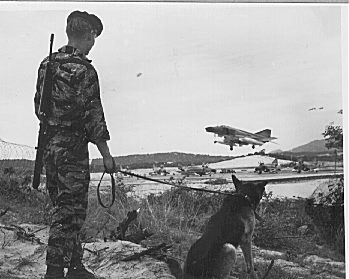 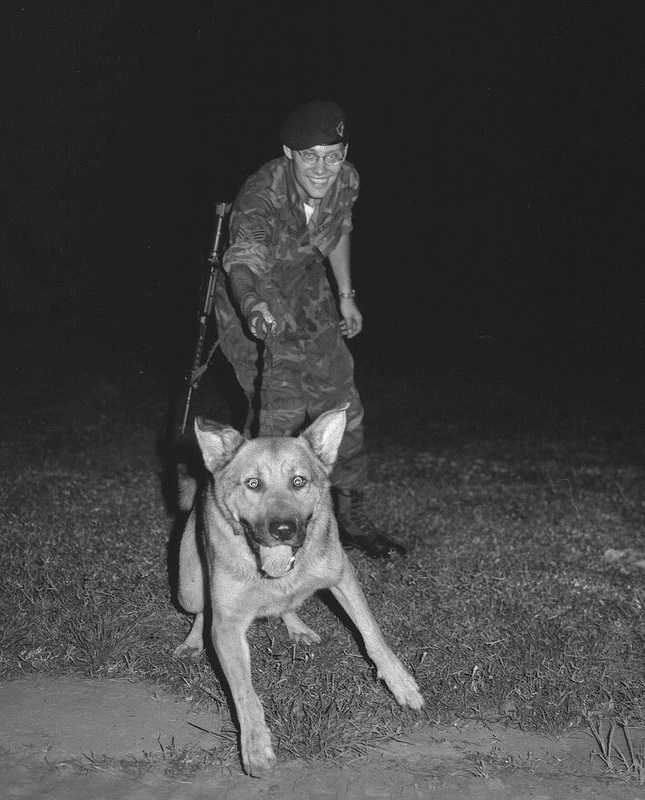 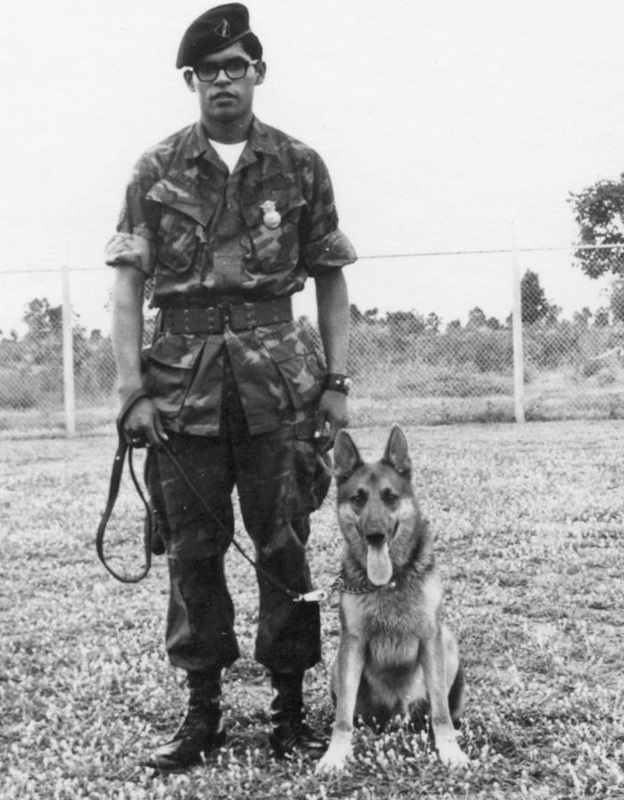 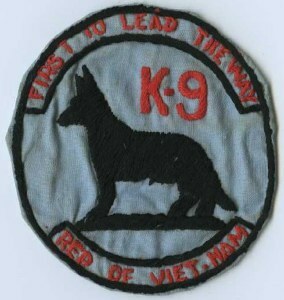 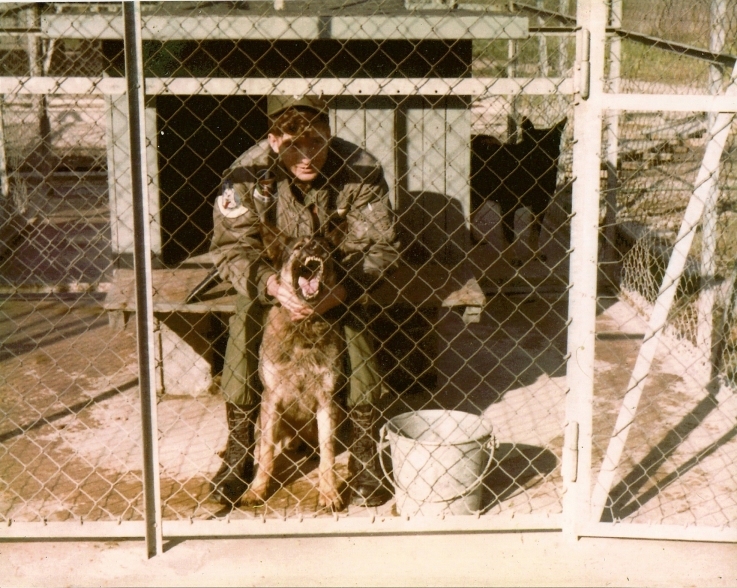 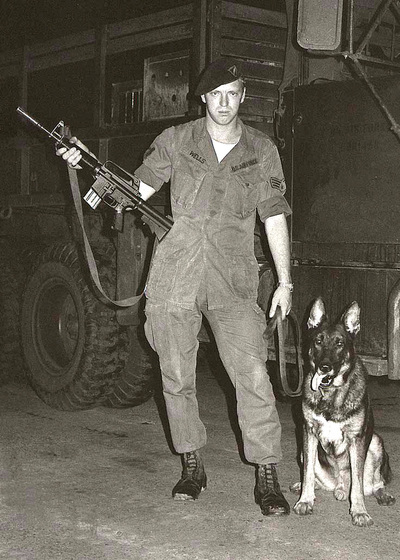 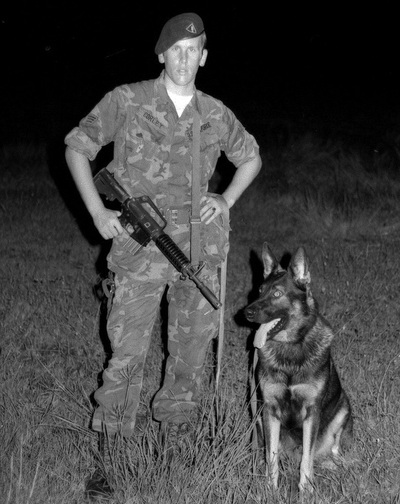 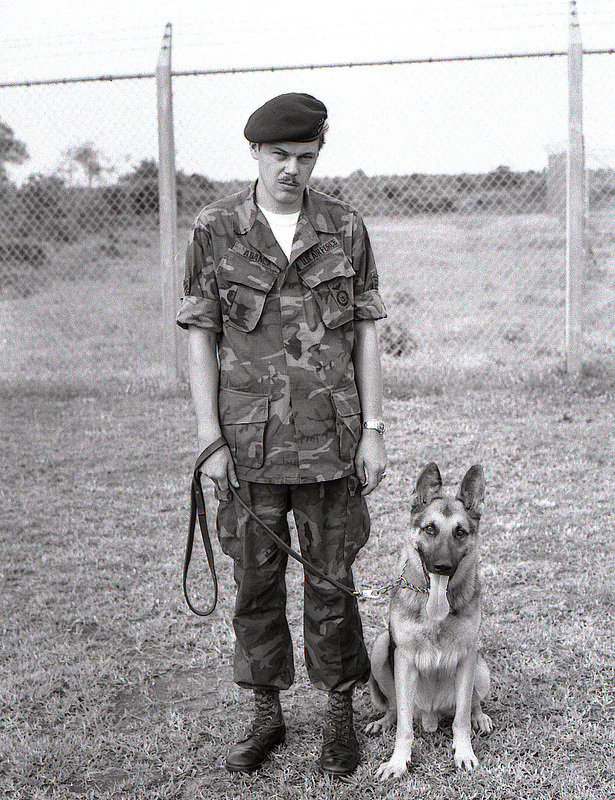 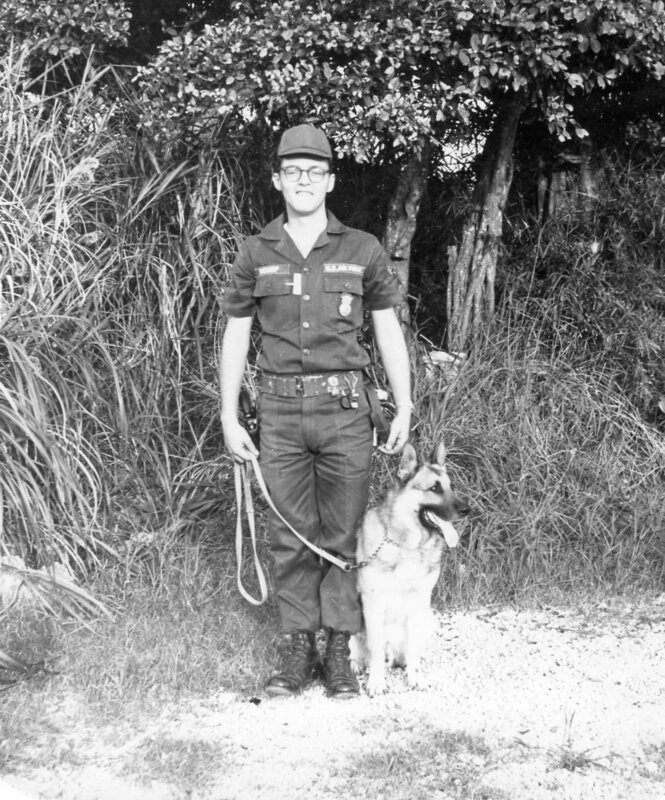 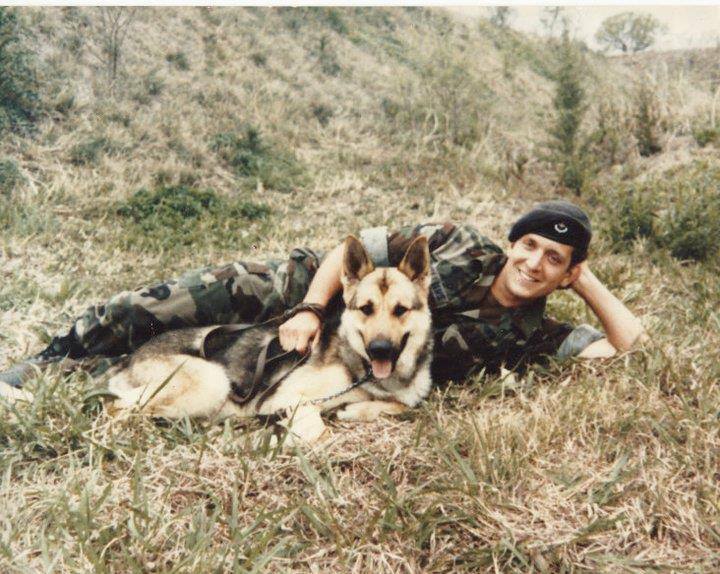 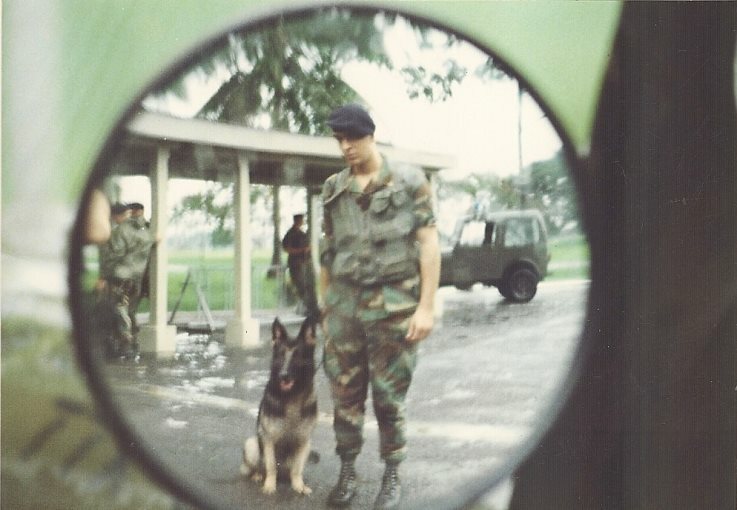 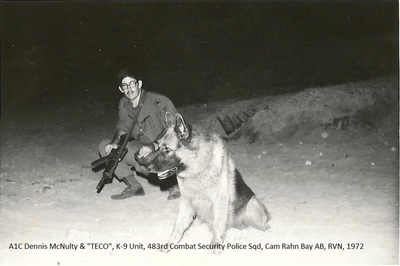 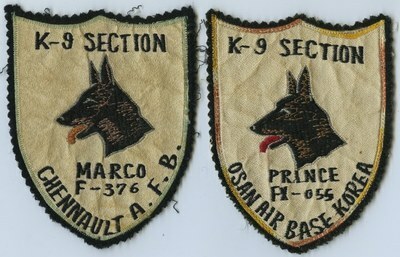 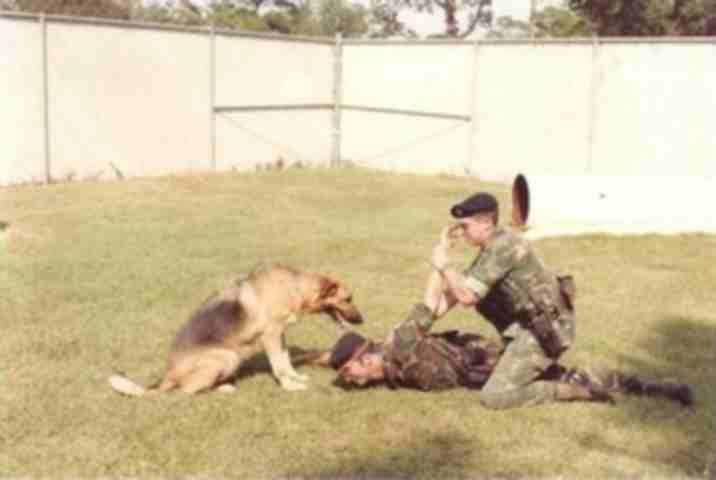 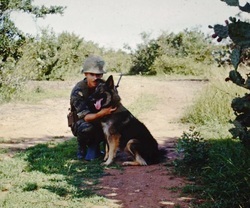 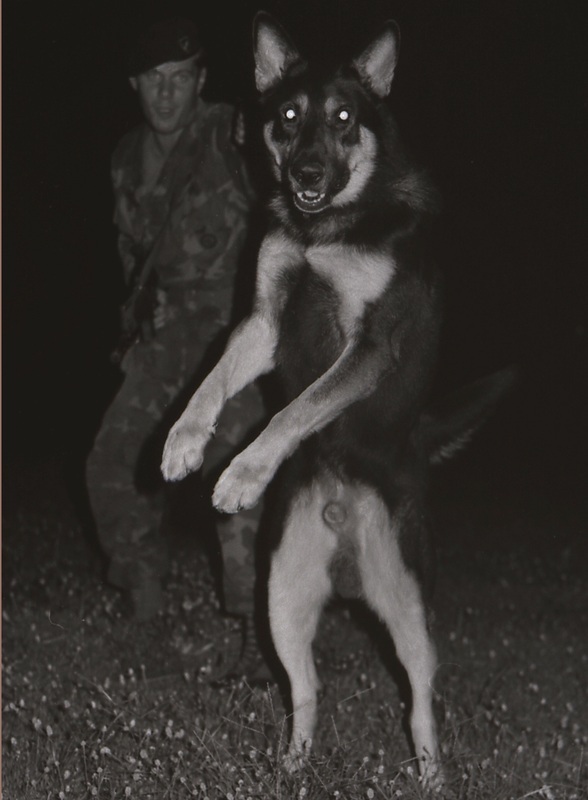 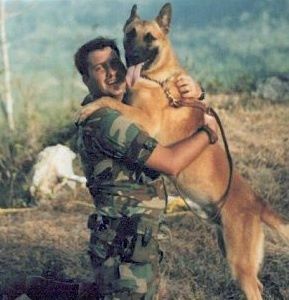 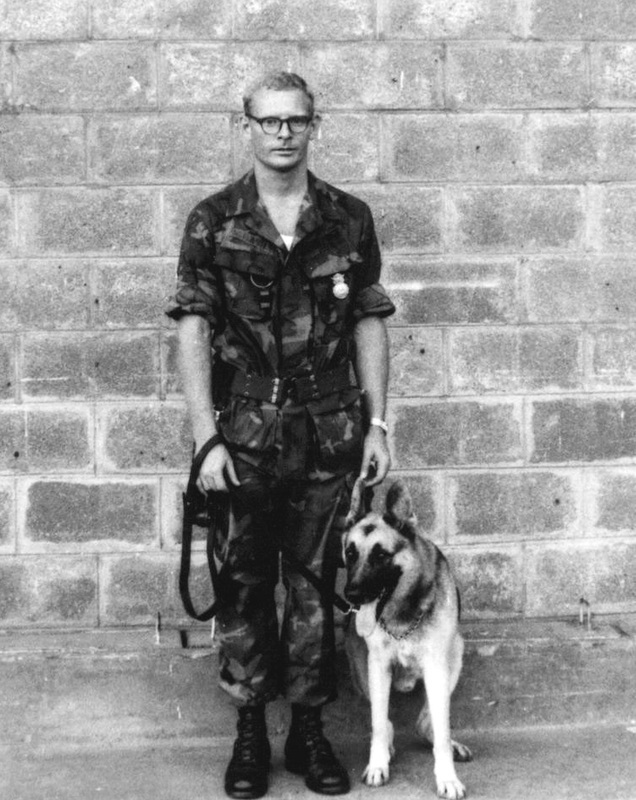 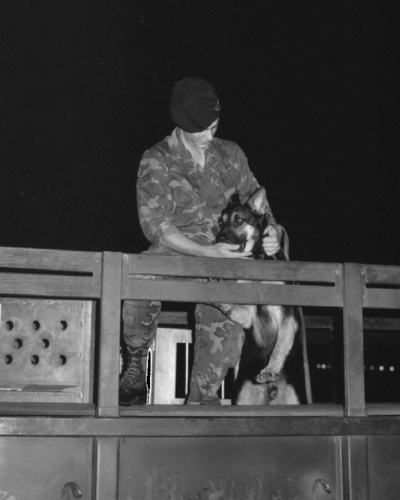 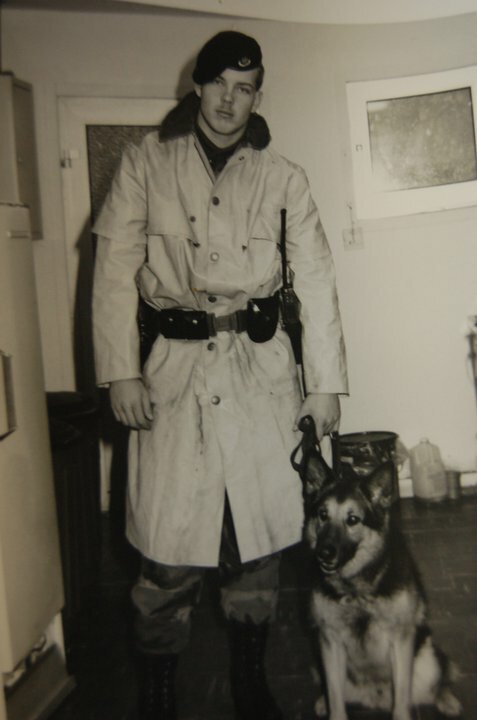 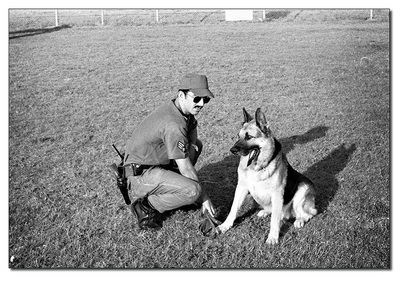 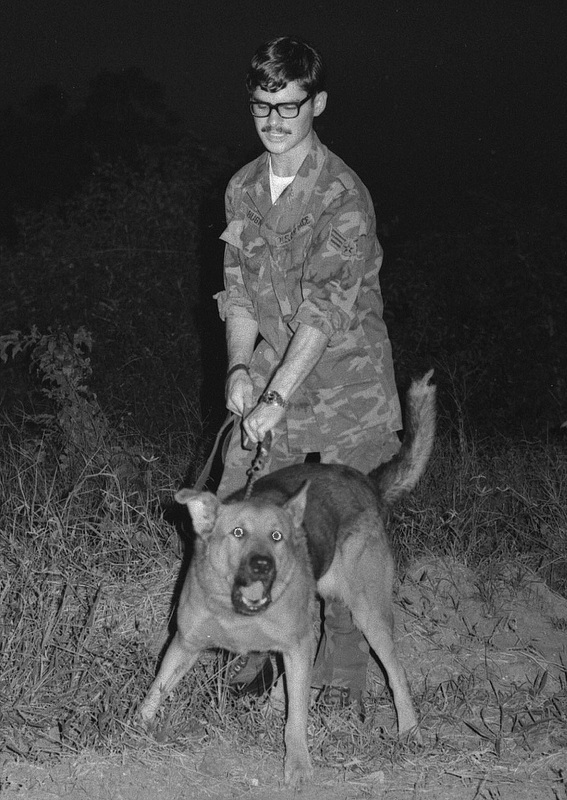 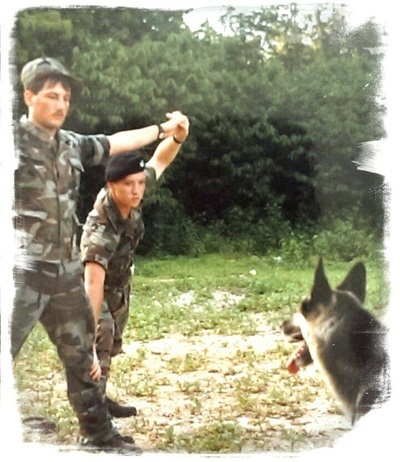 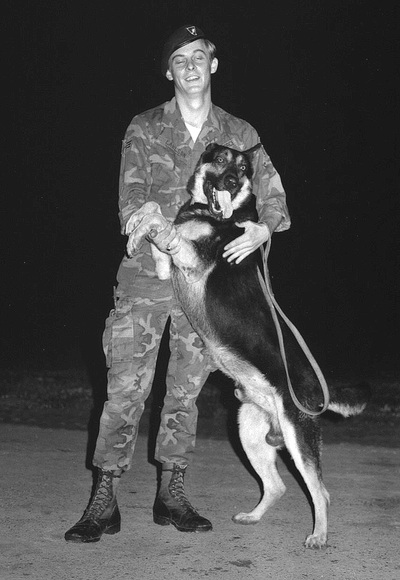 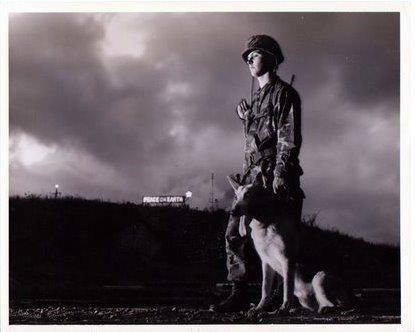 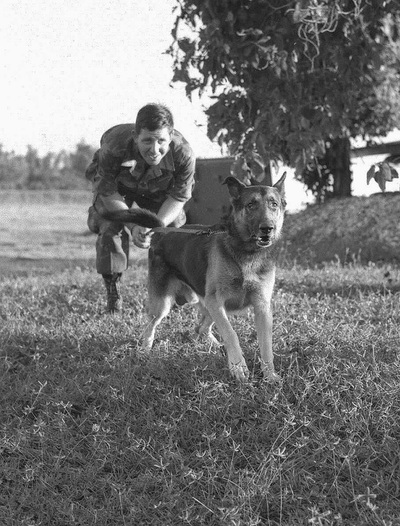 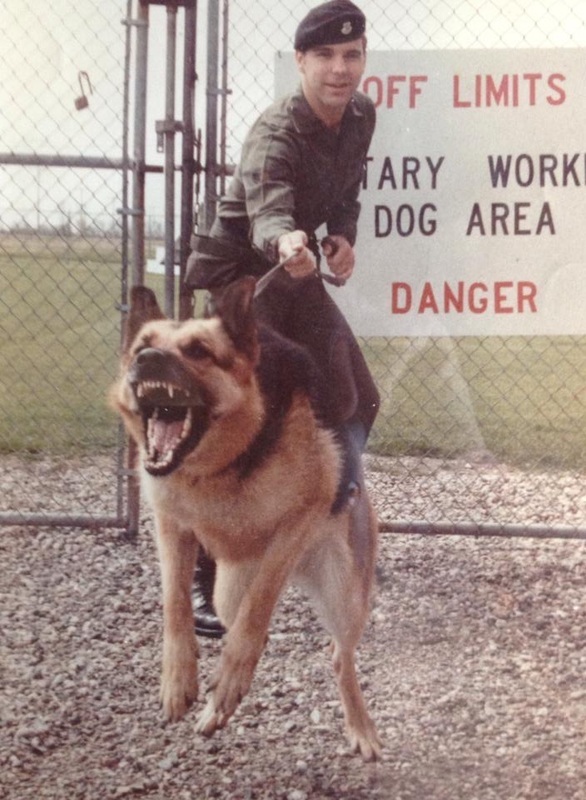 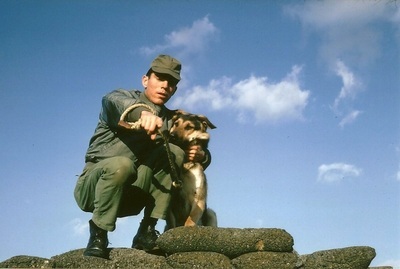 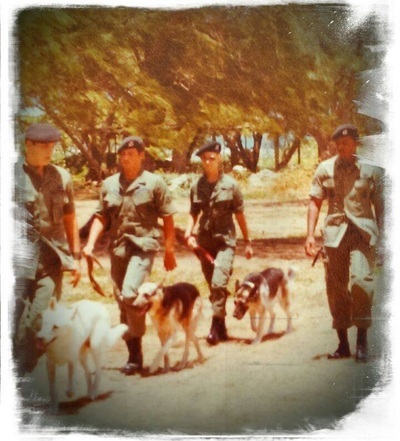 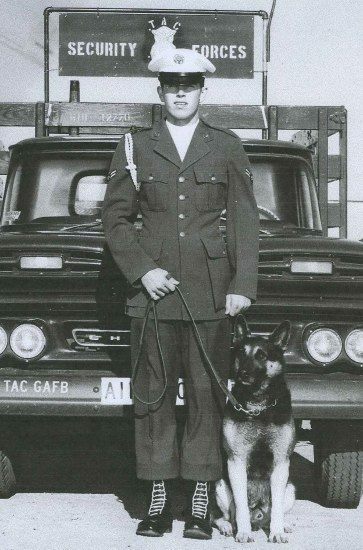 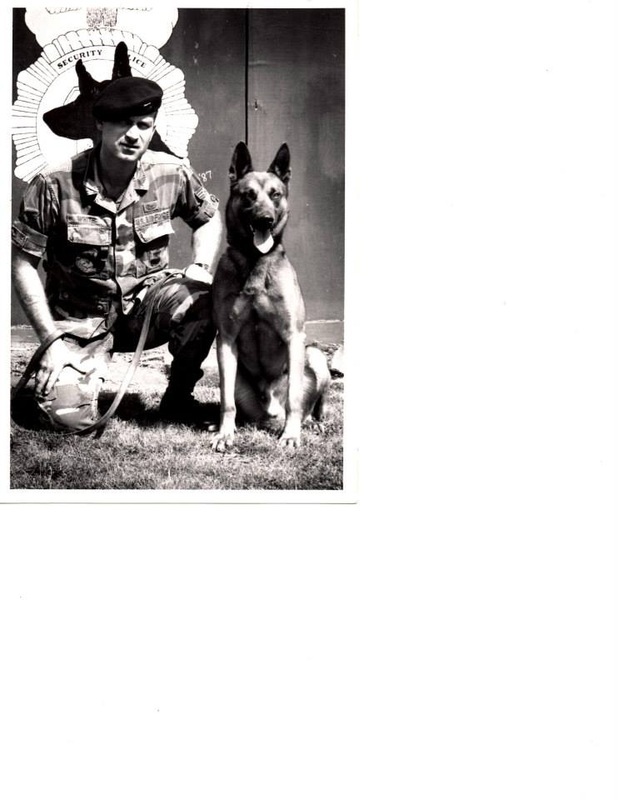 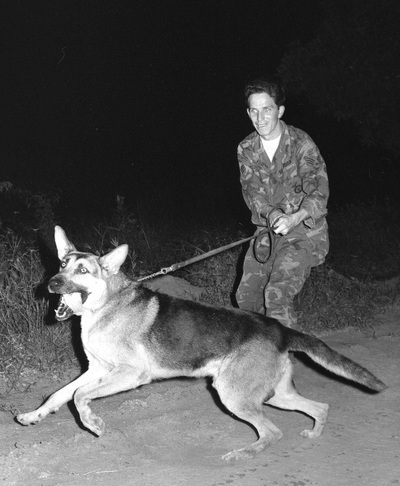 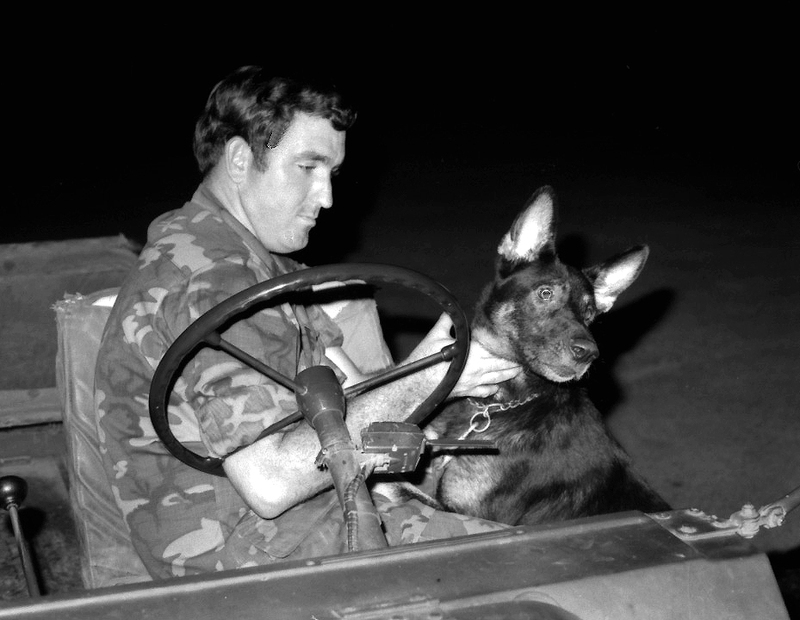 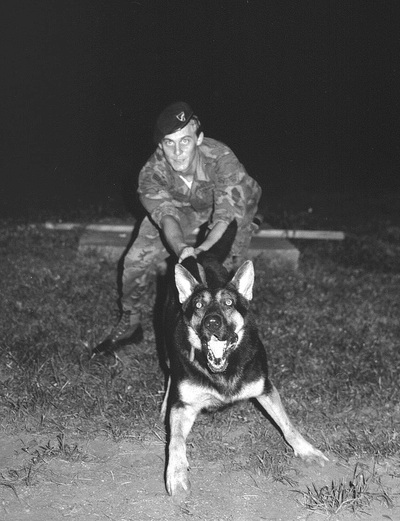 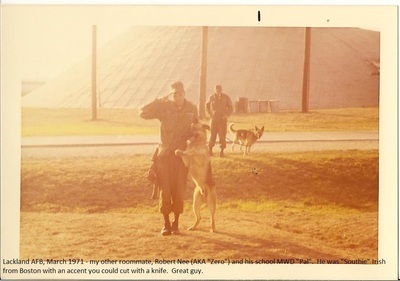 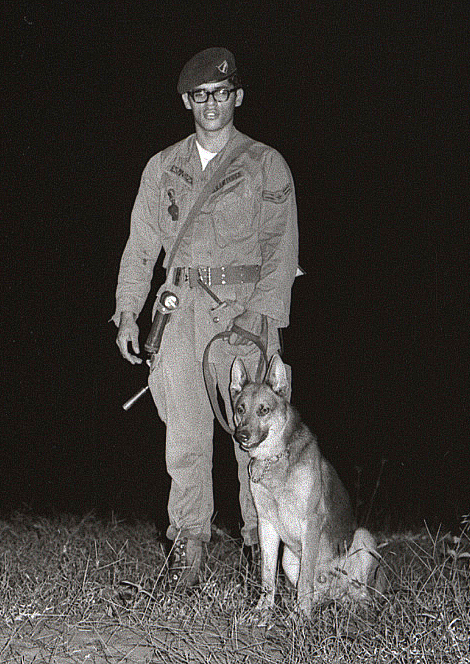 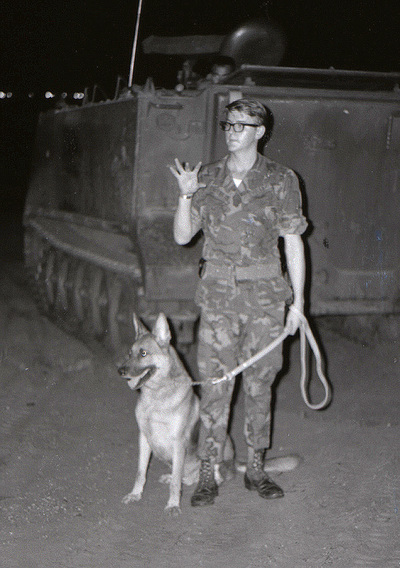 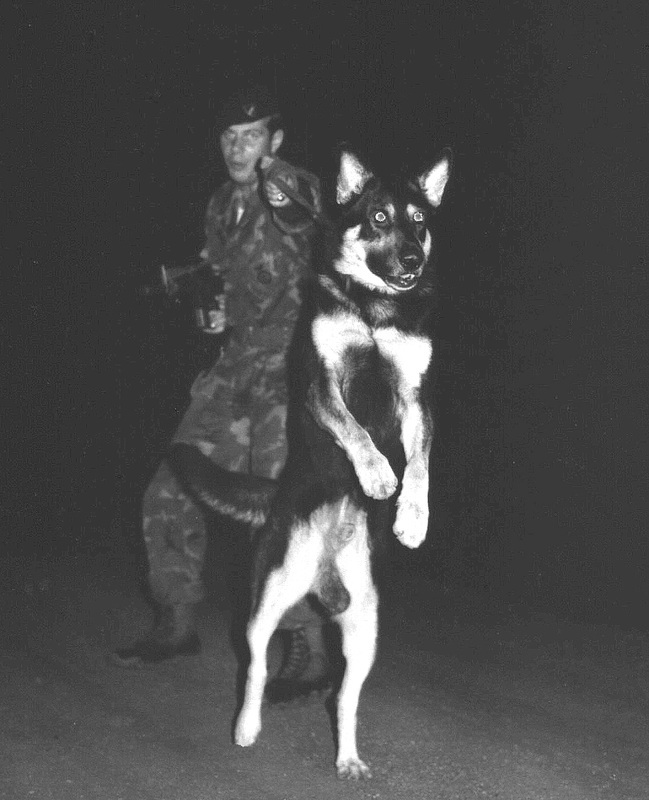 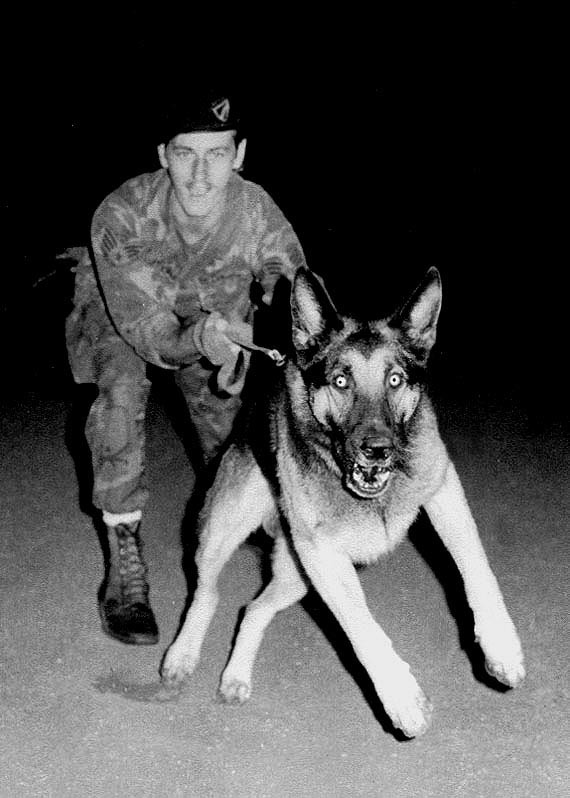 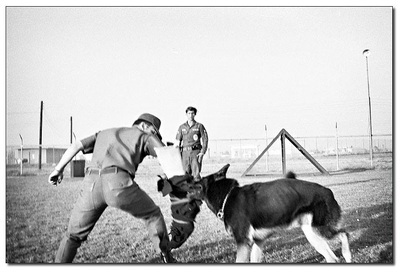 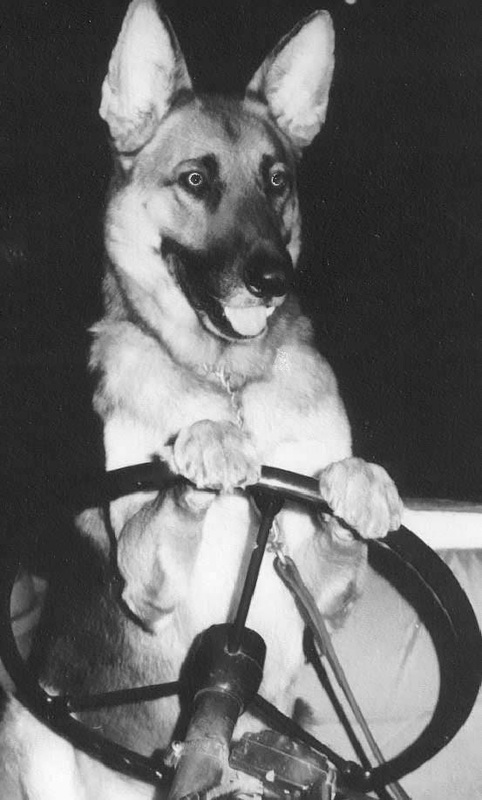 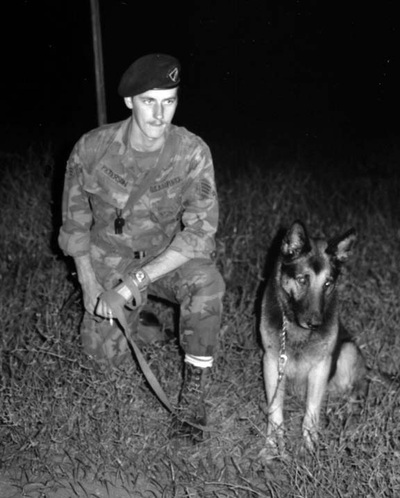 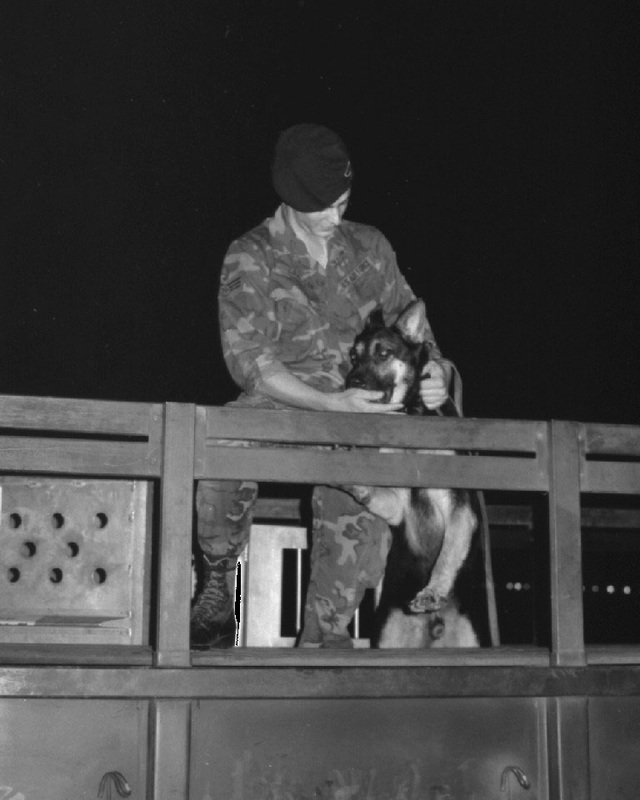 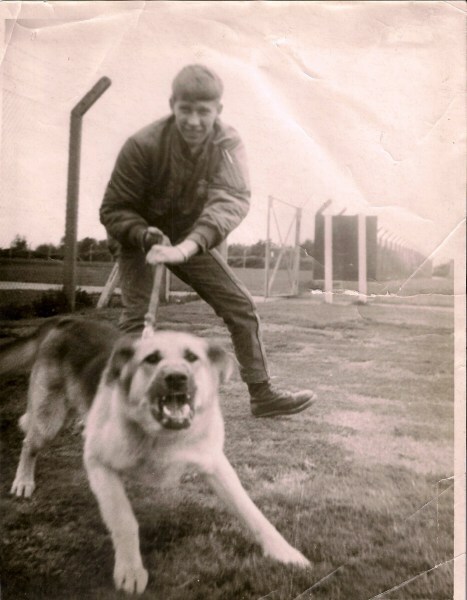 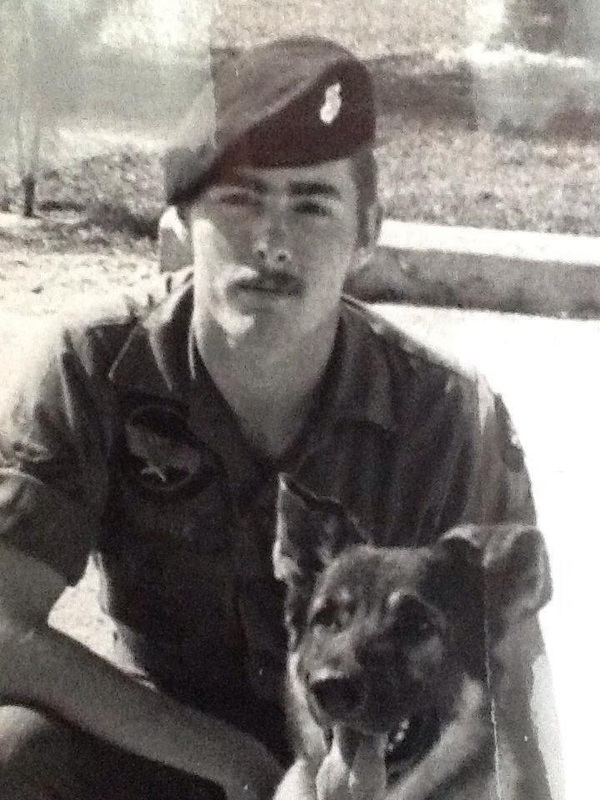 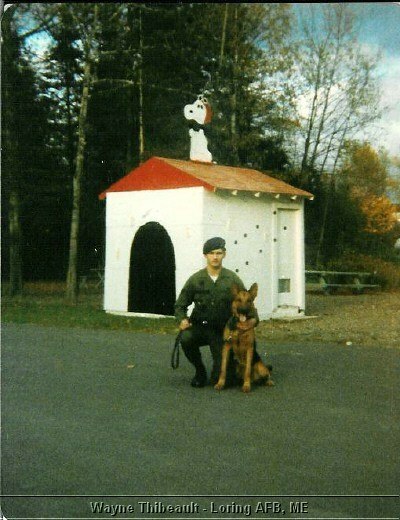 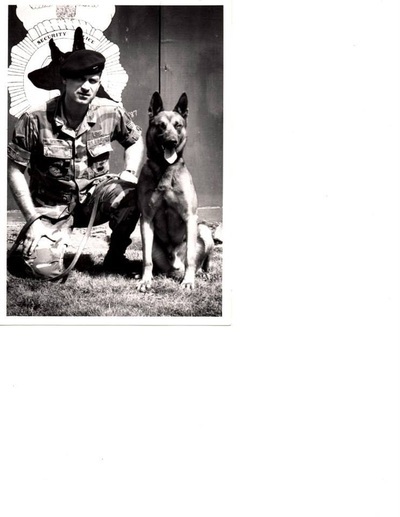 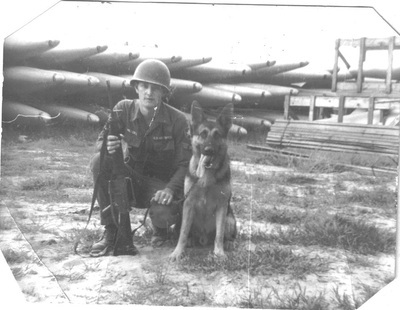 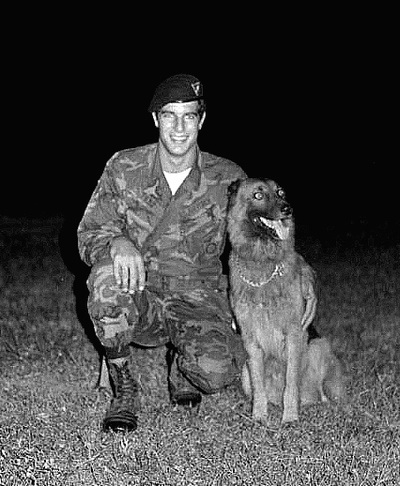 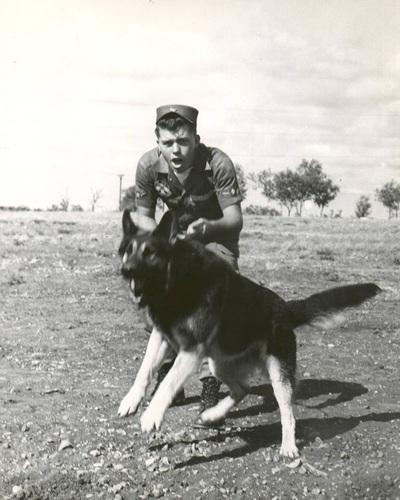 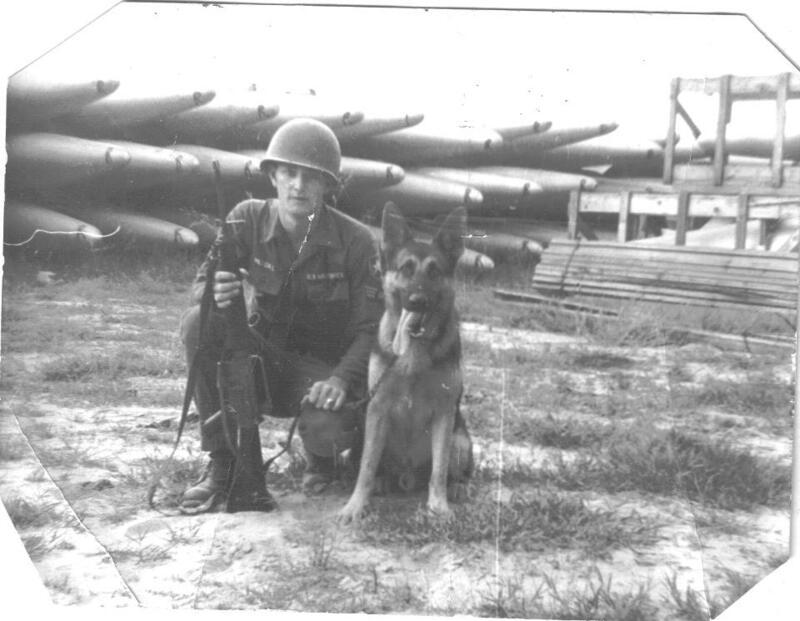 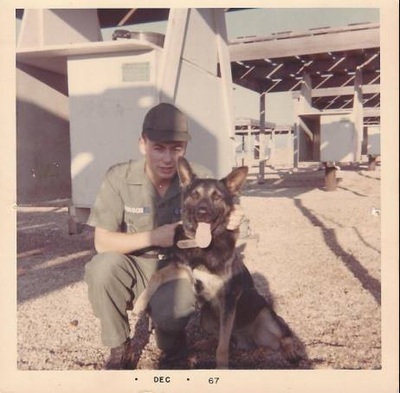 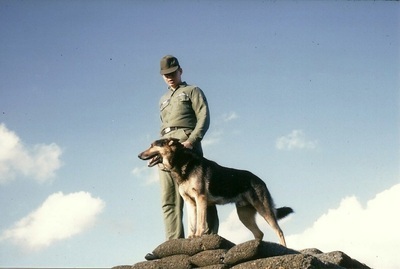 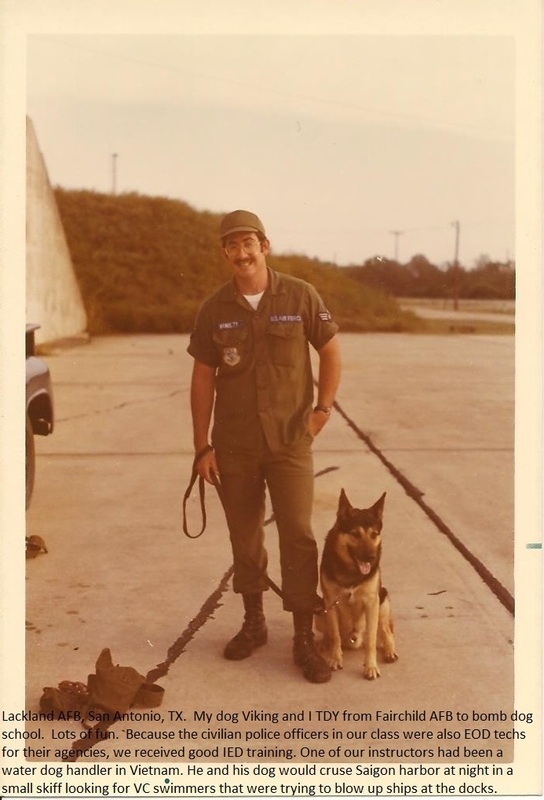 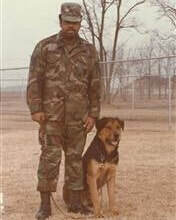 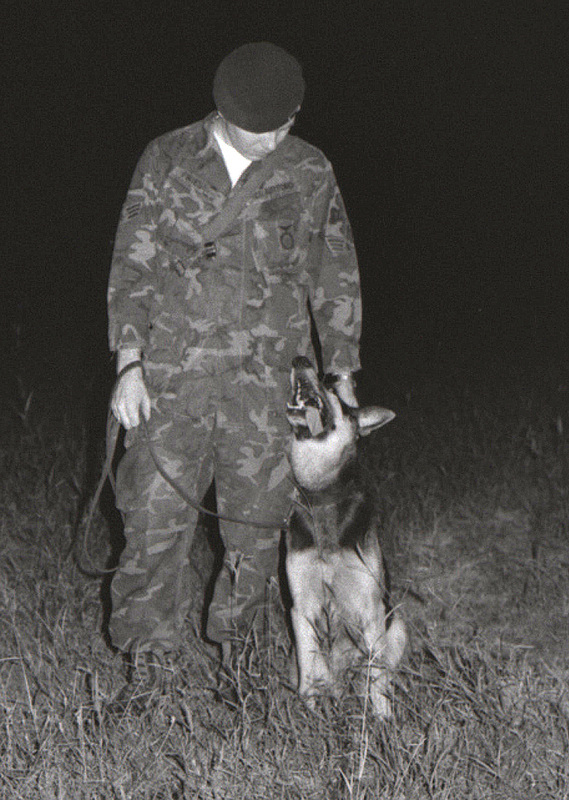 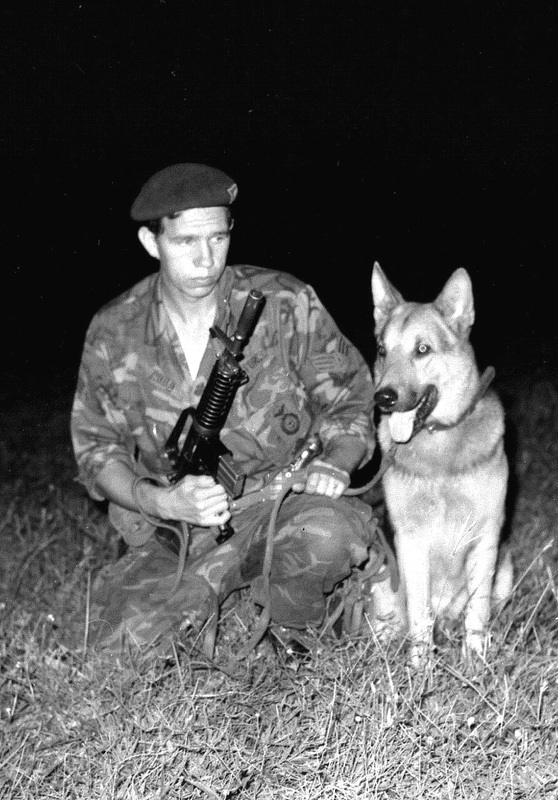 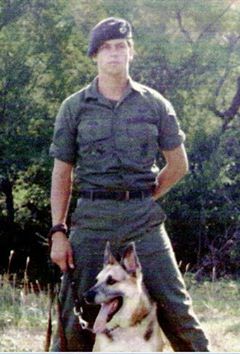 Military working dogs proved they are, War Dogs on many occasions during combat action in Vietnam. 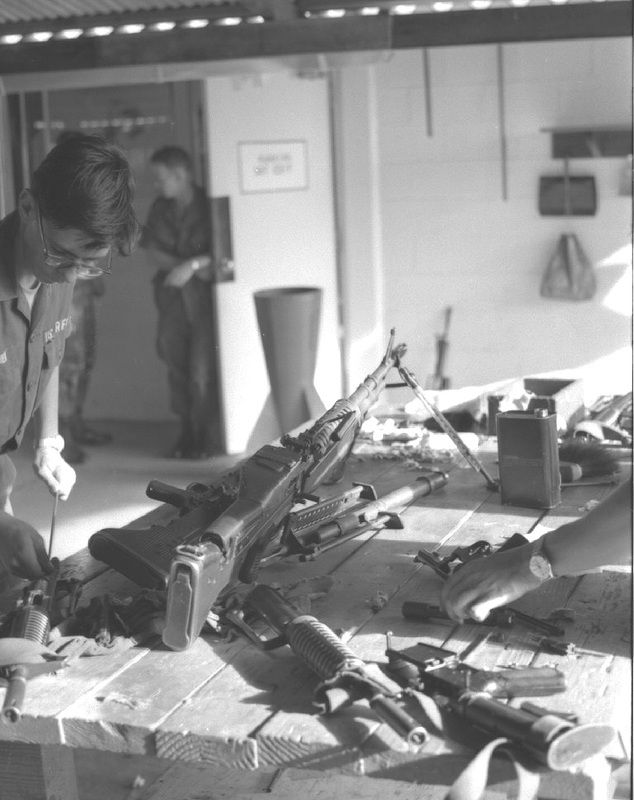 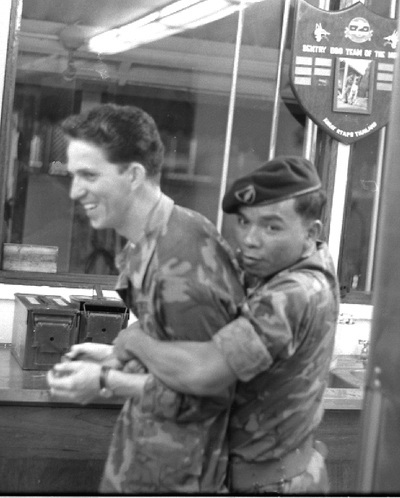 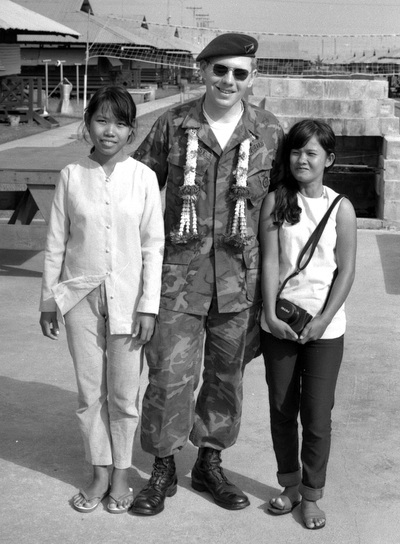 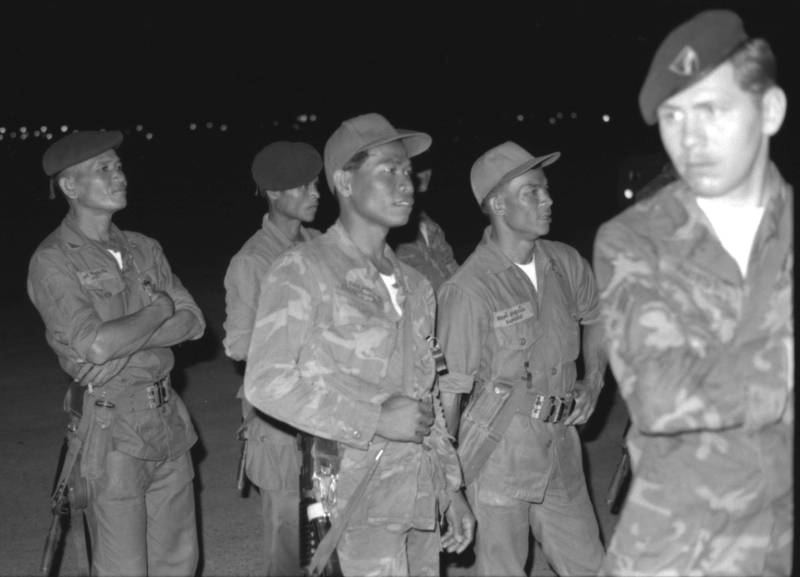 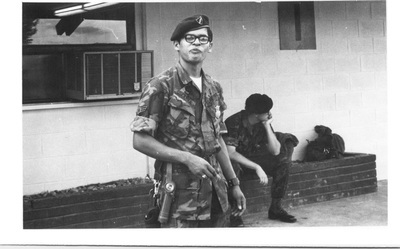 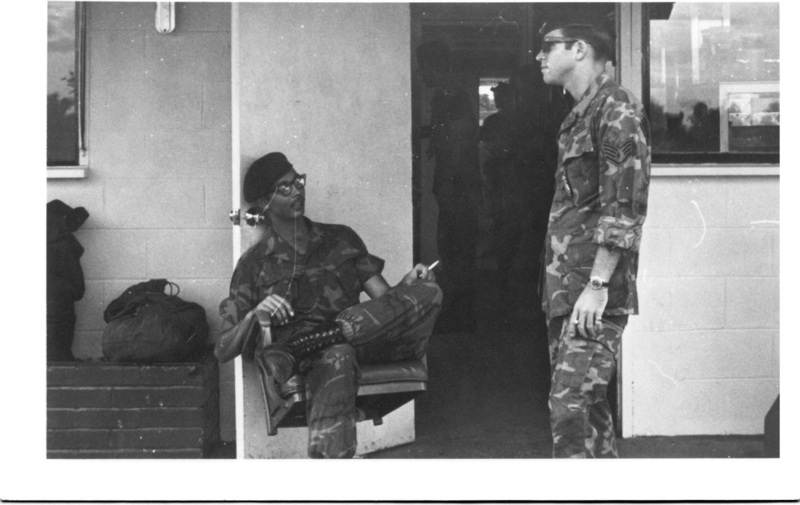 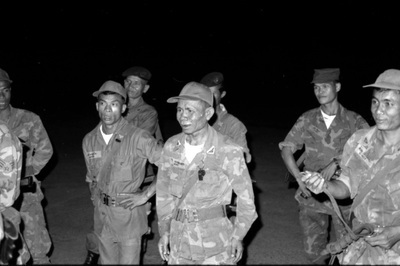 In the predawn hours of December 4, 1966, Tan Son Nhut AB was attacked by a large force of Viet Cong (VC) commando raiders. 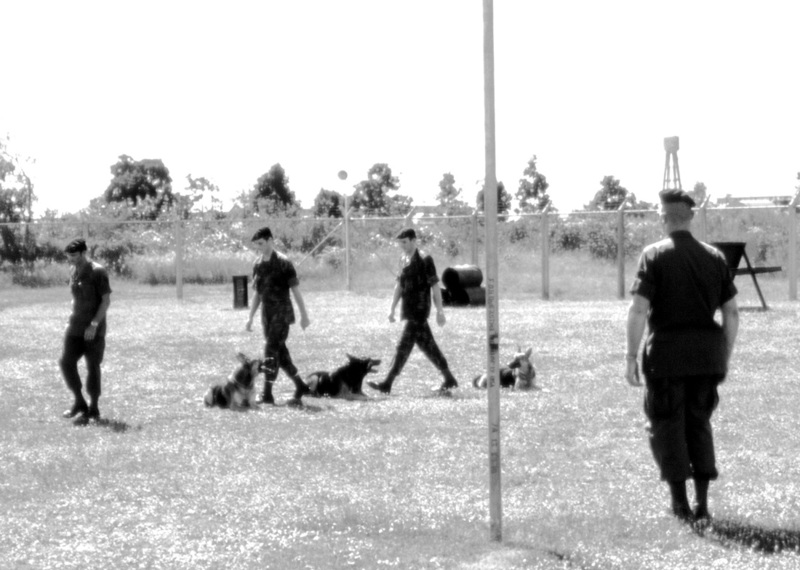 The raiders used a single avenue of approach through friendly force positions outside the base perimeter. 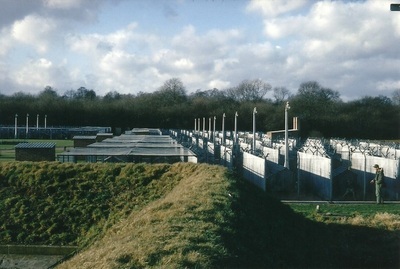 Once inside the base, the raiders divided into small groups to attack their targets. 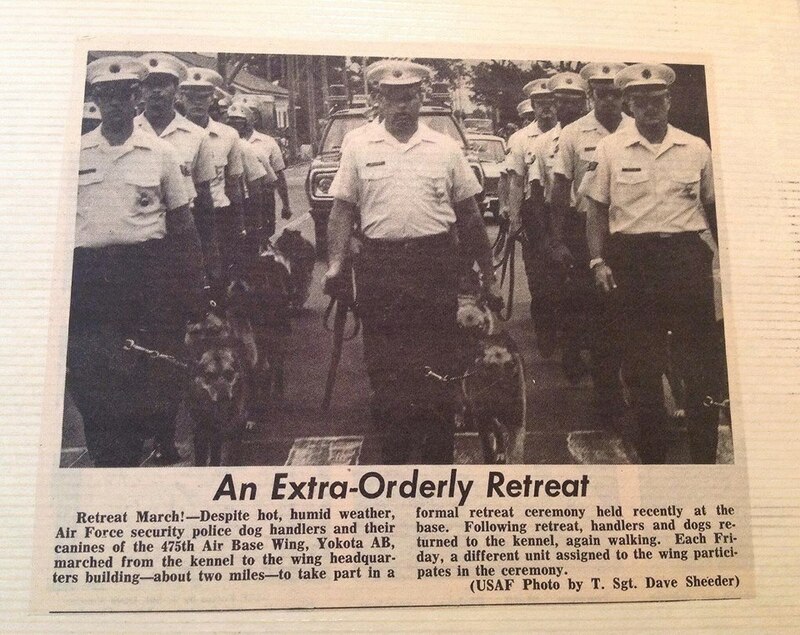 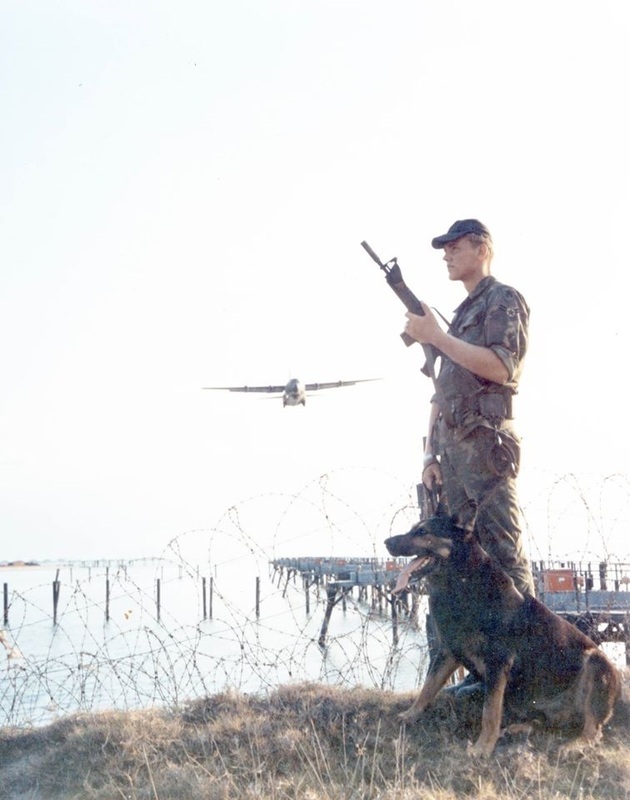 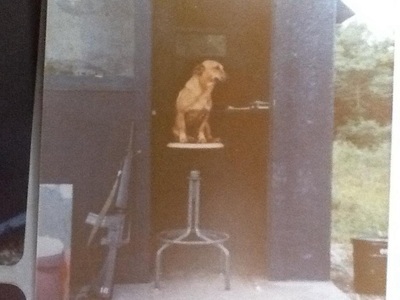 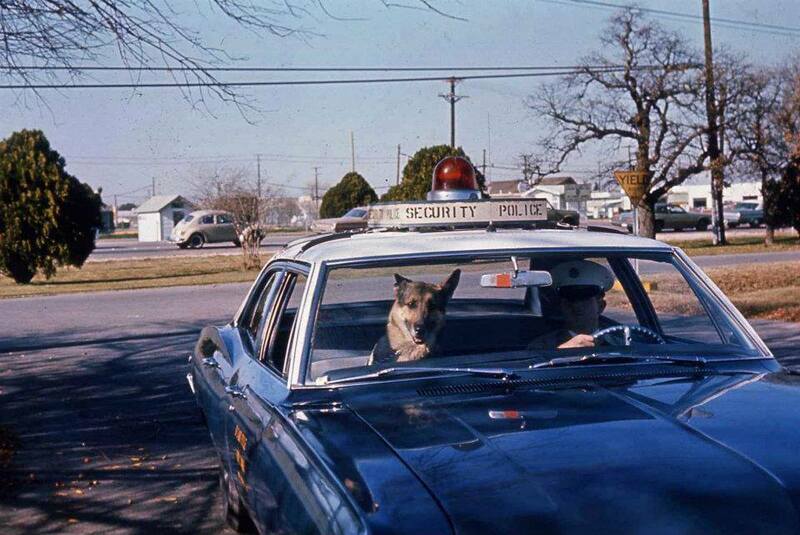 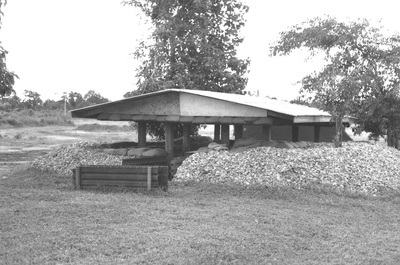 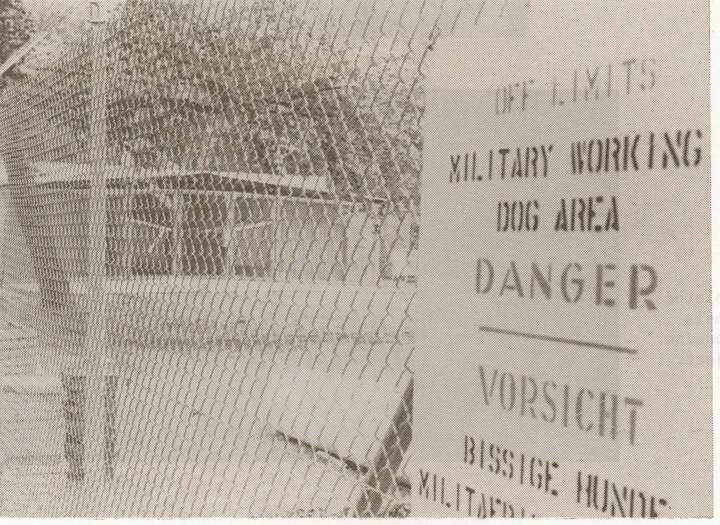 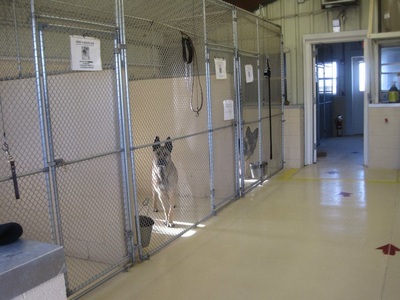 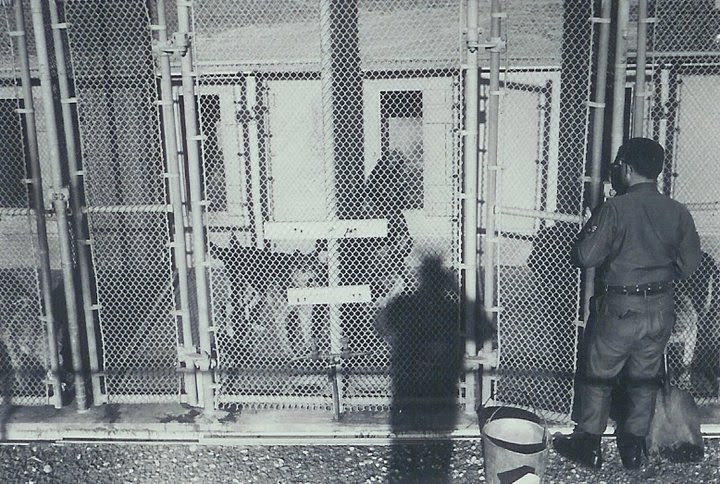 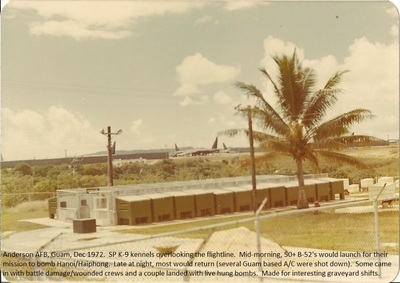 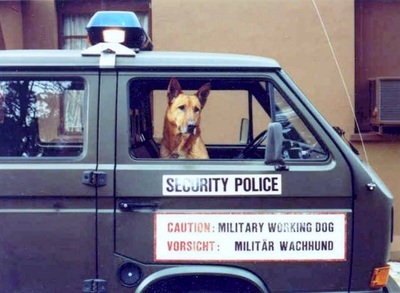 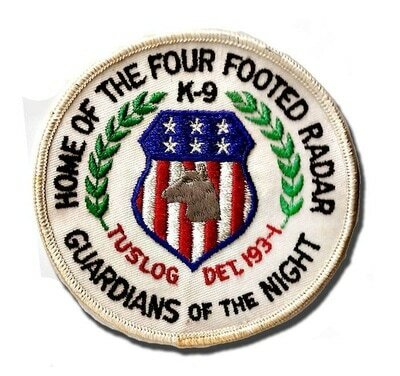 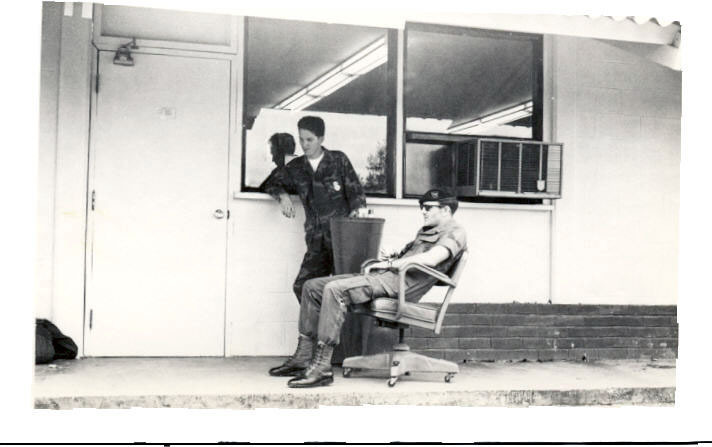 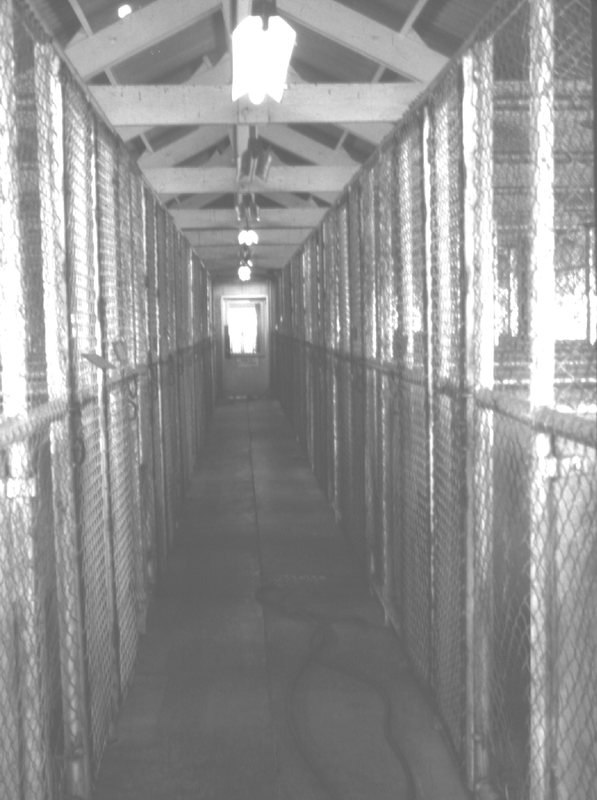 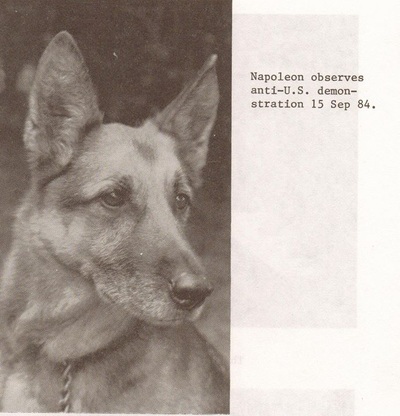 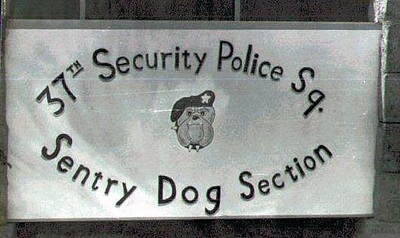 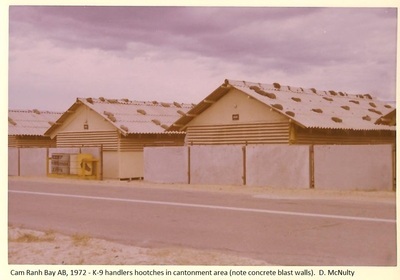 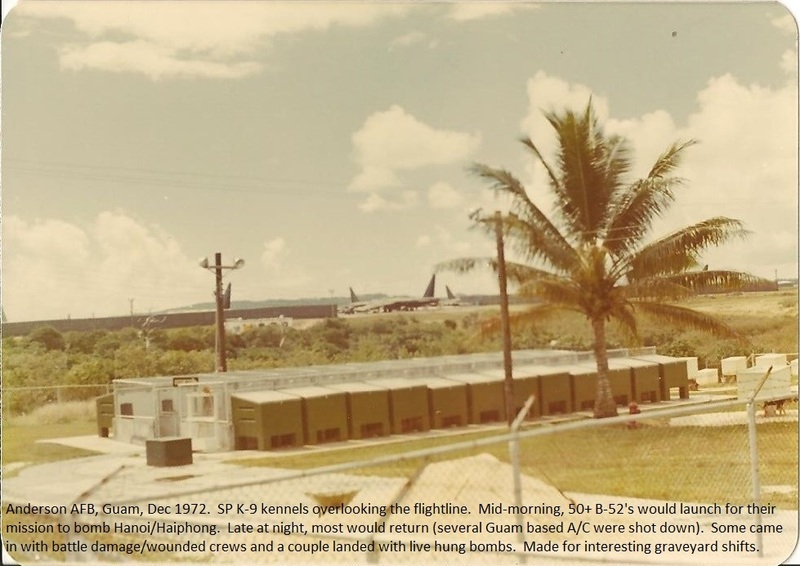 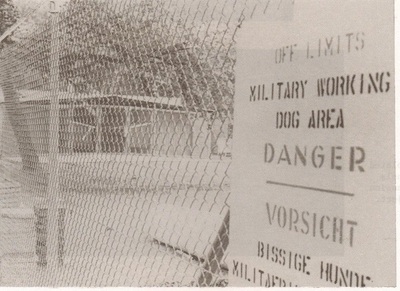 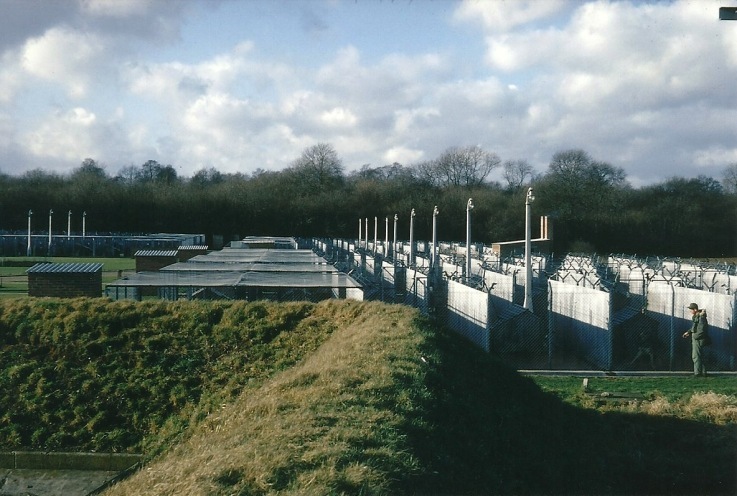 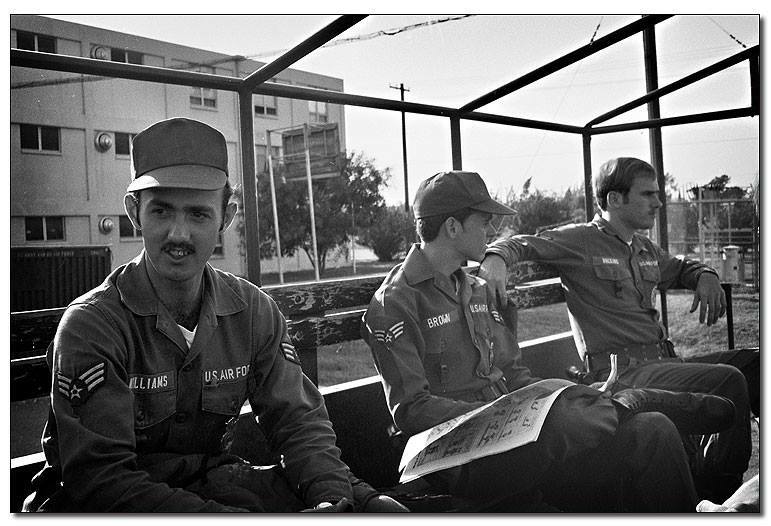 Several sentry dogs stationed on the perimeter gave the initial alert and warning almost simultaneously. 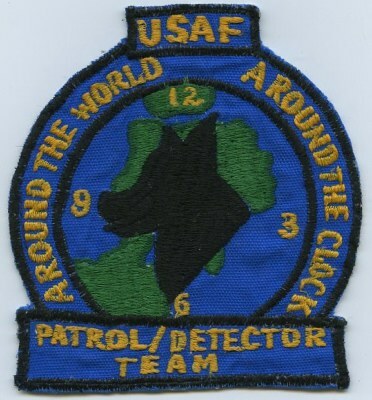 Because of this early warning, the 377th Air Police Squadron was able to repel the attack after seven long hours of fighting. 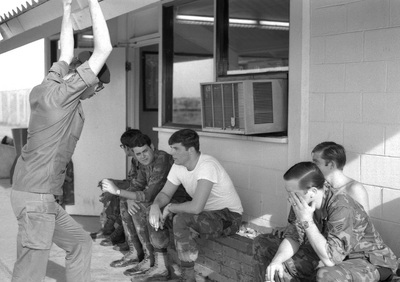 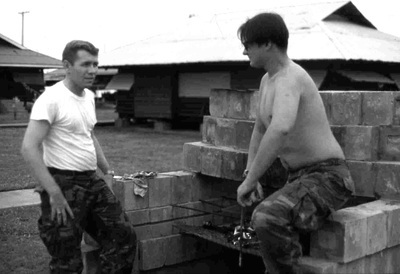 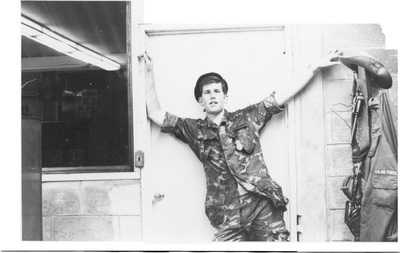 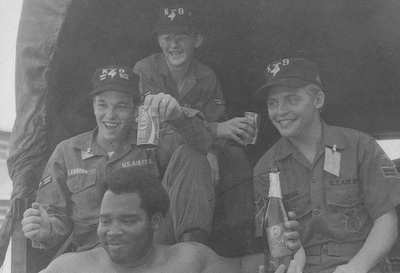 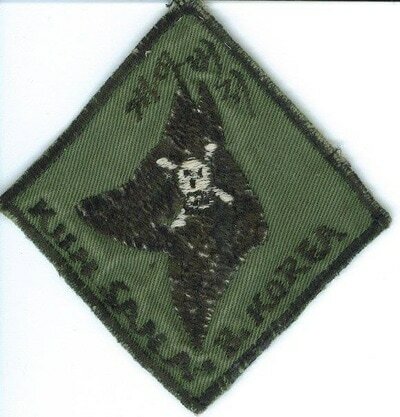 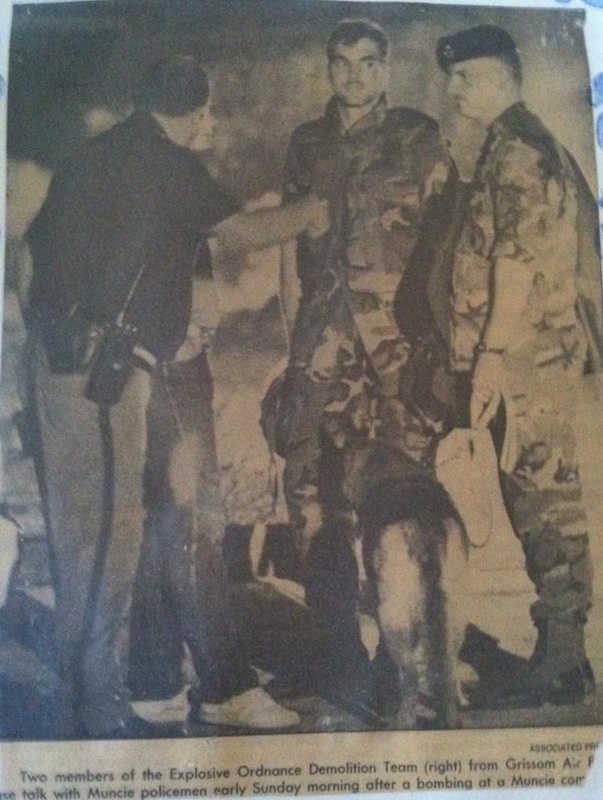 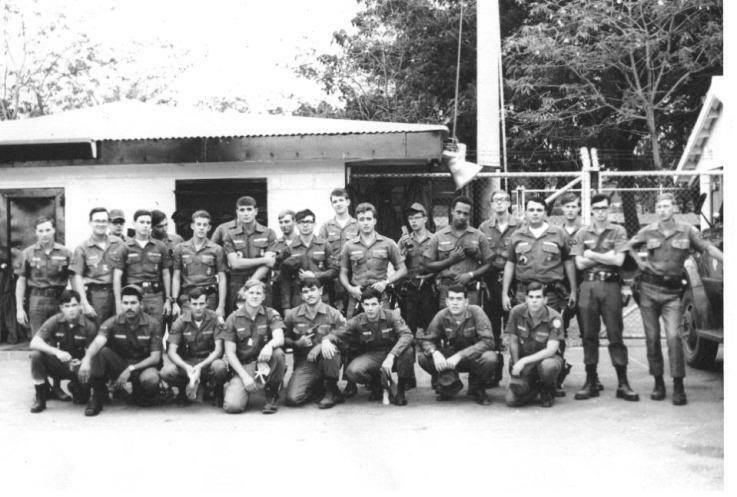 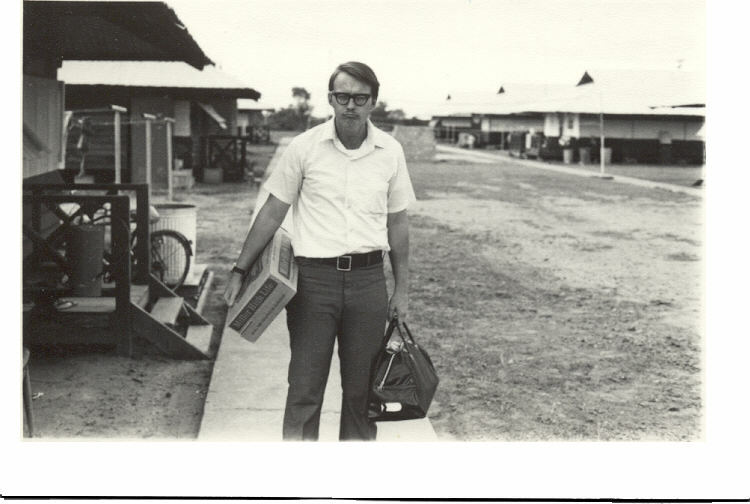 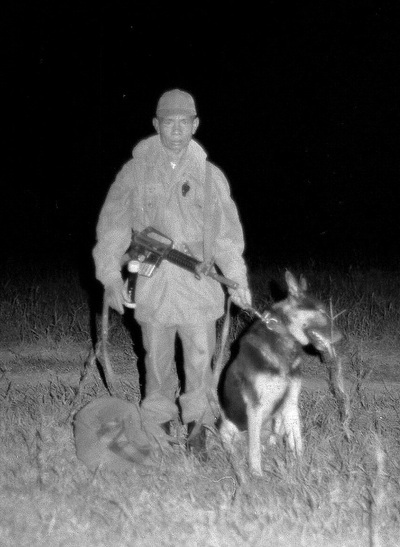 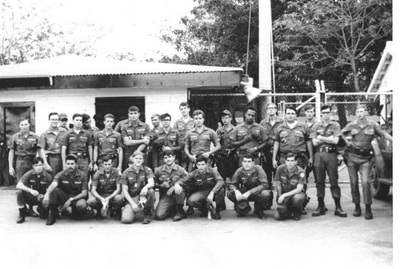 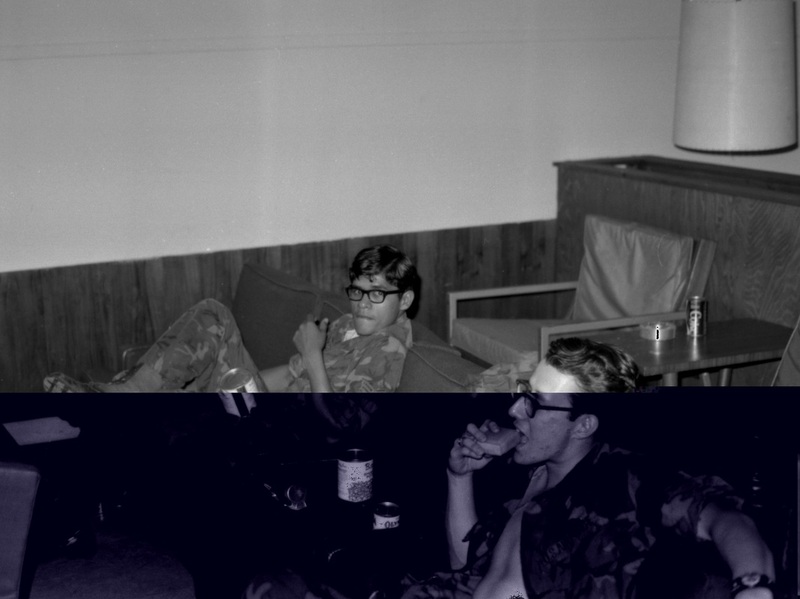 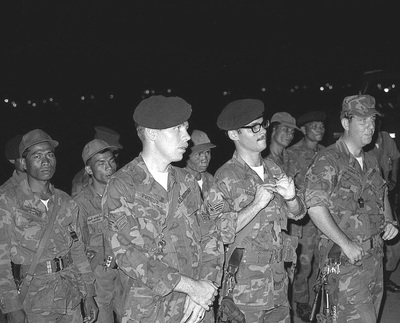 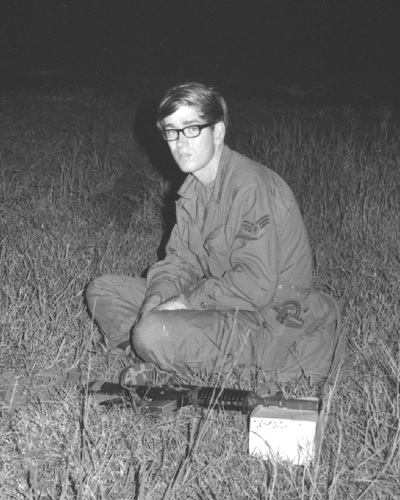 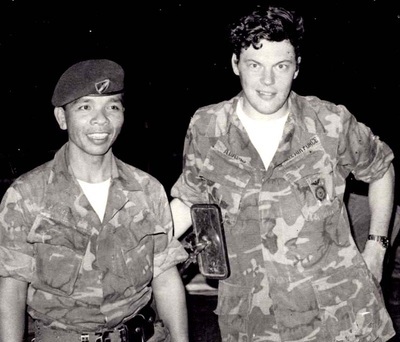 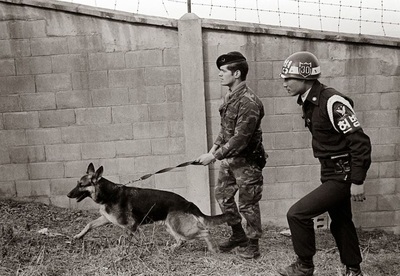 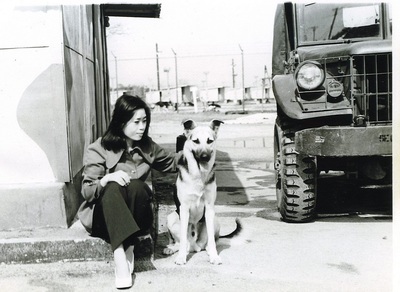 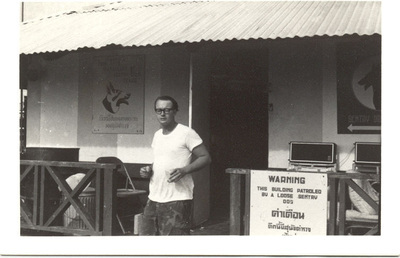 When the battle was over, 13 Viet Cong and one Security Policeman, who was trying to save his supervisor, were dead and one canine handler was wounded. 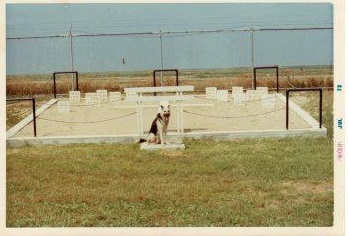 Many of the remaining VC took refuge in vegetation, wells, and local graveyards to wait for the opportunity to escape or attack again. 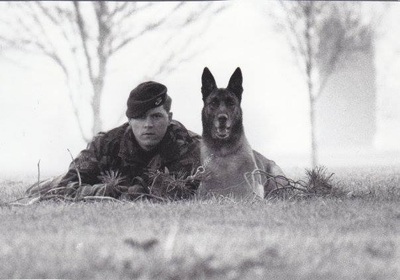 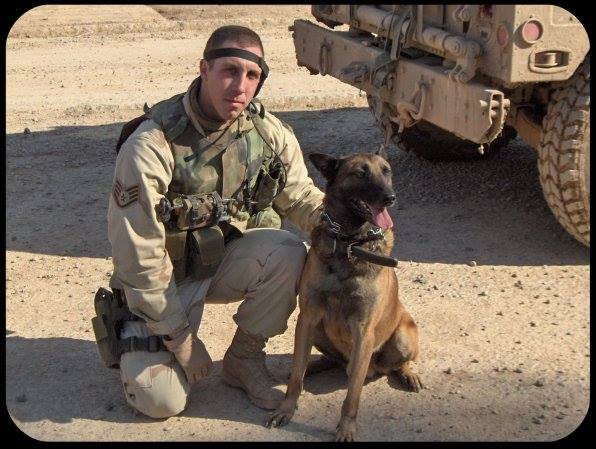 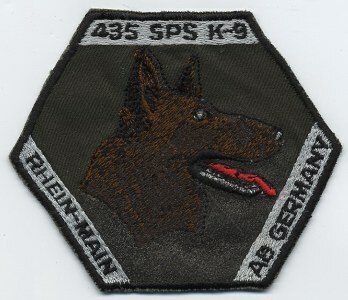 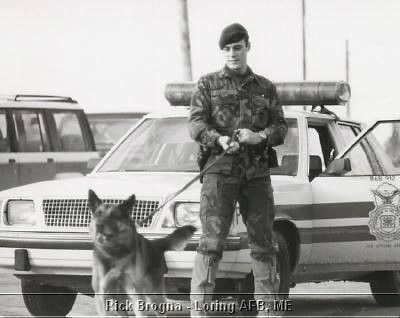 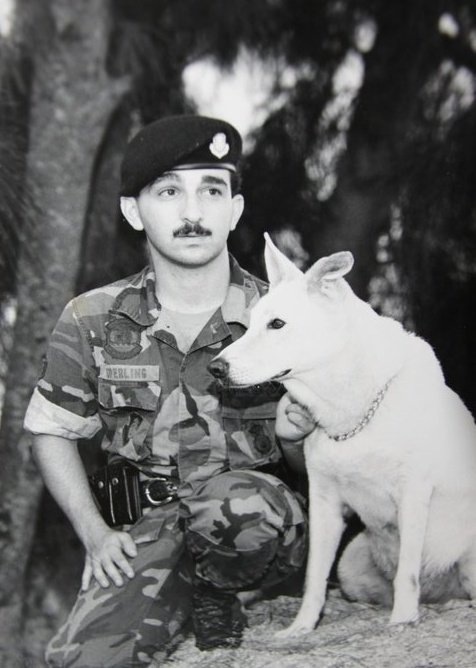 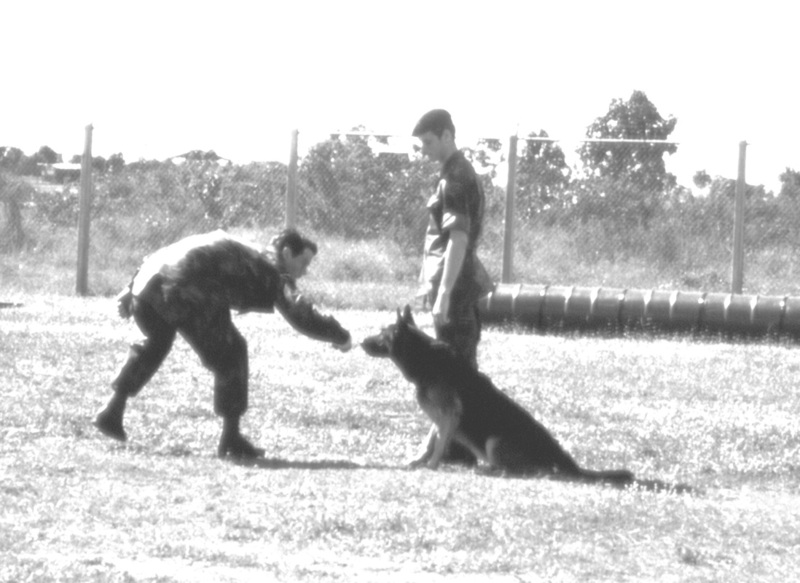 Around 1900 hrs, MWD Nemo alerted his handler Airman Second Class Robert A. Thorneburg to the presence of VC who had avoided earlier detection. 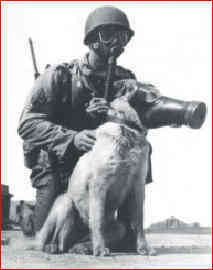 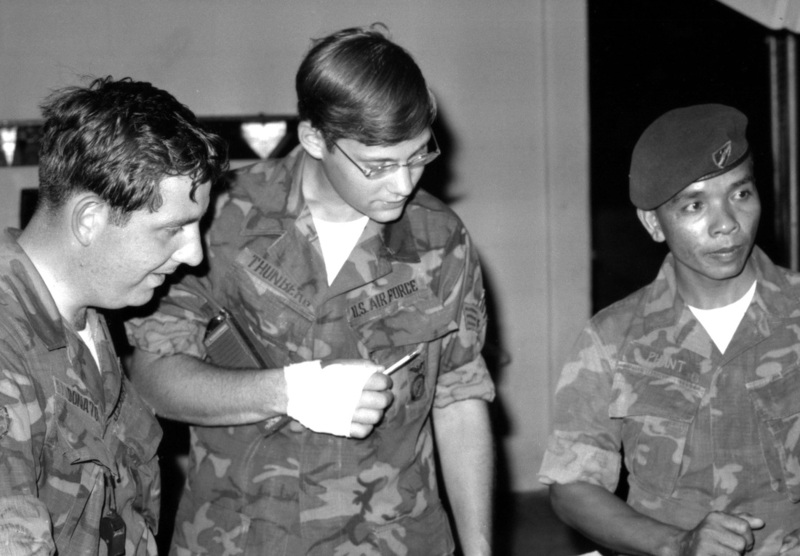 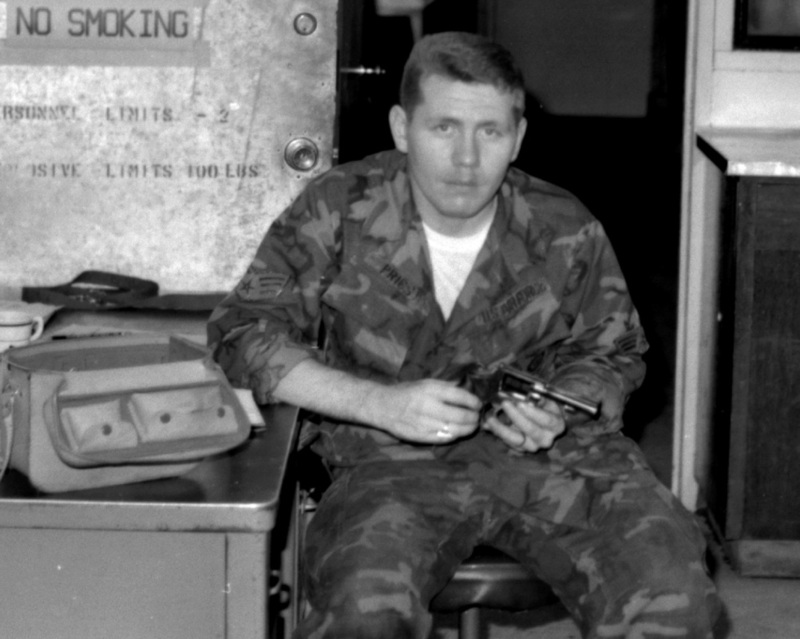 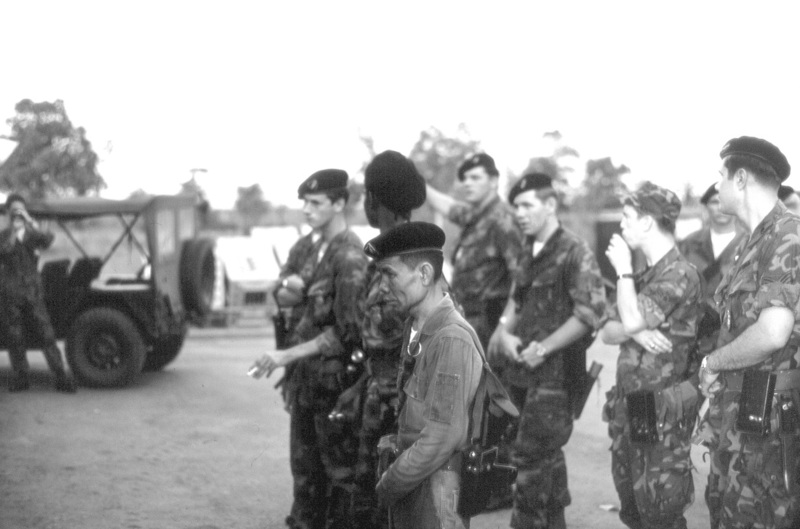 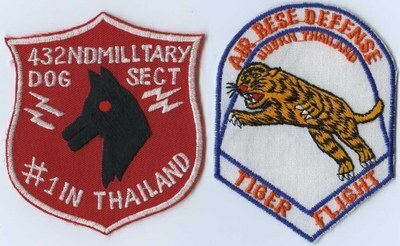 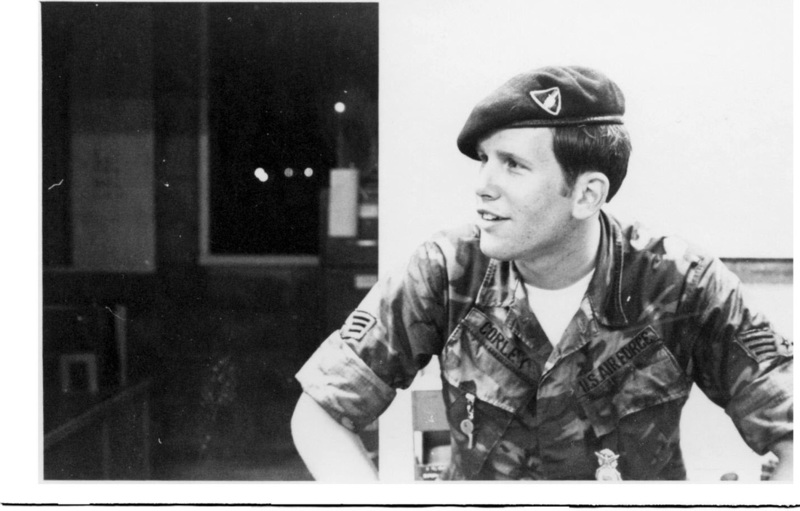 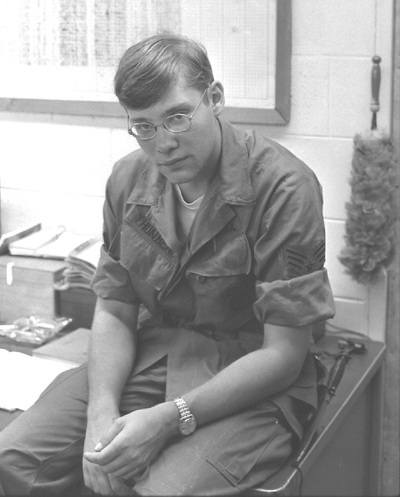 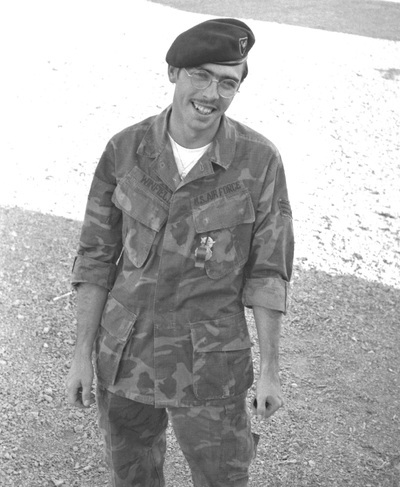 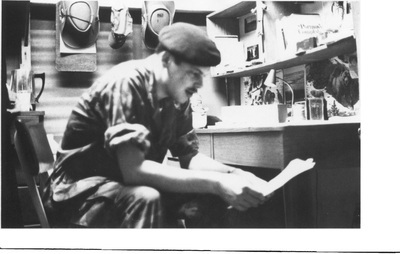 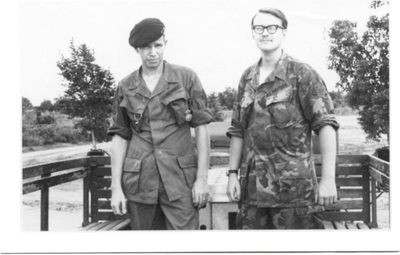 During the attack, a bullet caught Airman Thorneburg on his shoulder and Nemo was hit in the muzzle area, but not before Nemo killed at least one VC raider. 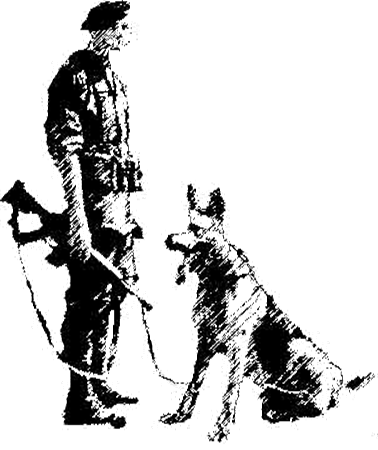 Ignoring his serious head wound, the 85-pound dog threw himself at the VC guerillas who had opened fire. 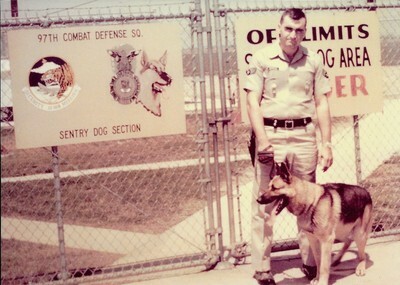 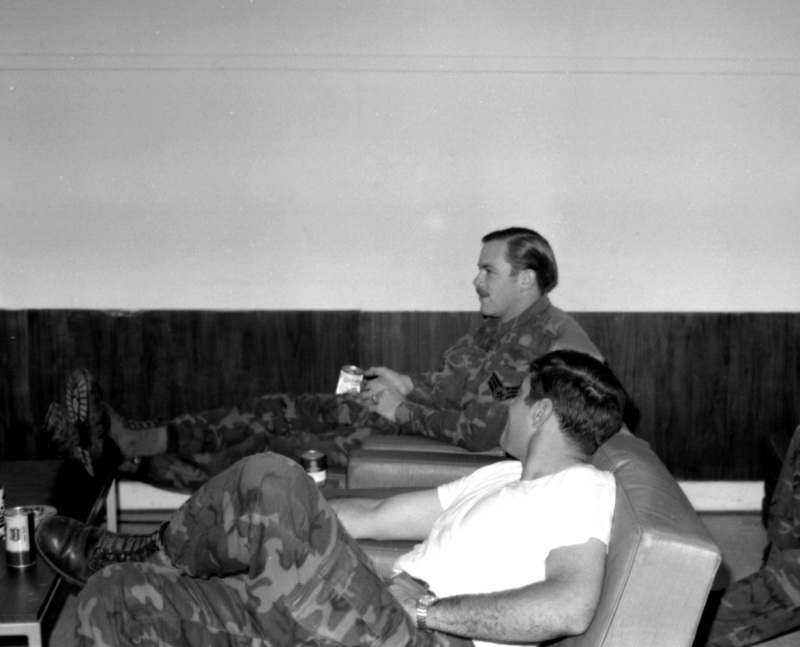 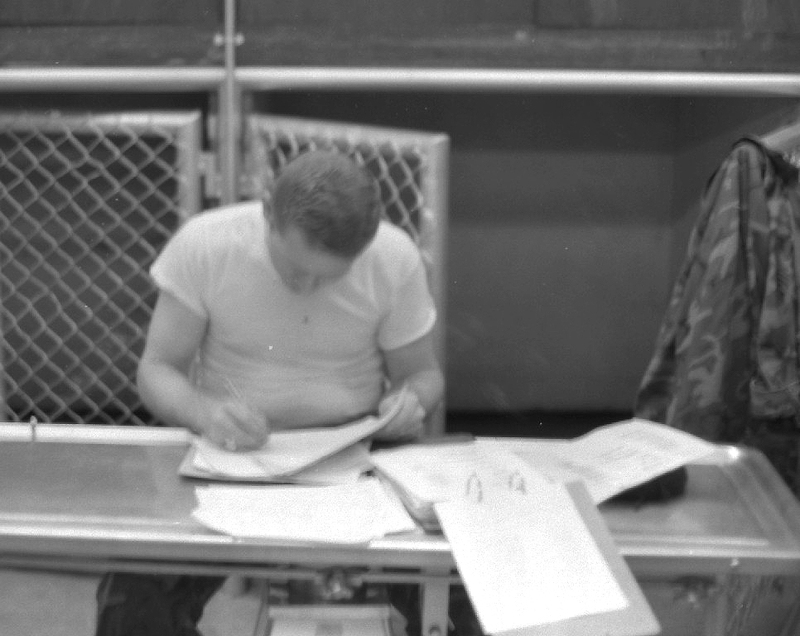 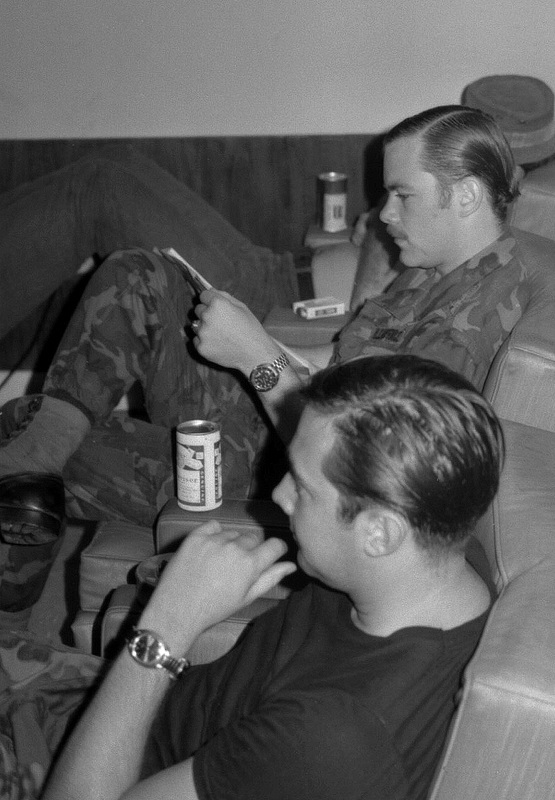 Nemo‘s ferocious defense bought Airman Thorneburg the time he needed to call upon back up forces. 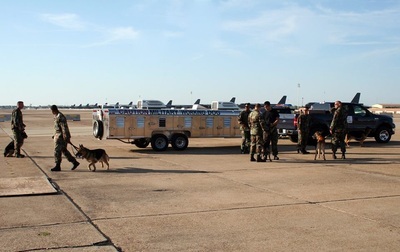 Finally, the QRT members were able to carry Thorneburg and Nemo out to safety where they received emergency treatment. 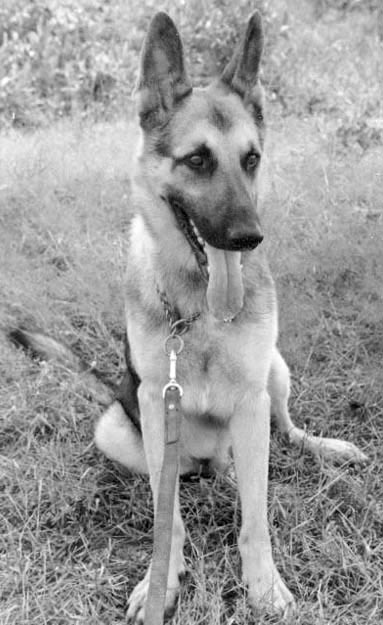 Both recovered; however, Nemo was permanently disfigured and lost the use of one eye. 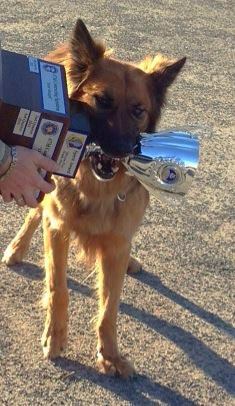 Nemo was credited with saving his handler‘s life and preventing further destruction of life and property. 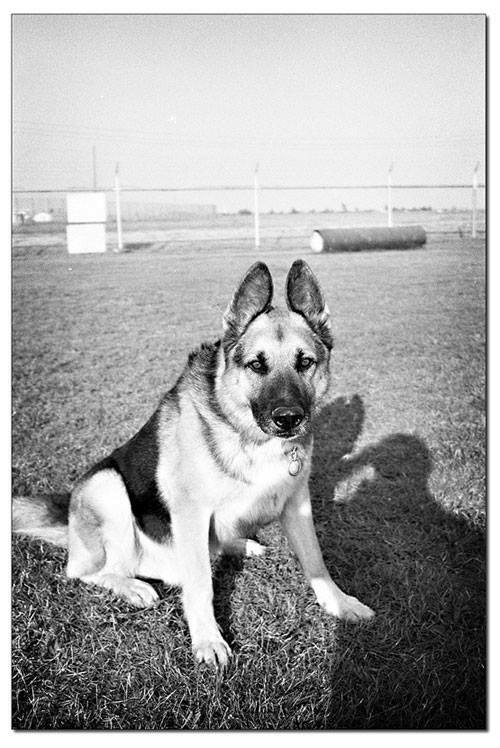 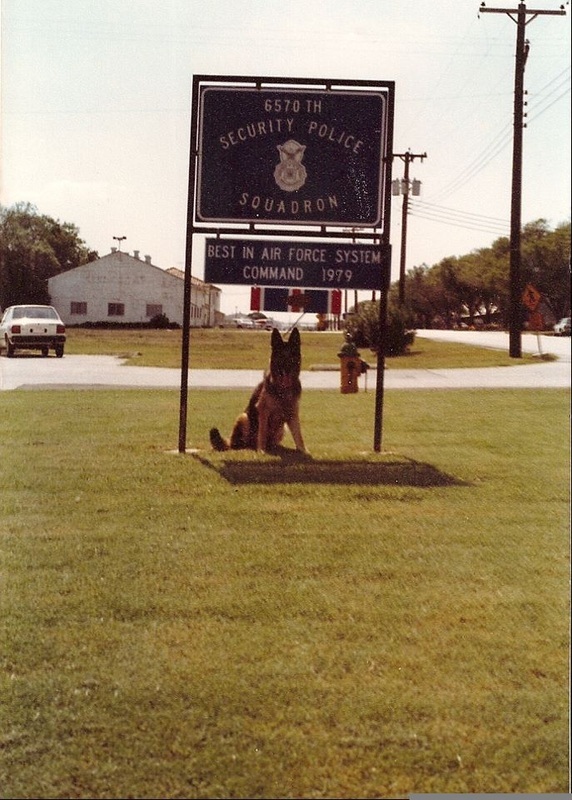 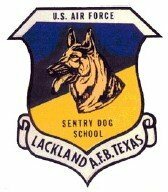 On June 23, 1967, HQ USAF directed Nemo be returned to Lackland AFB, TX, as the first sentry dog officially retired from military service. 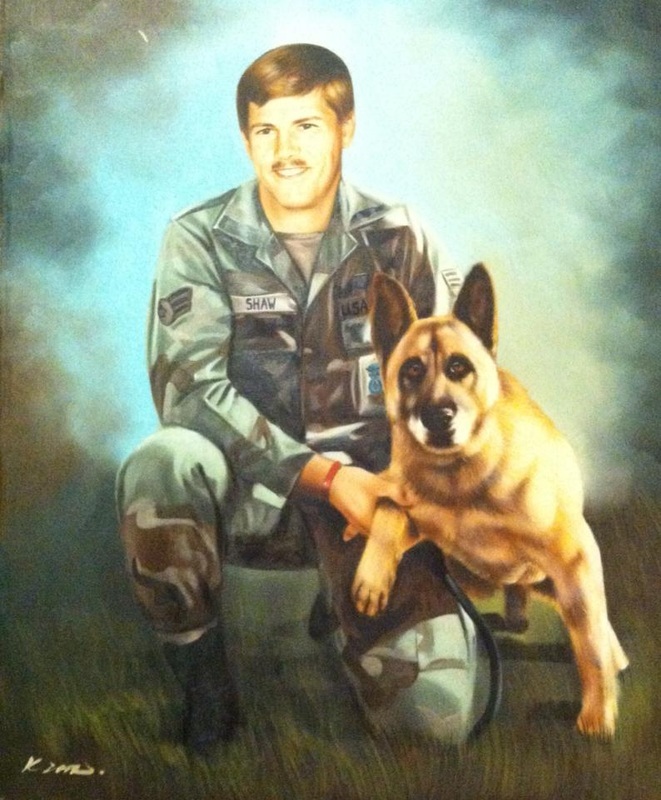 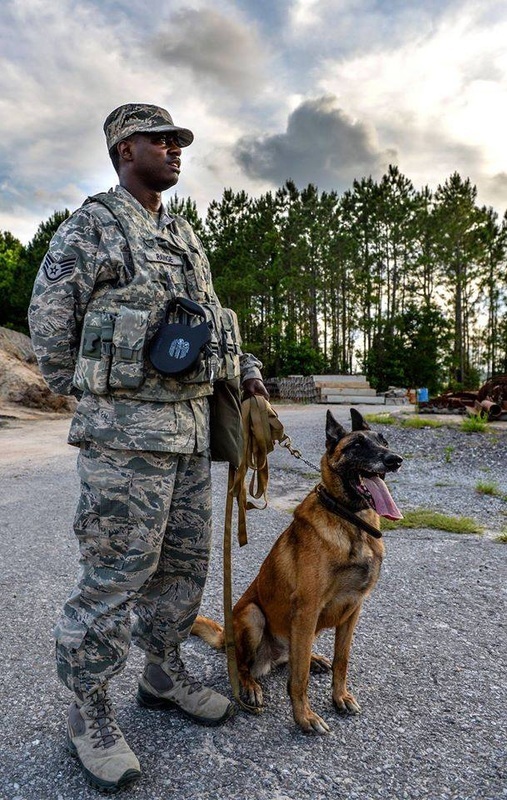 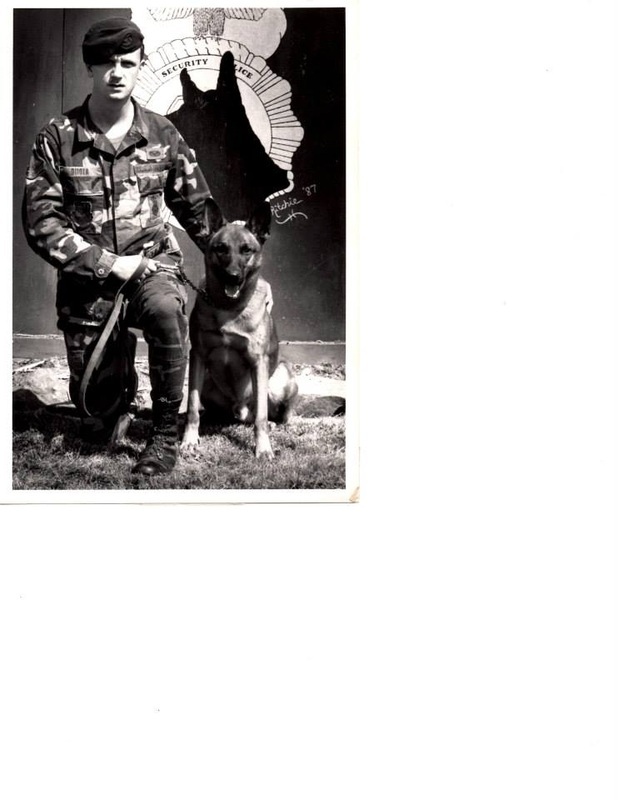 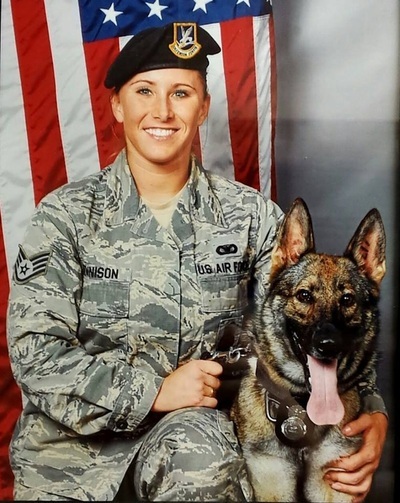 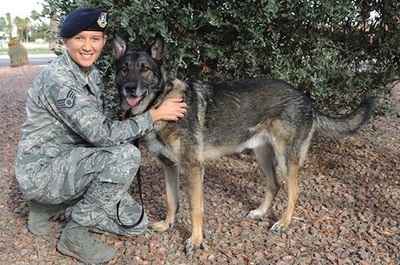 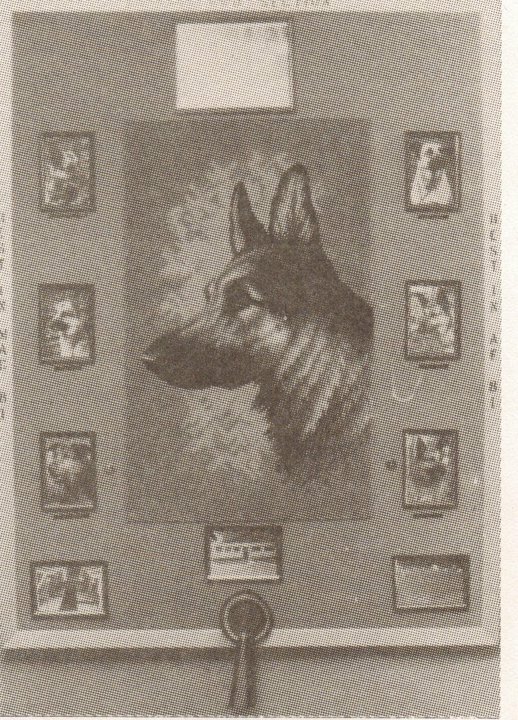 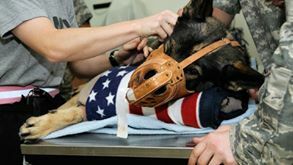 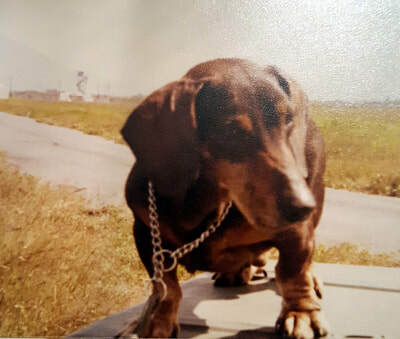 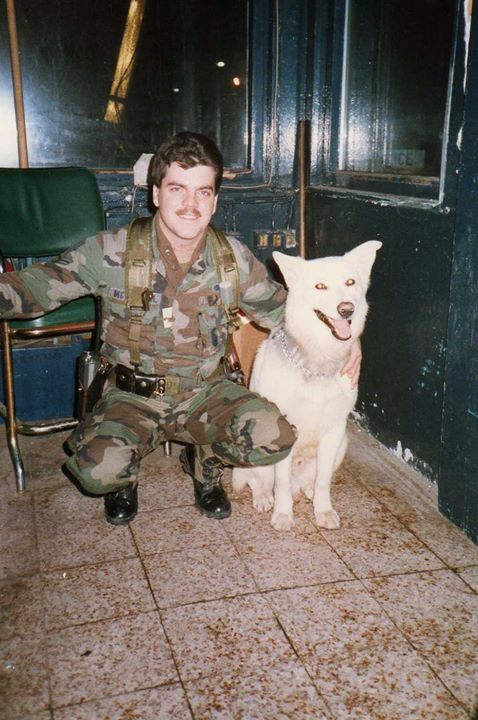 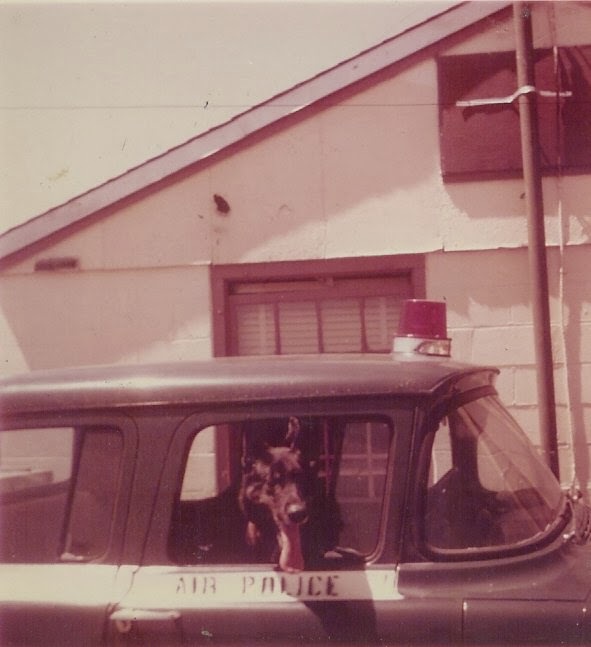 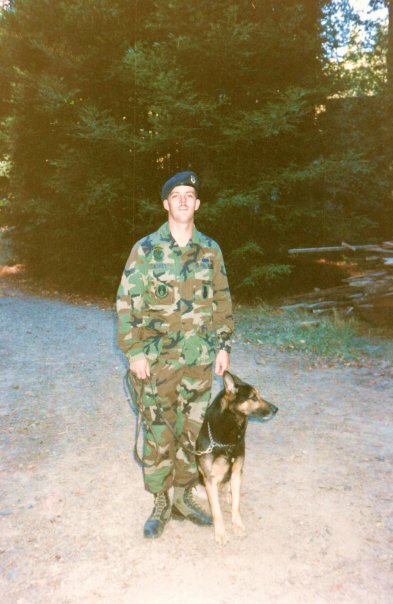 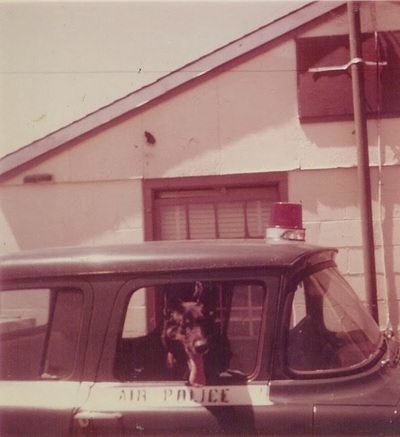 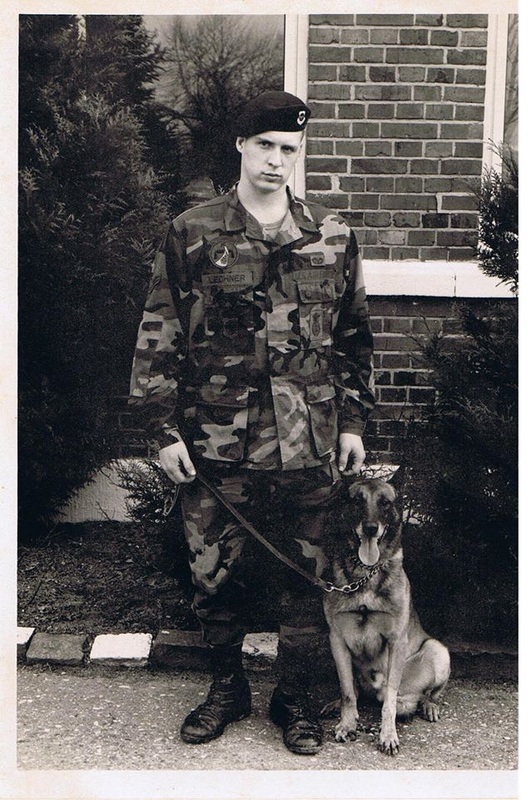 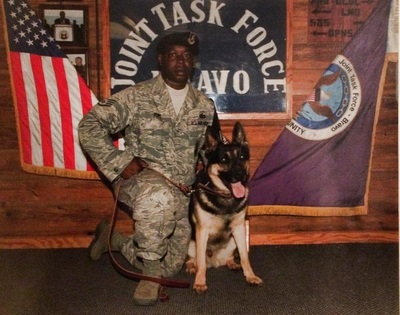 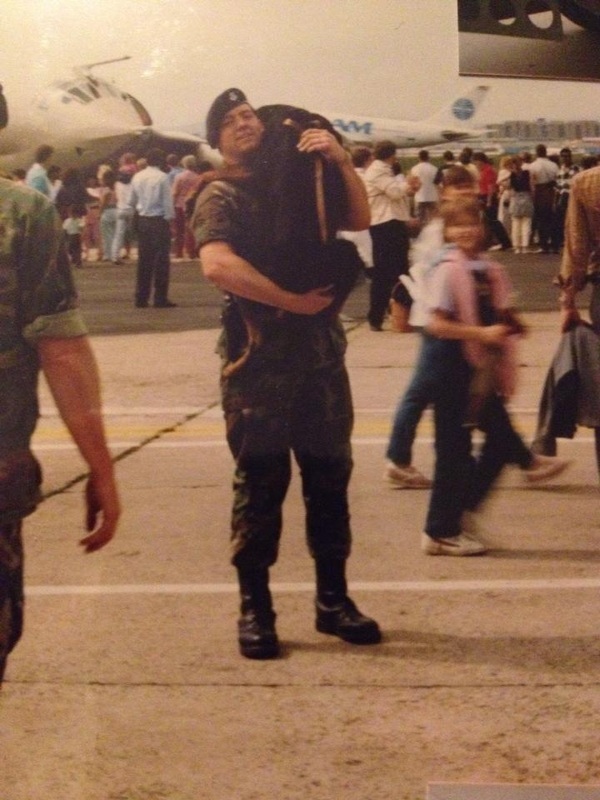 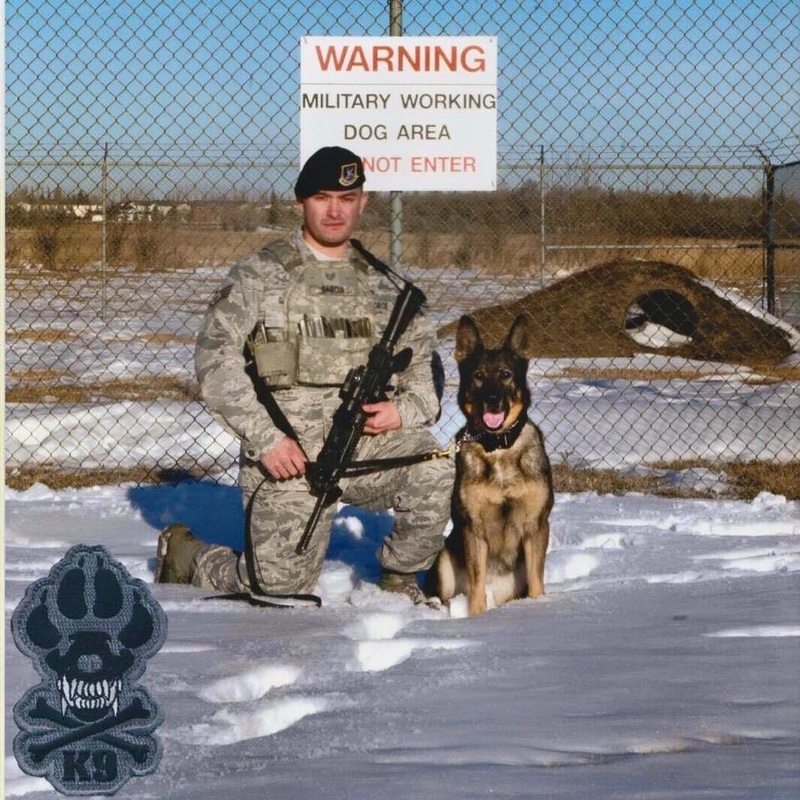 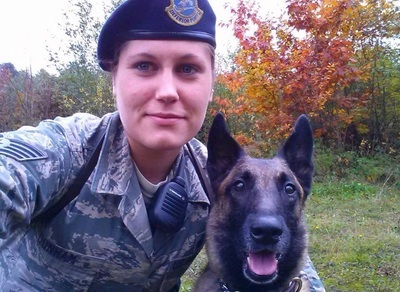 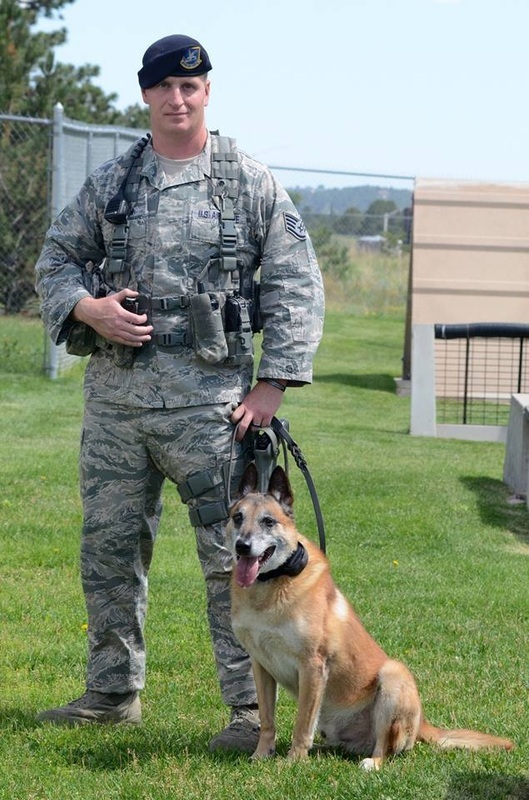 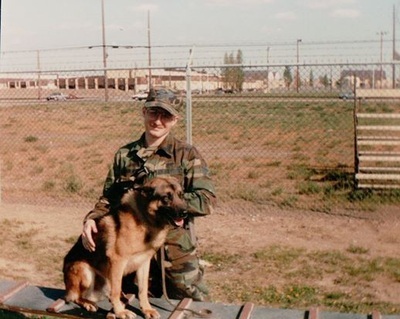 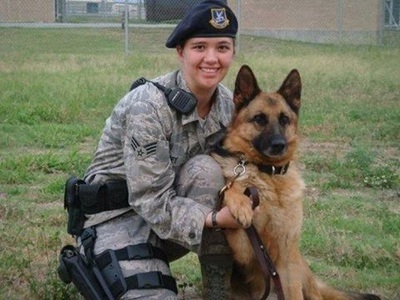 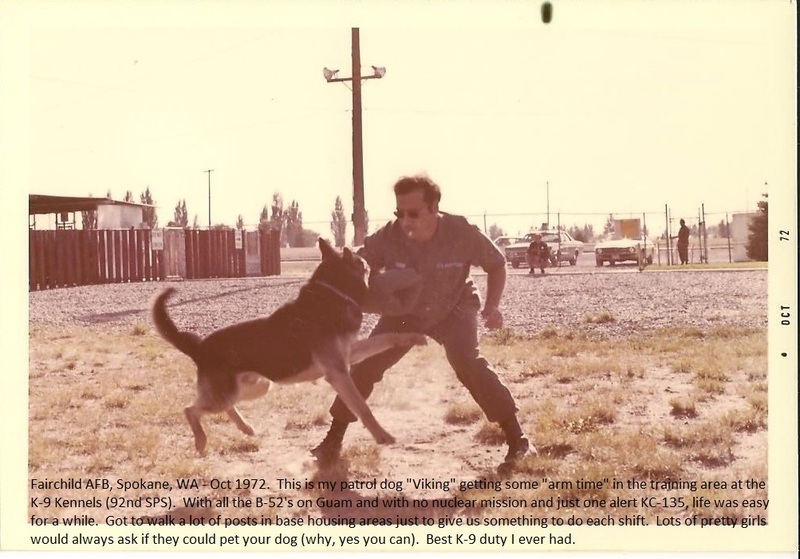 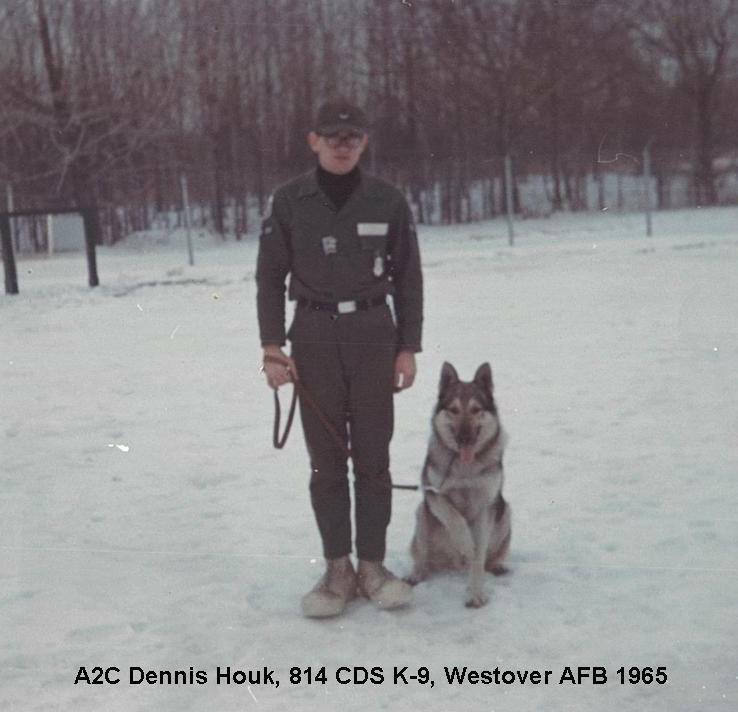 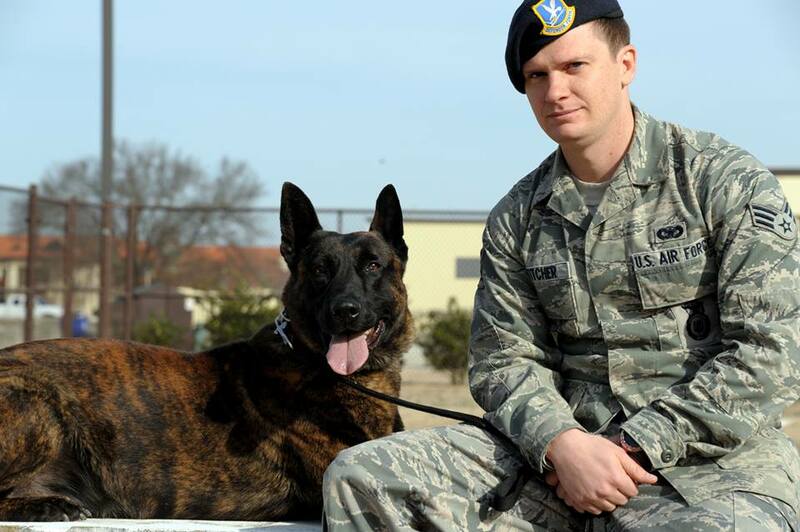 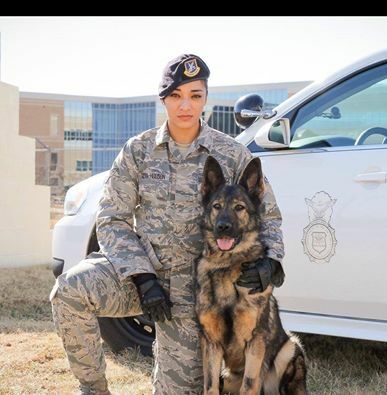 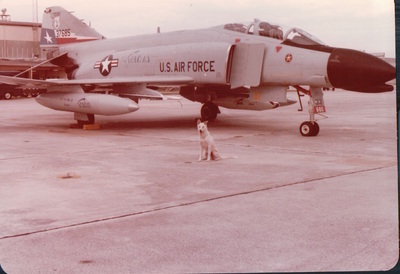 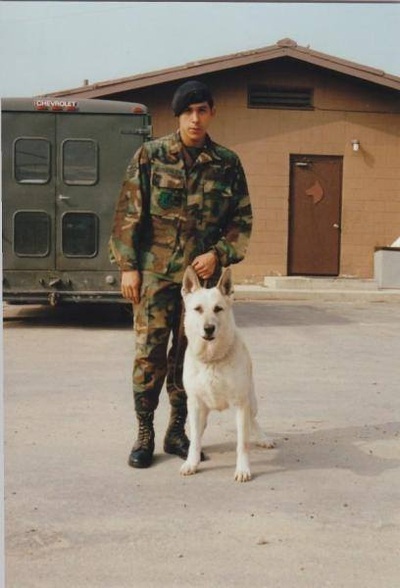 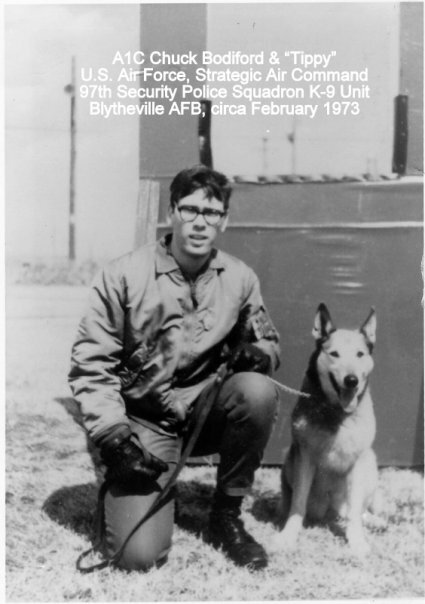 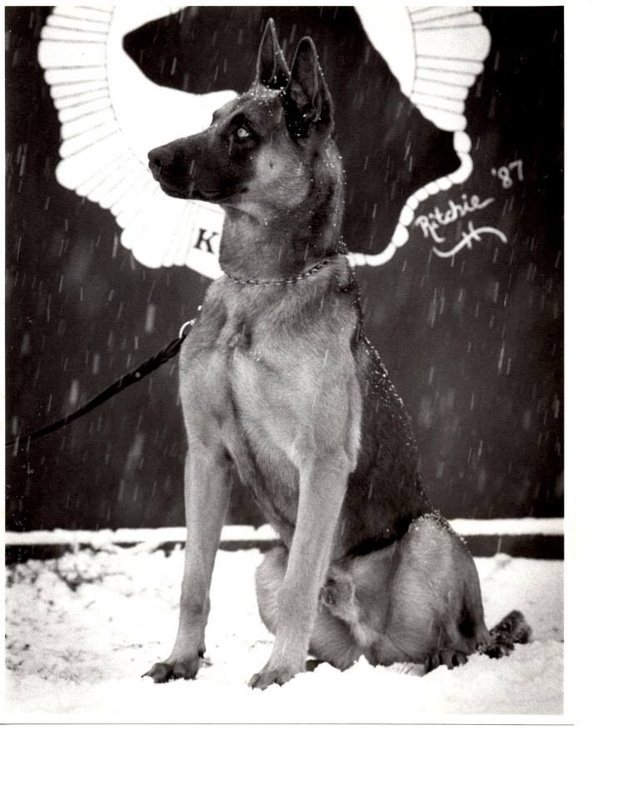 Nemo was only one of the many dogs who served, and continue to serve, faithfully and honorably in the United States Air Force. 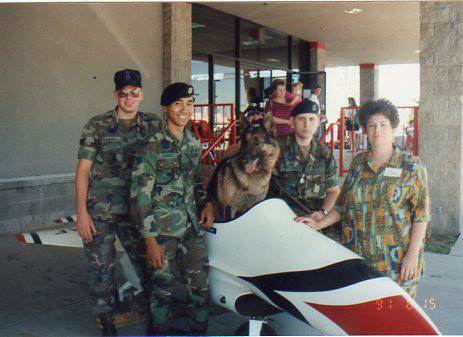 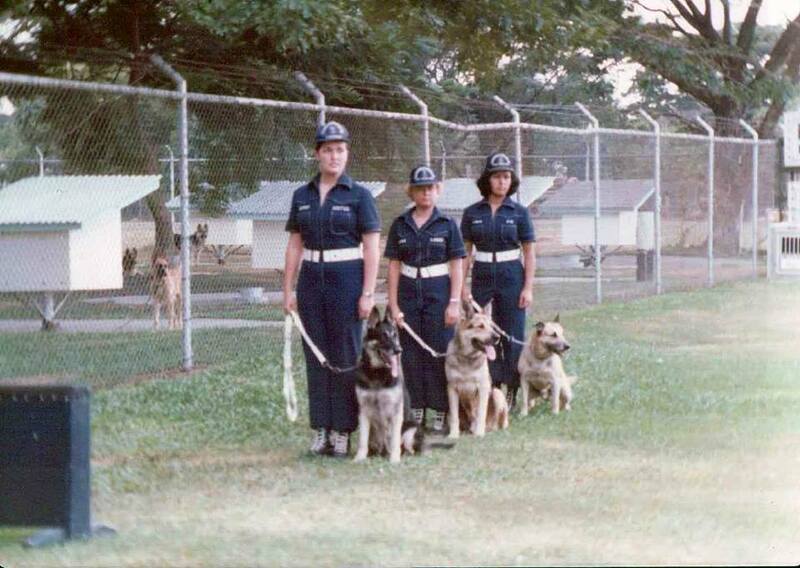 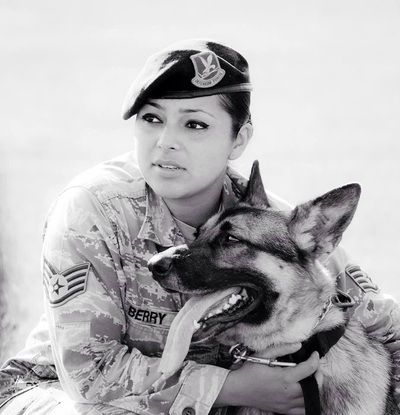 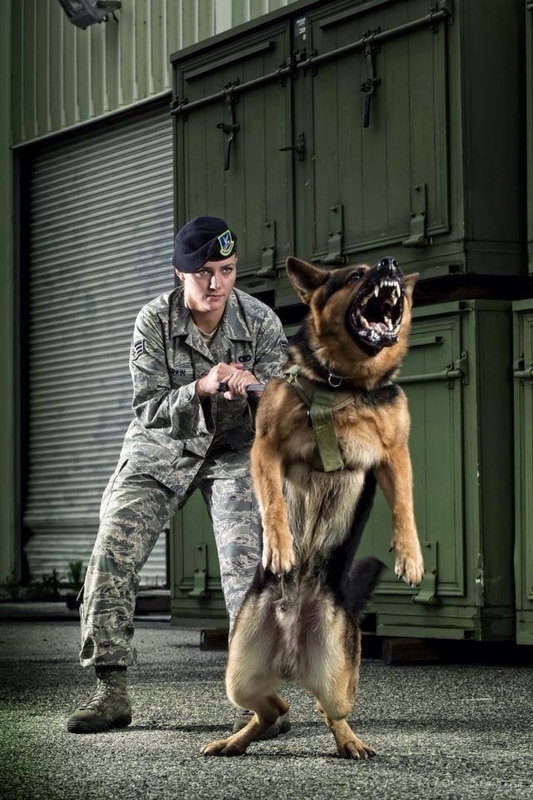 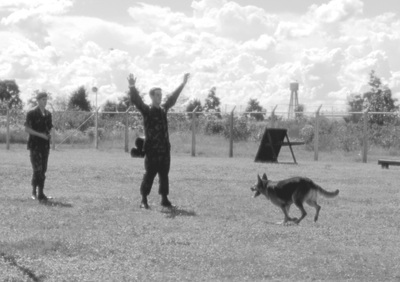 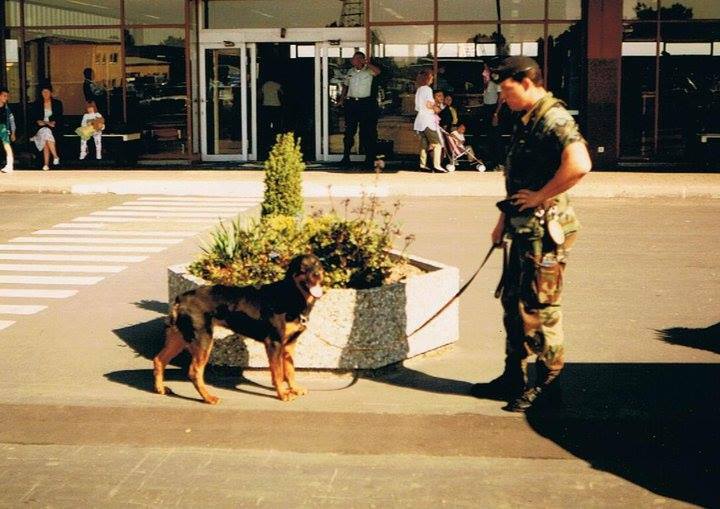 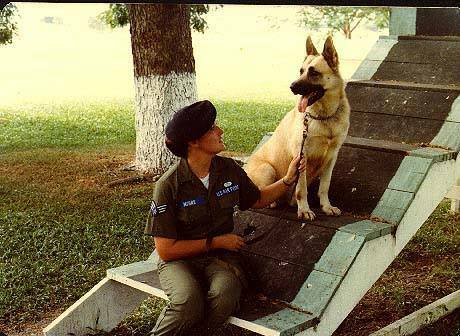 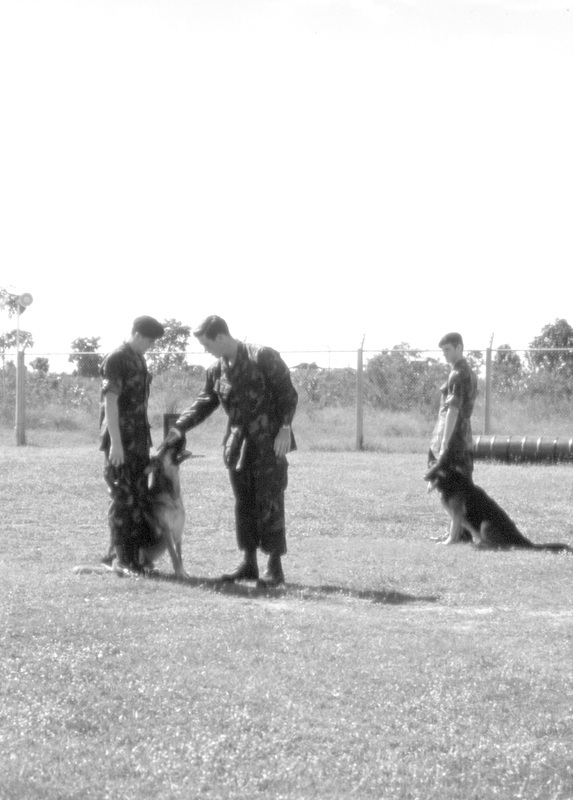 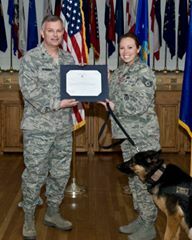 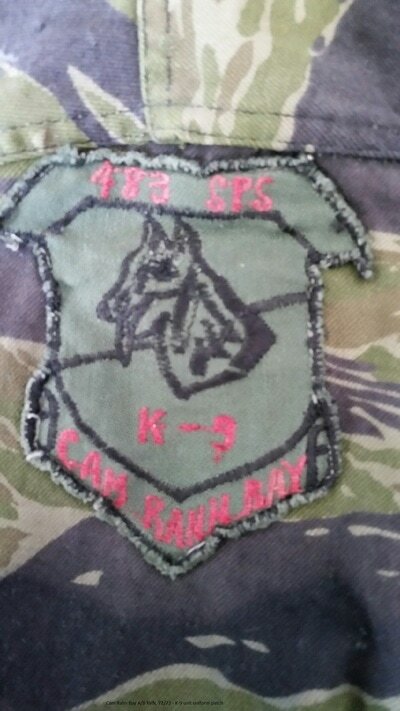 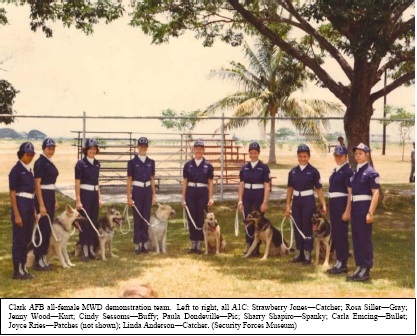 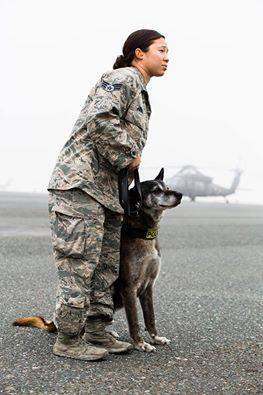 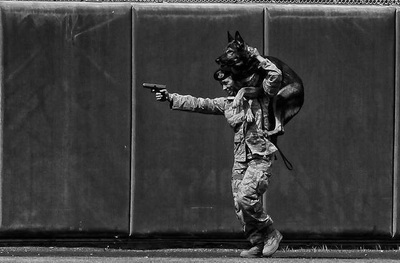 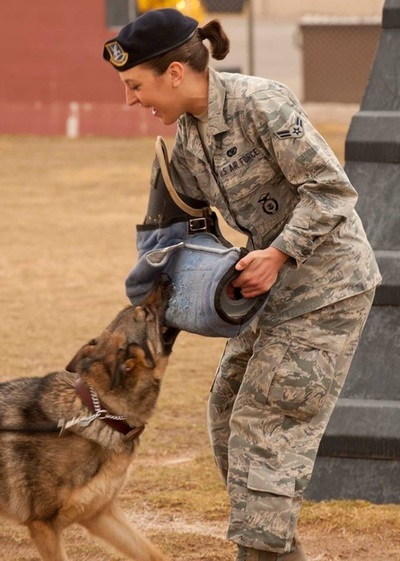 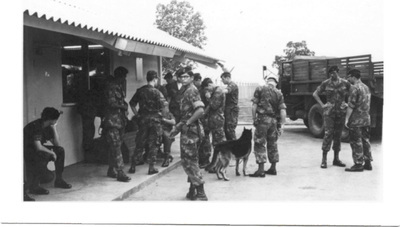 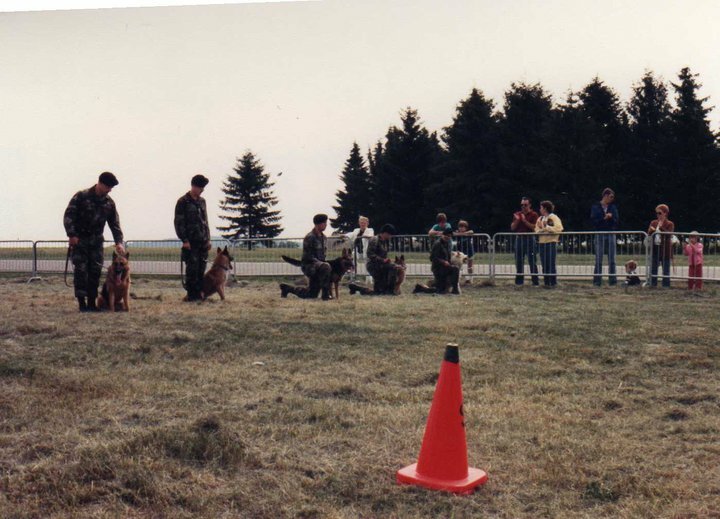 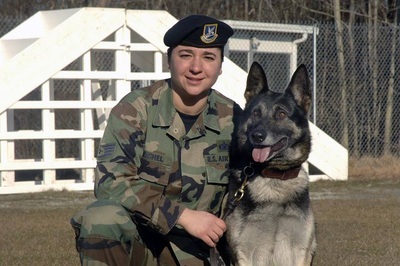 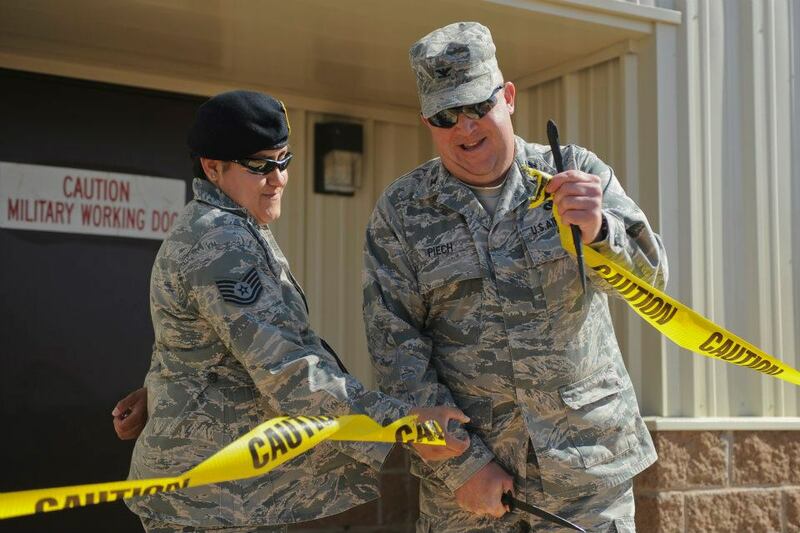 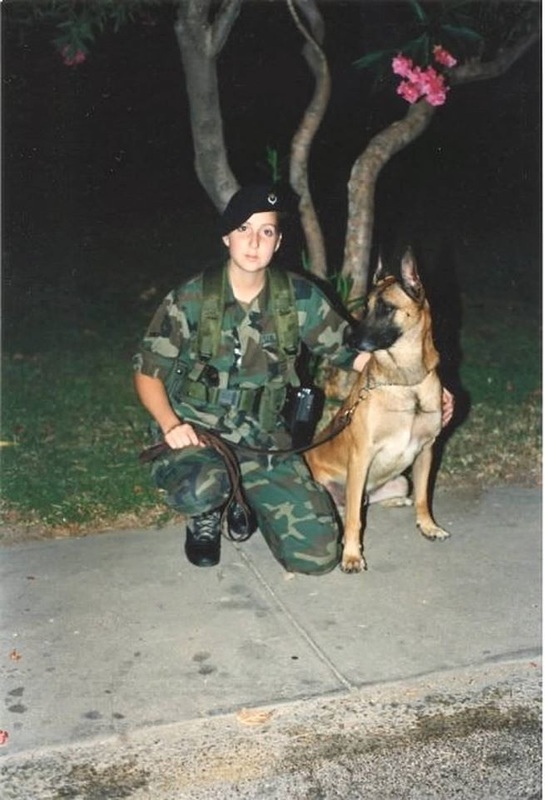 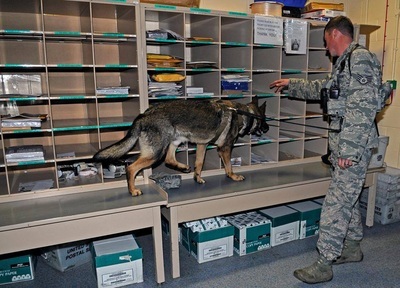 first all-female MWD exhibition team had been formed by the 3rd SPS at Clark AFB, Philippines. 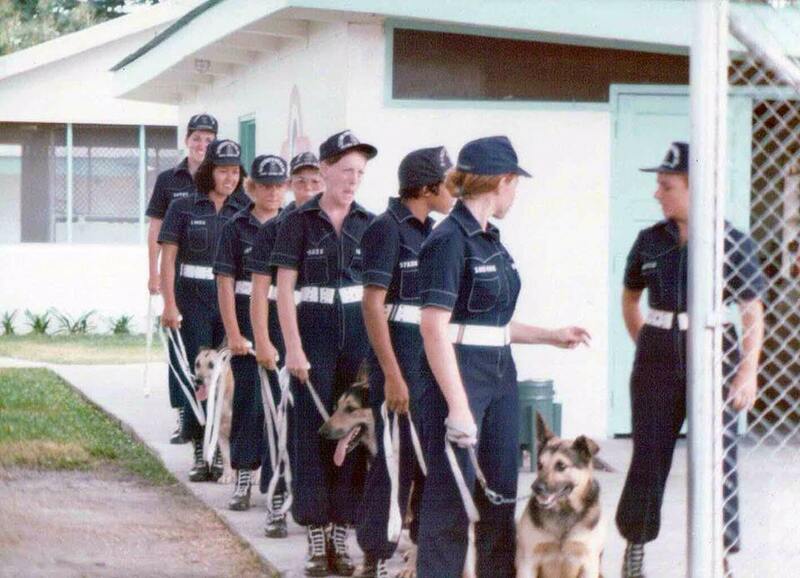 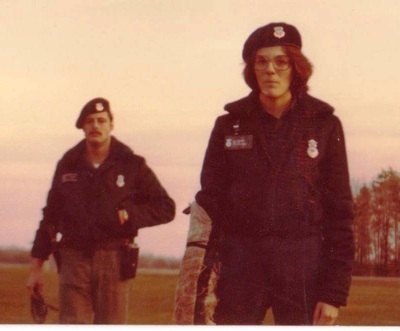 Nine women, A1C Rosa Siller, A1C Jenny Wood, A1C Cindy Sessoms, A1C Sherry Shapiro, A1C Paula Dondeville, A1C Joyce Ries, A1C Linda Anderson, A1C Strawberry Jones, and A1C Carla Emcing formed the team and by early 1976 had made the cover of the Security Police Digest. 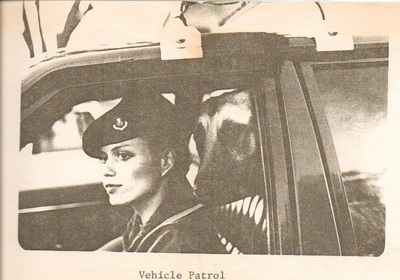 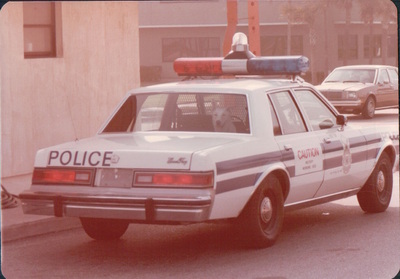 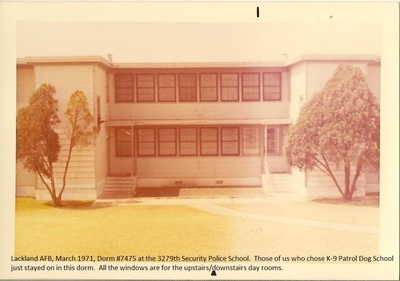 By the time they were profiled in the Security Police guard mount, 1974 (Col Jerry M. Bullock) Digest, the women had performed before over 20,000 people and the base was receiving an average of 15 requests for appearances each month. 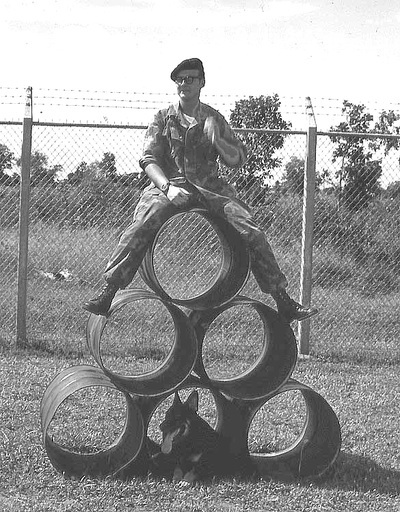 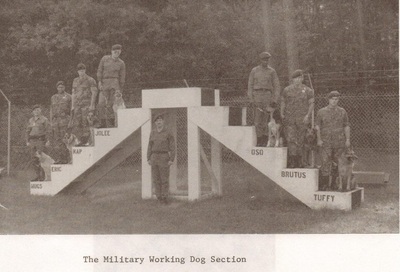 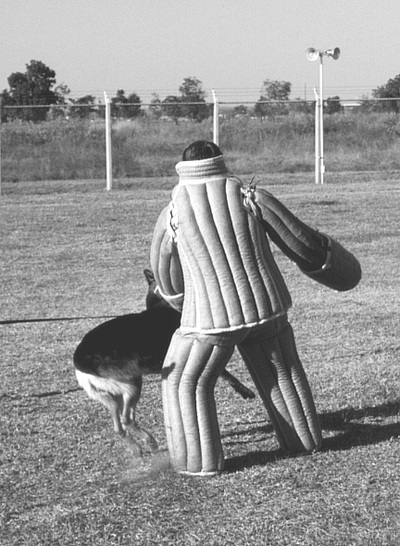 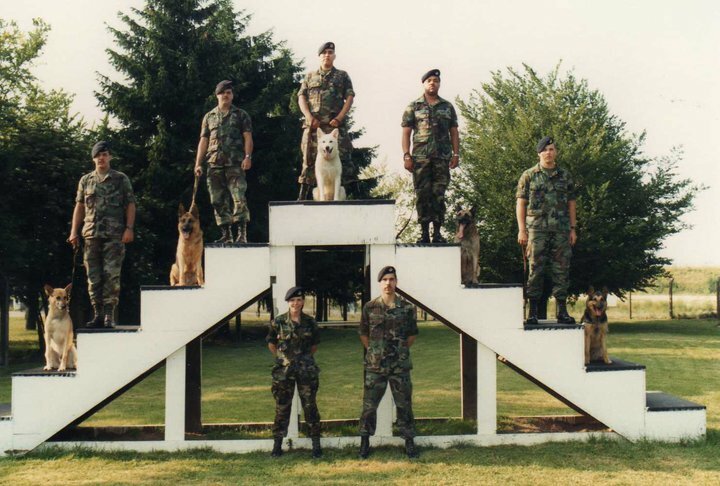 The kennel master at Clark proclaimed them to be “the finest precision demonstration team he [had] seen in 19 years as a ‘dog man’. 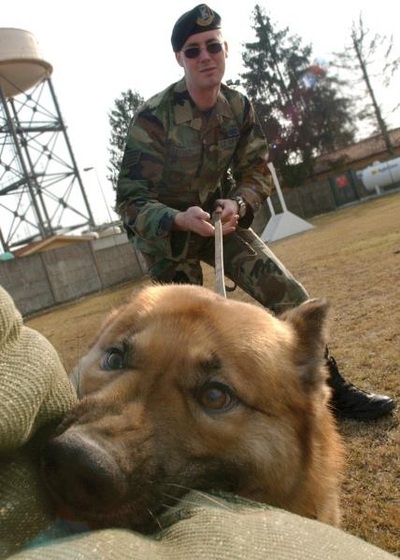 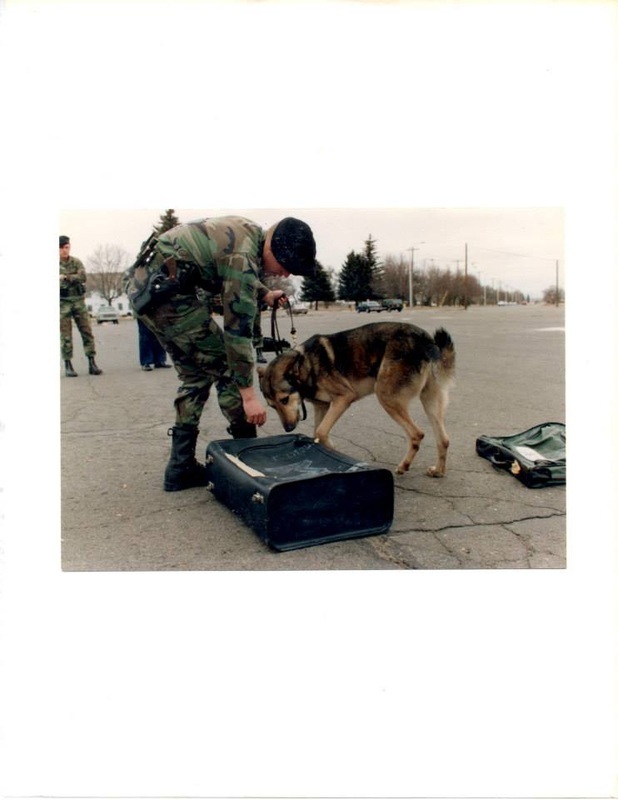 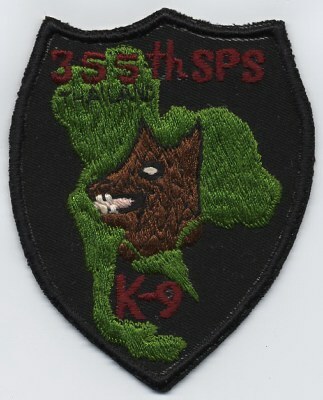 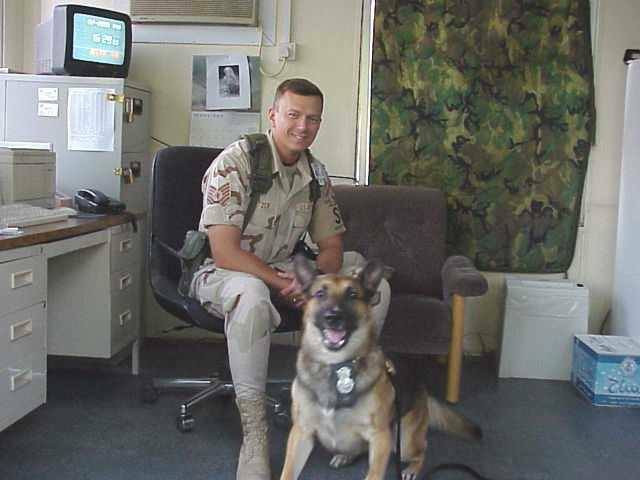 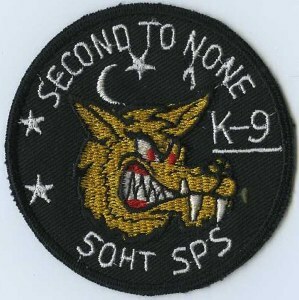 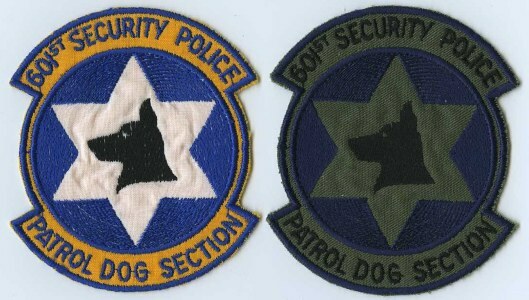 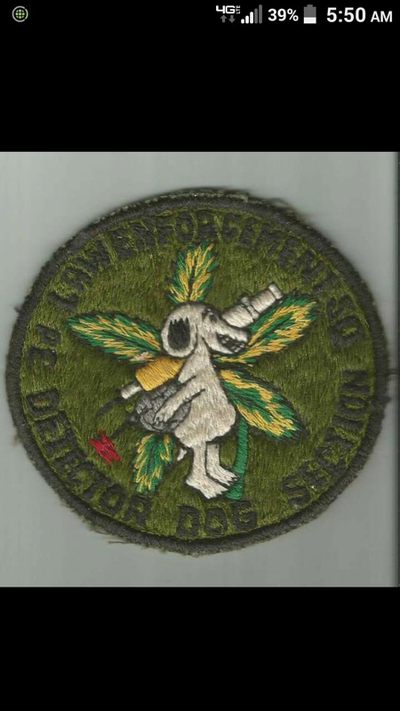 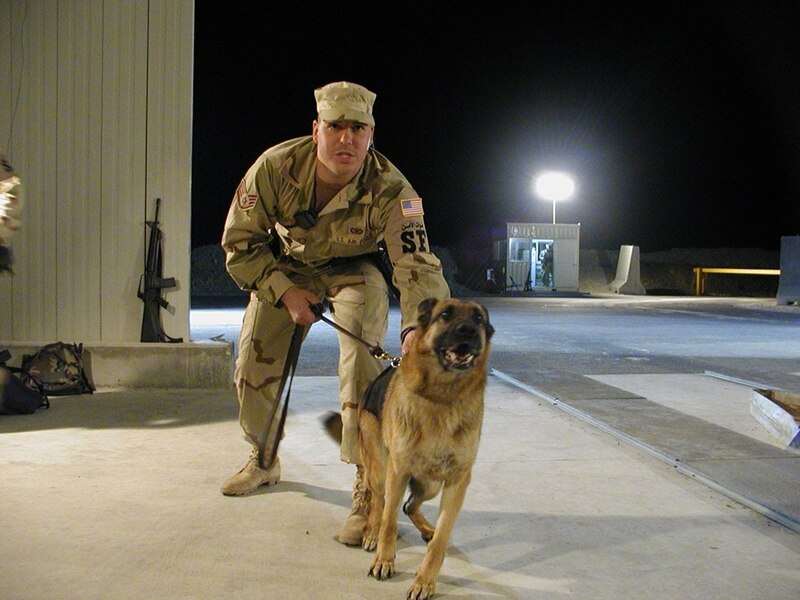 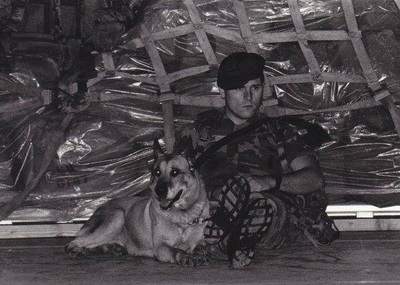 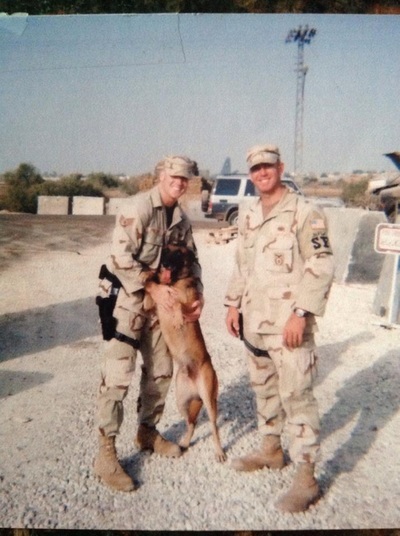 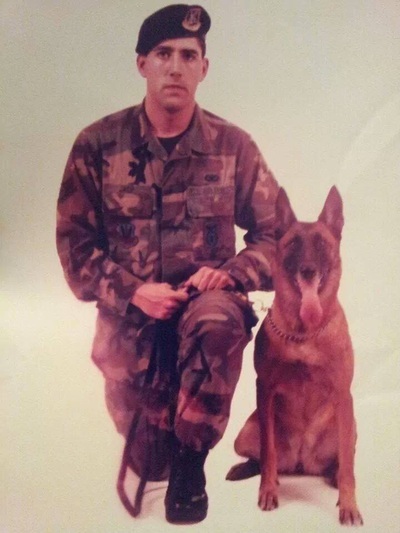 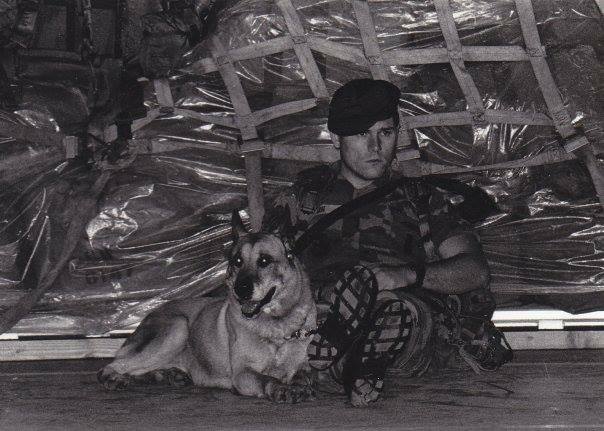 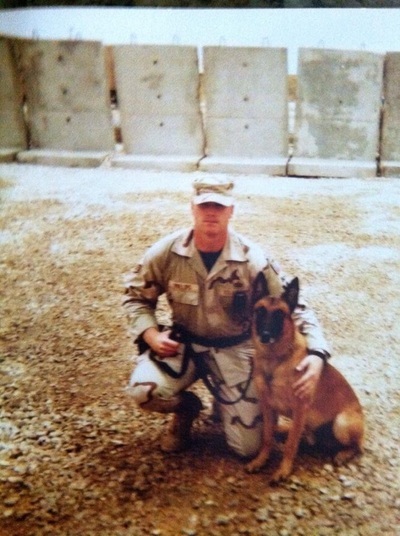 In May 2004, the first 12 Air Force Patrol/Explosive Detector Dog (PEDD) teams were attached to the Marine Corps to help support the needs of line infantry companies combating enemy insurgents in Iraq. 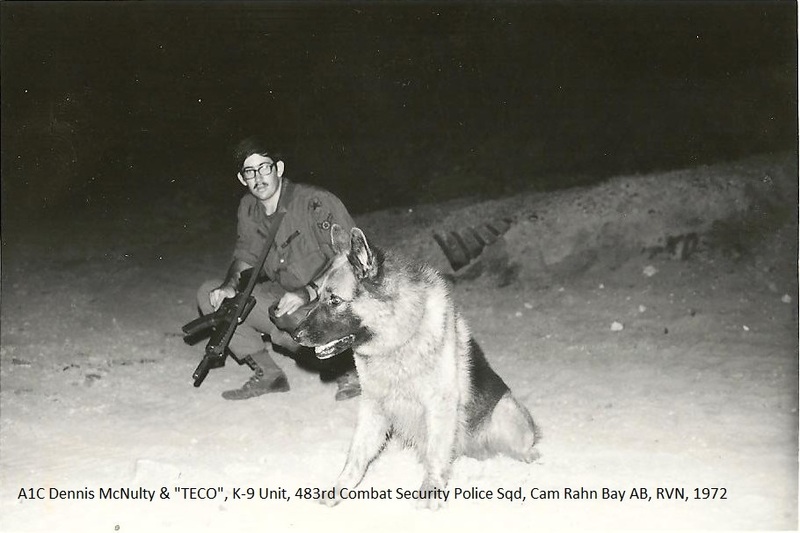 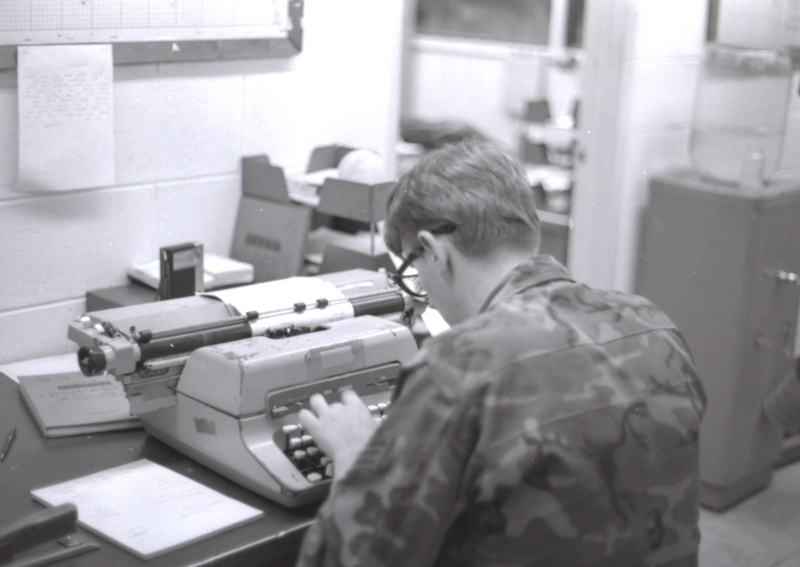 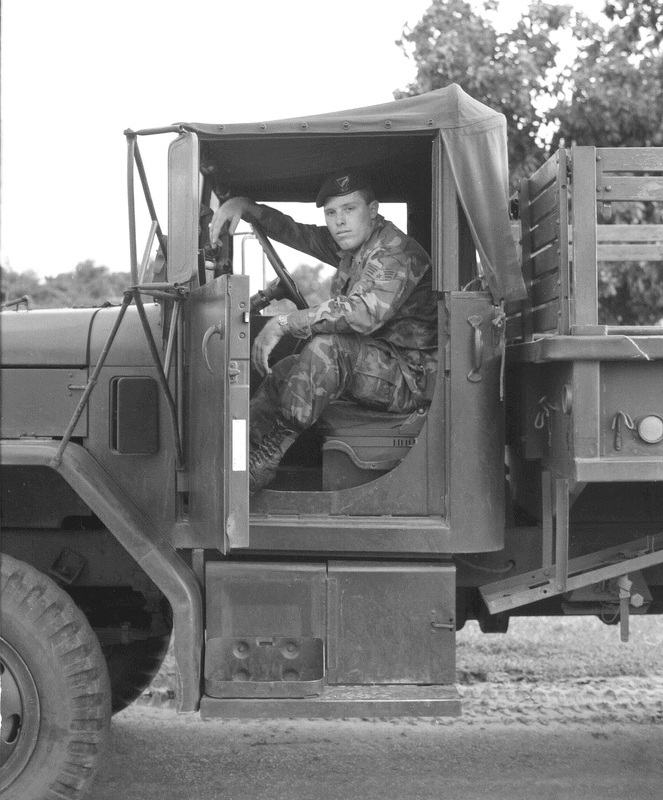 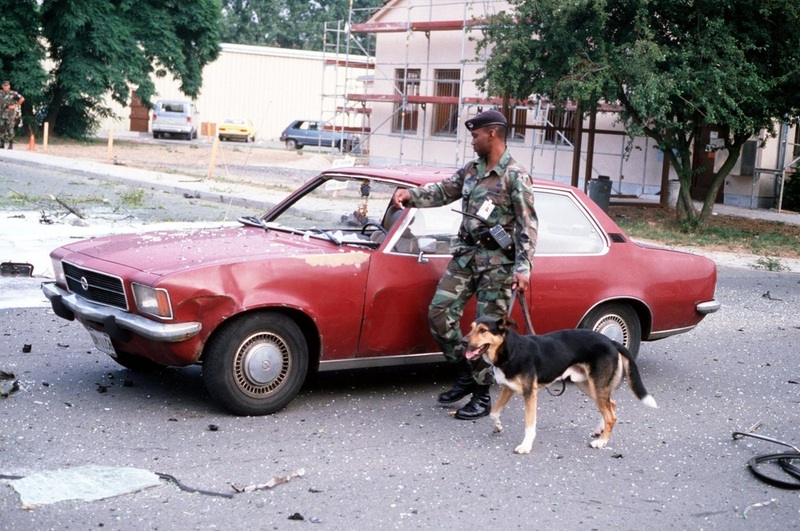 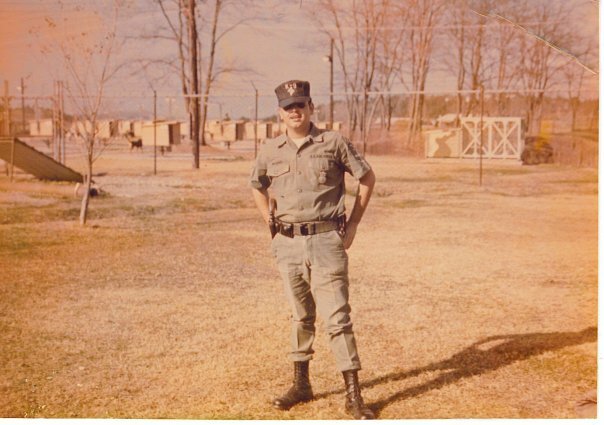 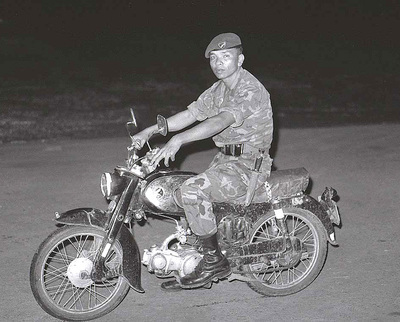 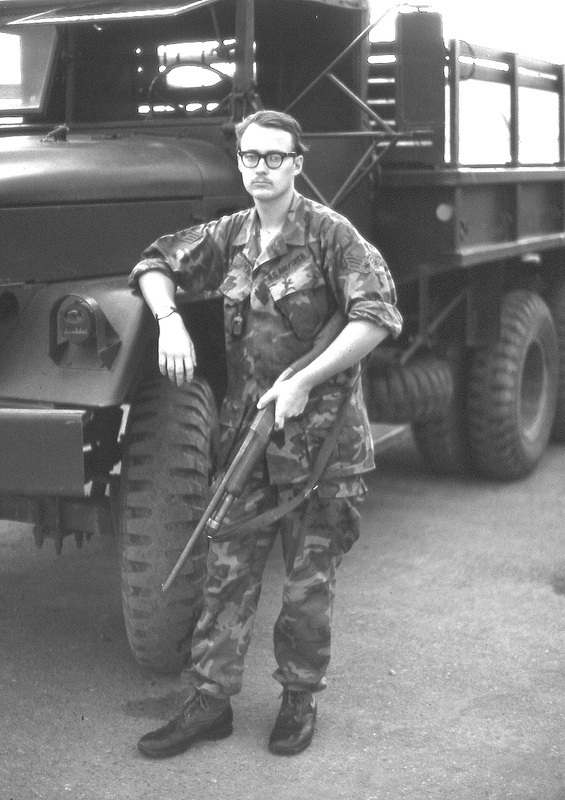 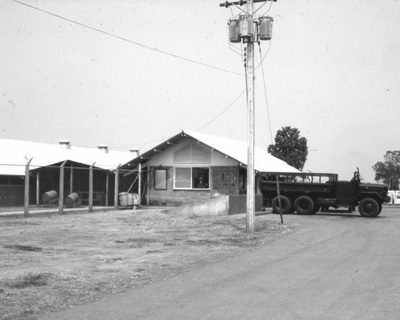 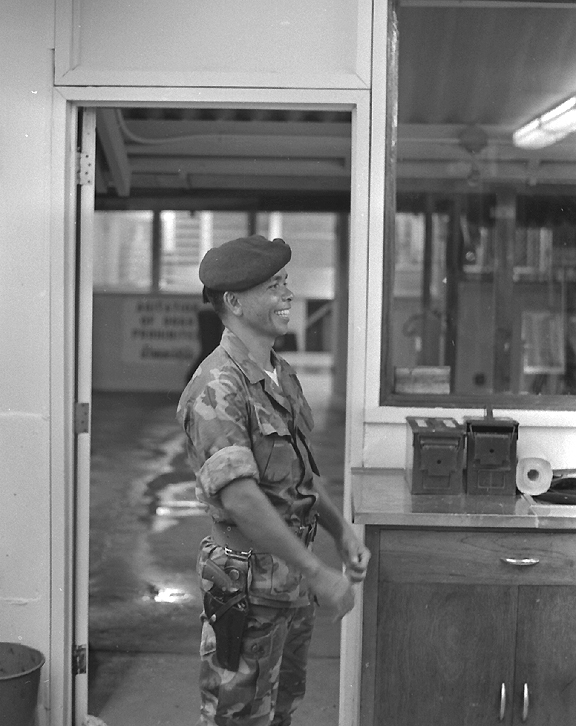 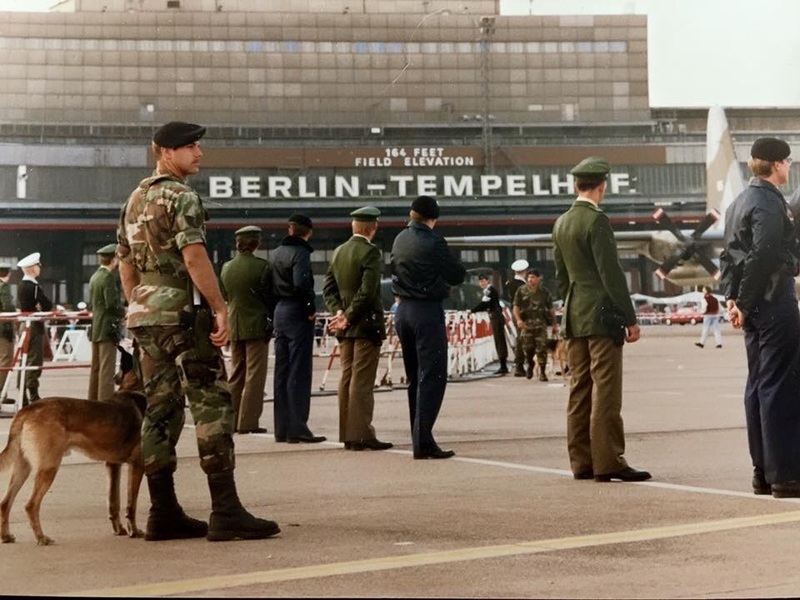 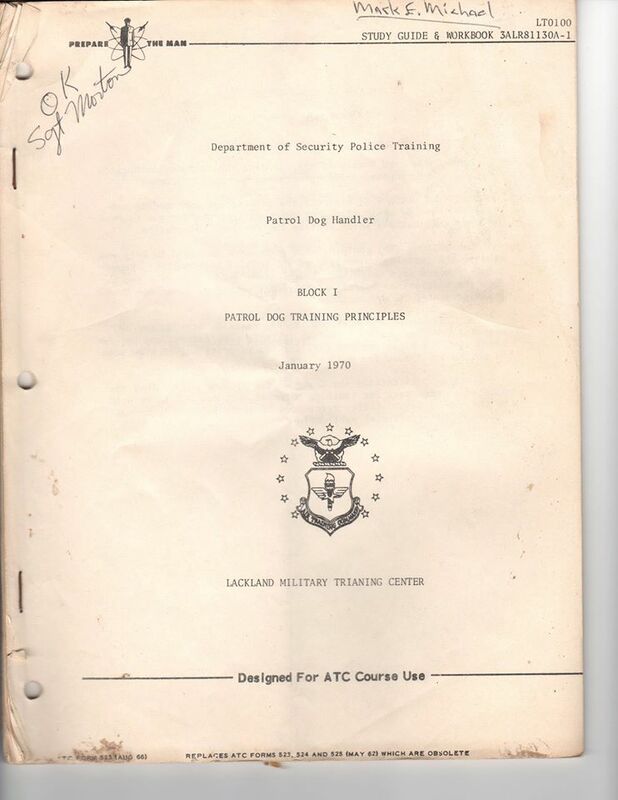 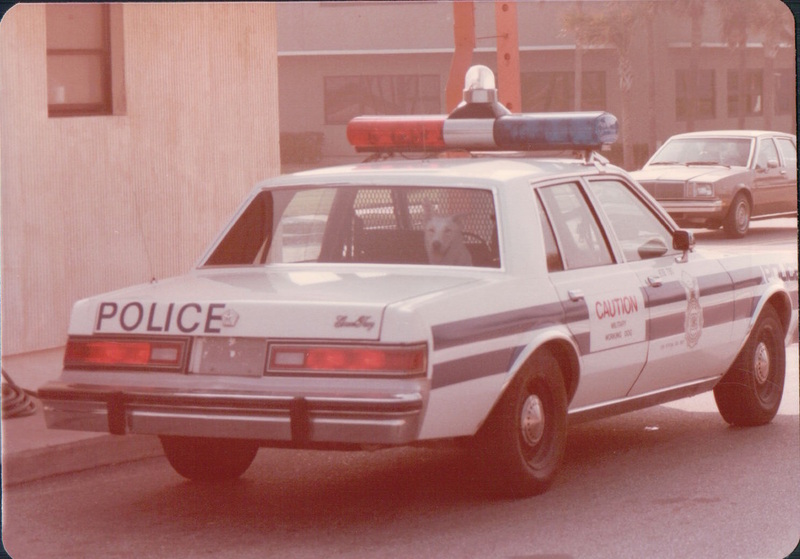 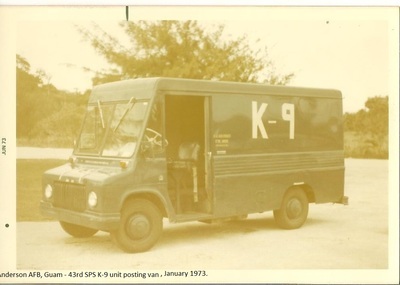 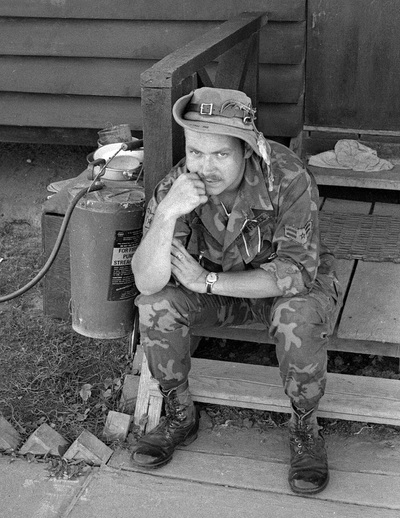 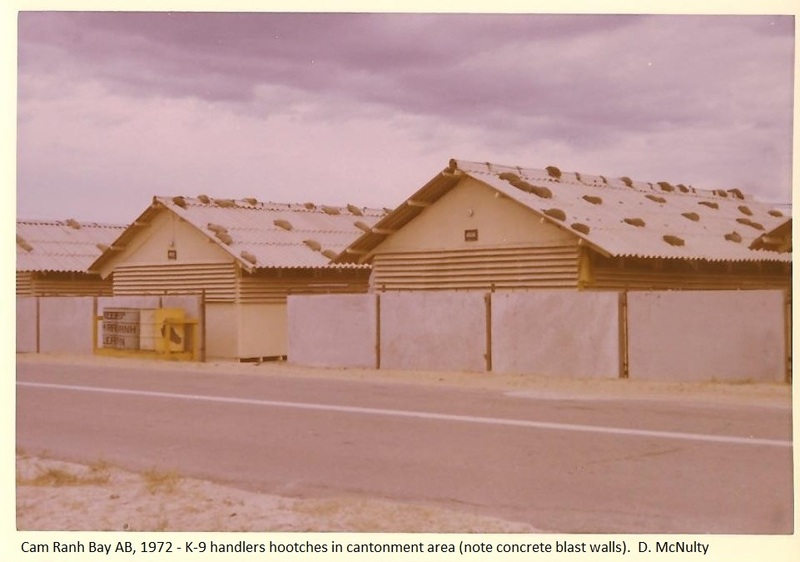 Some of the roles these teams filled were as combat patrol point men, traffic control point vehicle search teams, Improvised Explosive Device detectors, and explosive cache search teams. 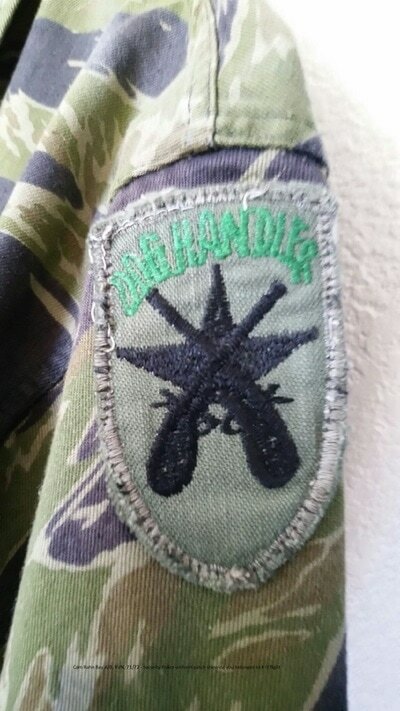 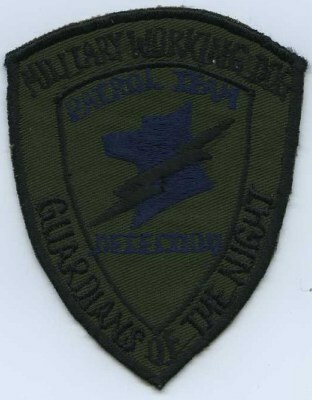 These PEDD teams served in several operations including Operation PHANTOM FURY in November 2004 when the city of Fallujah was captured from insurgent forces who had taken the city from its inhabitants through fear and murder. 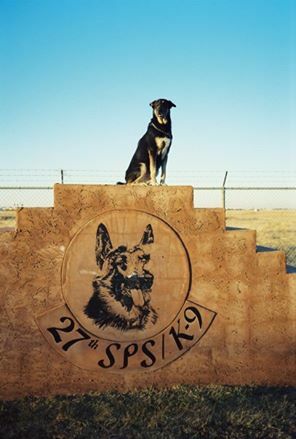 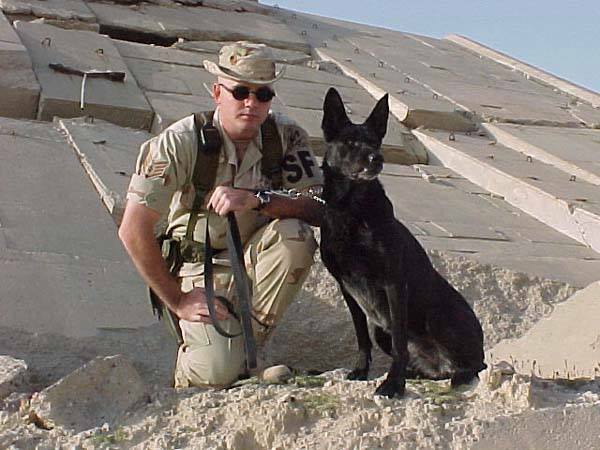 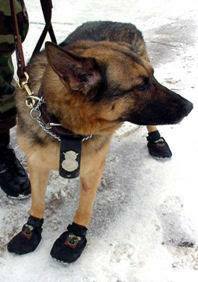 On April 4, 2005, the Specialized Service Dogs (SSD) program was established in an effort to counter IEDs. The SSD is an explosive detector dog only with advanced training to work off-leash at an extended distance away from the handler. 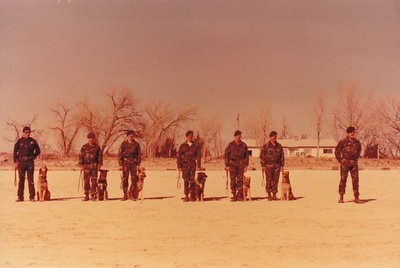 These MWDs have personality traits that differ from most MWDs that are trained to attack. 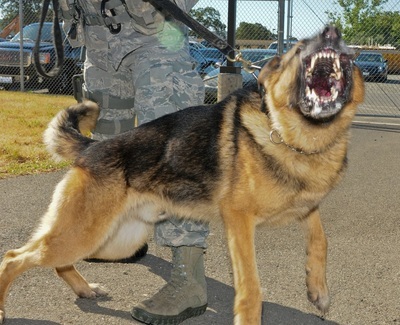 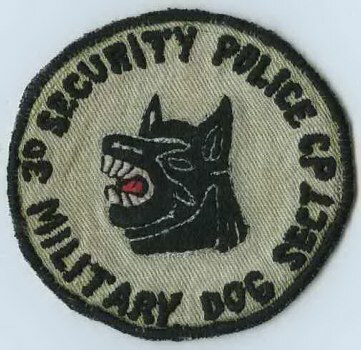 These dogs are not trained to bite and are capable of working in large crowds without the concern the MWD will attack civilians. 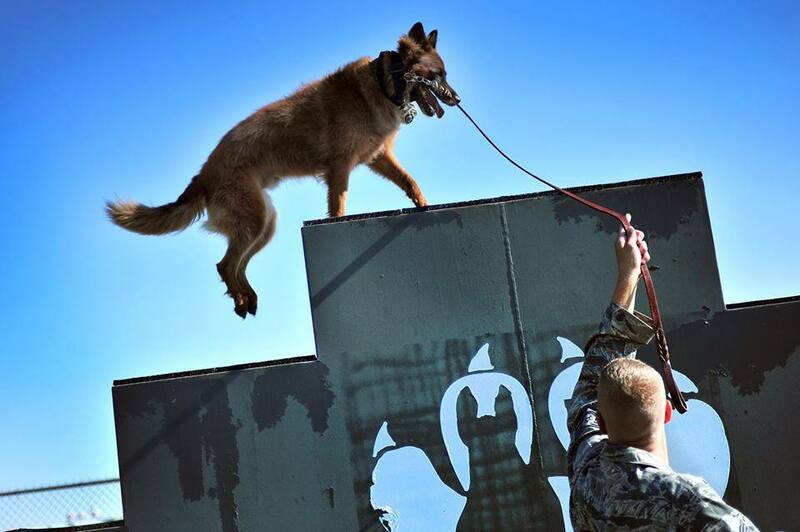 As contingency operations change, the MWD program will continue to adapt to meet the needs of the mission. 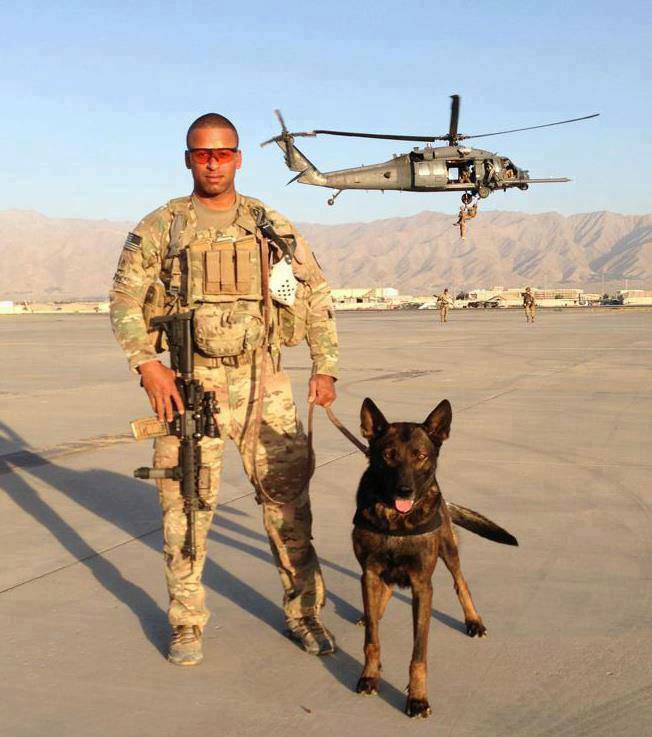 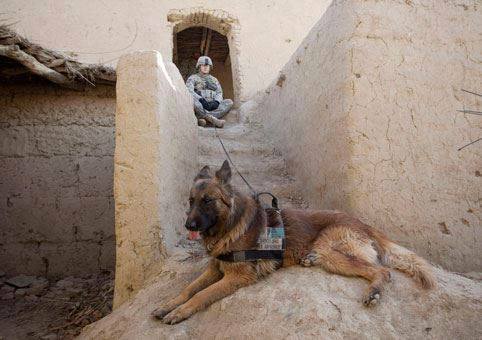 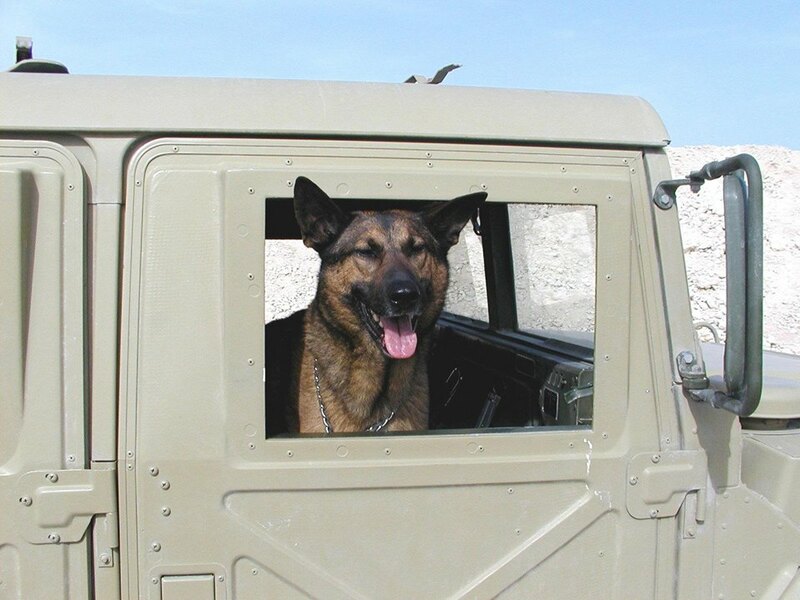 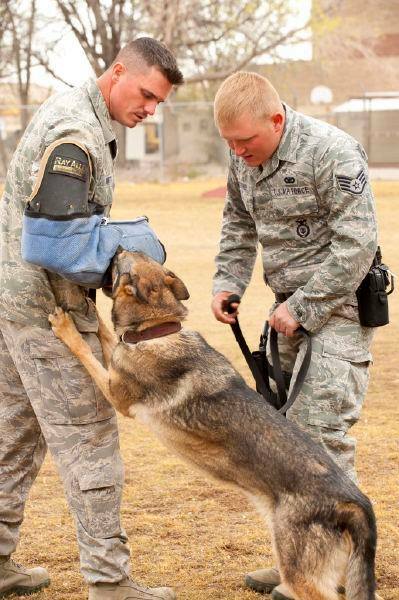 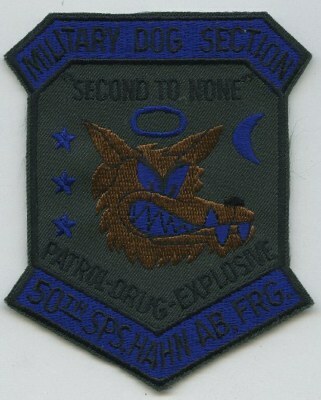 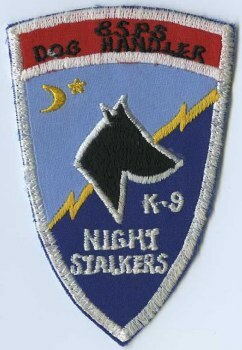 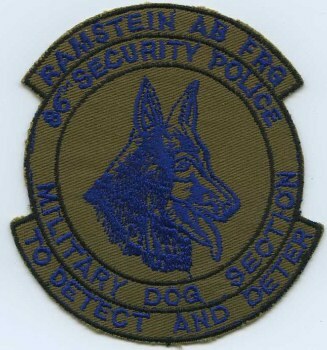 June 26, 2012 - Bomb dogs are integral to the NATO mission in Afghanistan. By clearing routes of Improvised Explosive Devices (IEDs) and sniffing out other explosive ordinance, they're helping to save the lives of coalition and Afghan forces. 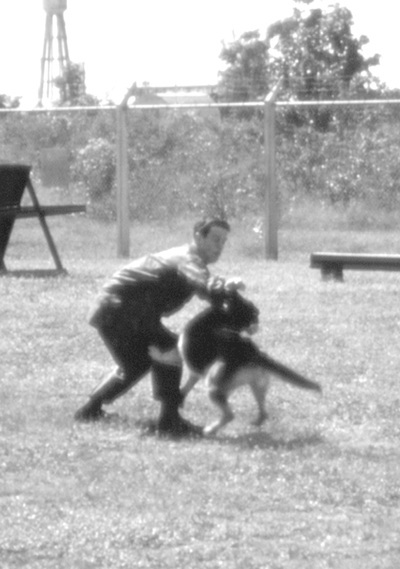 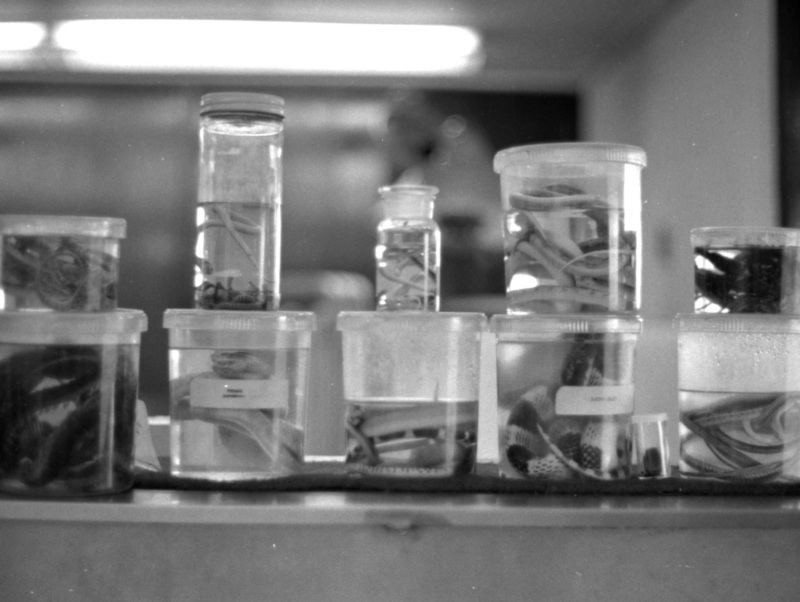 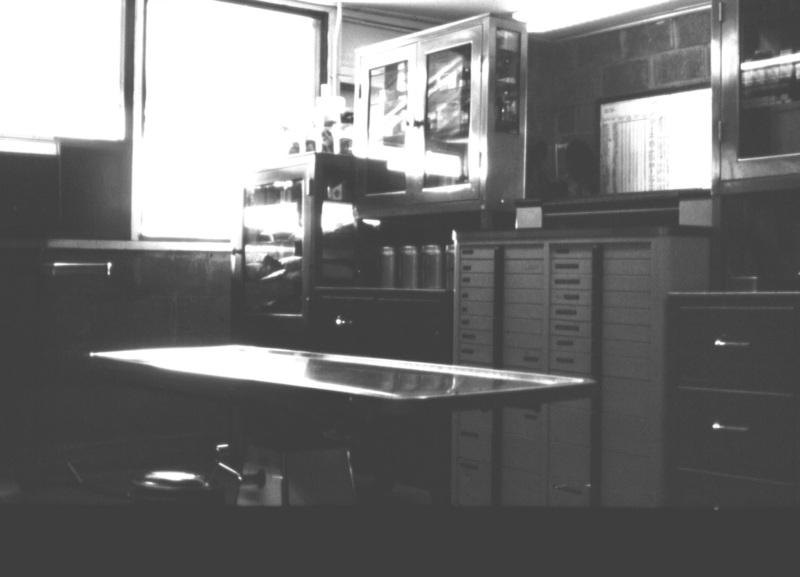 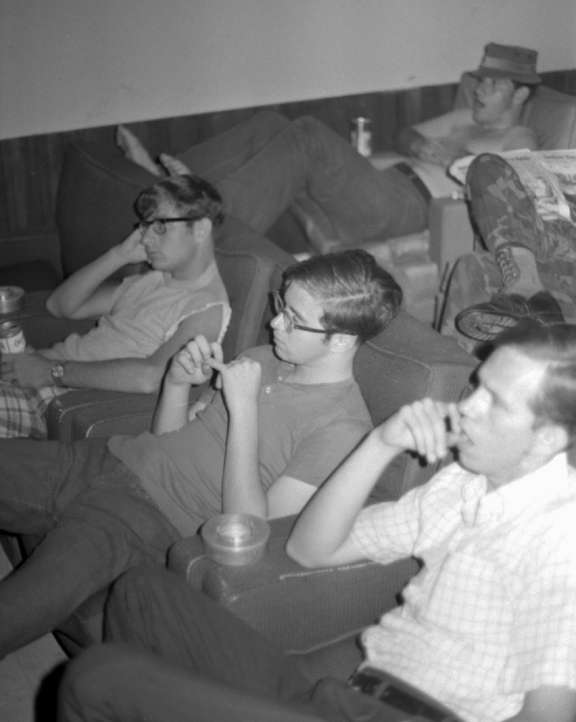 This film looks at the relationship between two handlers and their canines. 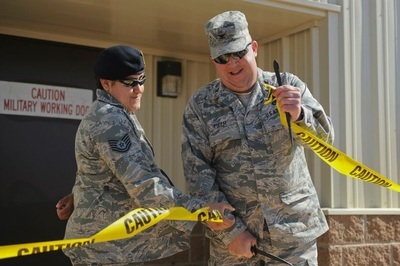 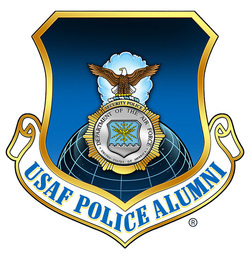 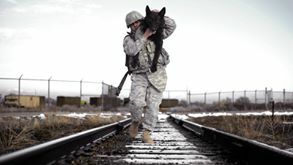 Includes sound bites from Staff Sgt Tim Castillo and Staff Sgt Witney Young, U.S. Air Force 455th Expeditionary Security Forces Squadron. 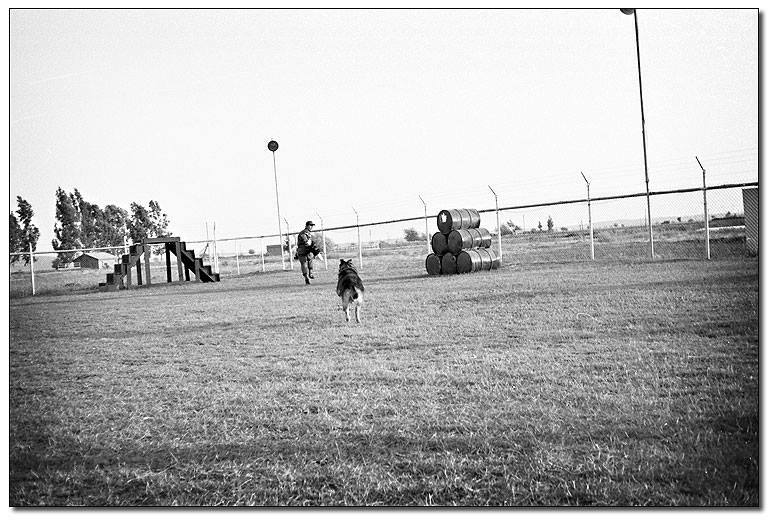 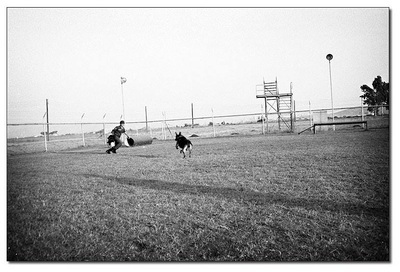 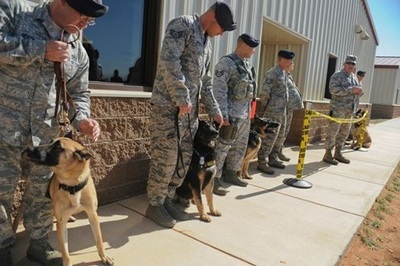 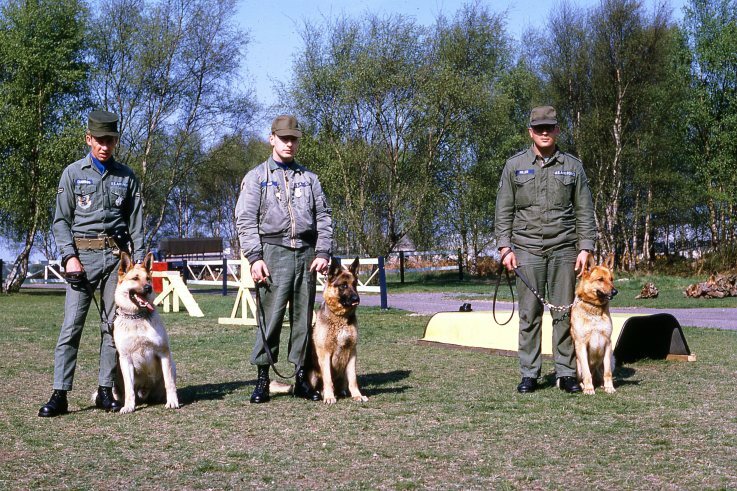 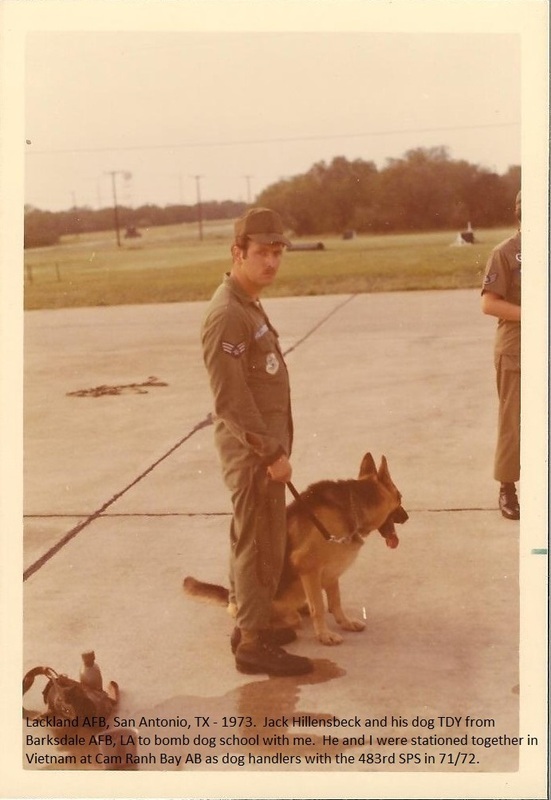 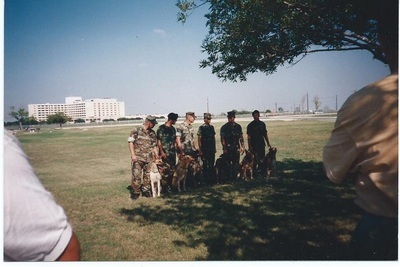 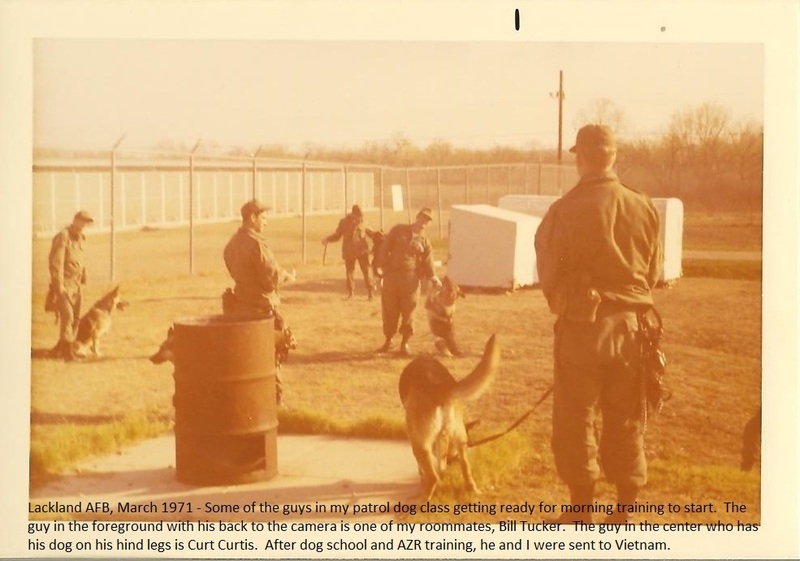 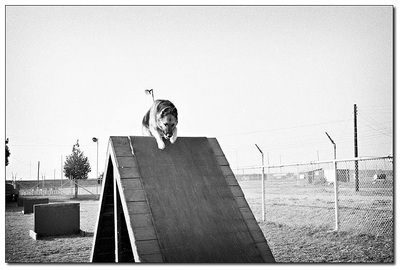 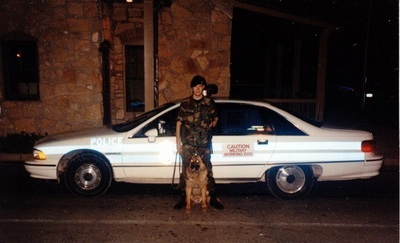 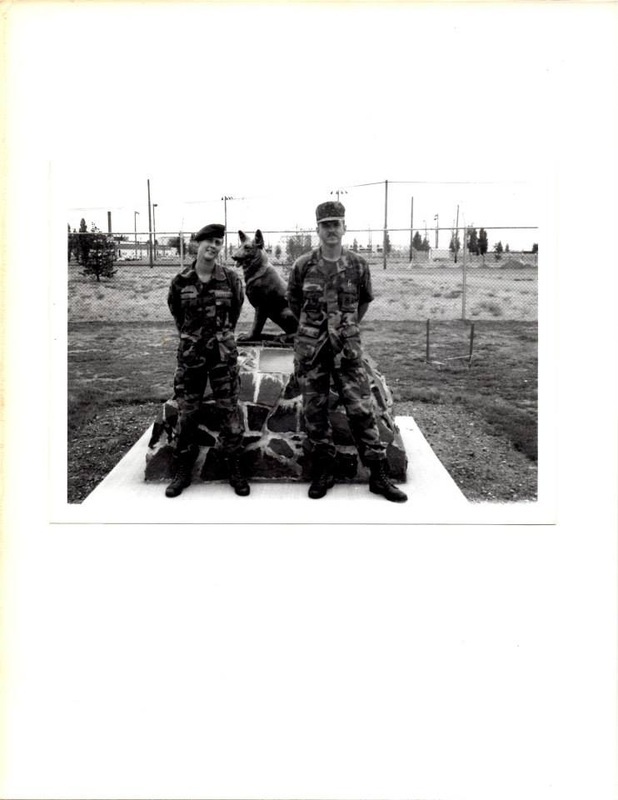 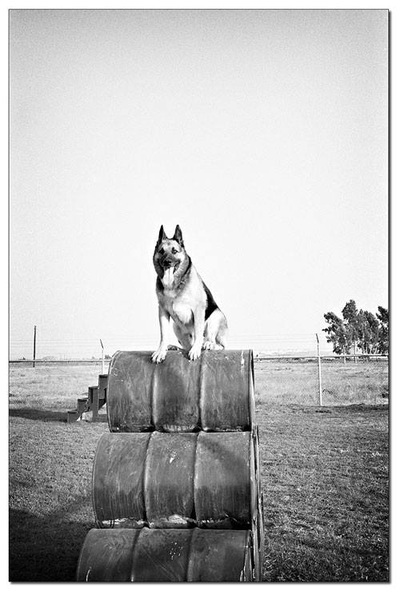 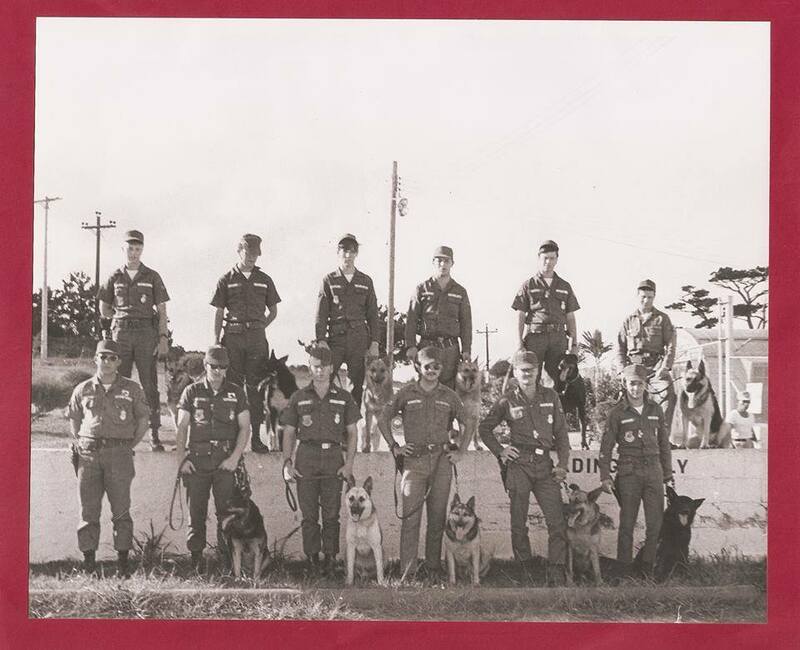 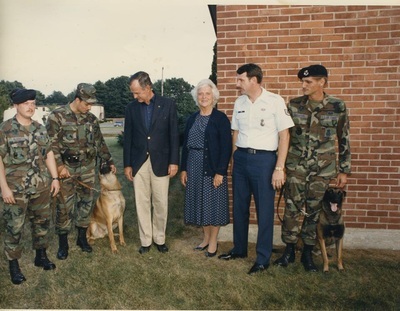 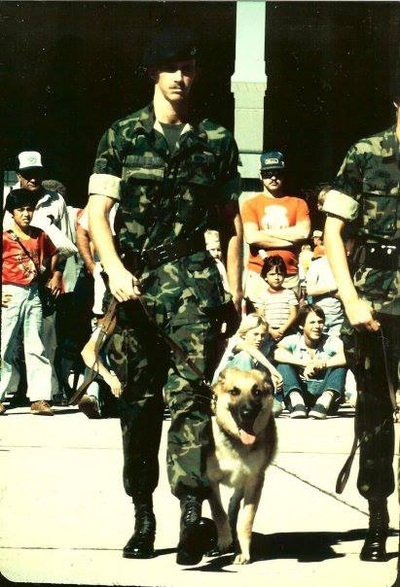 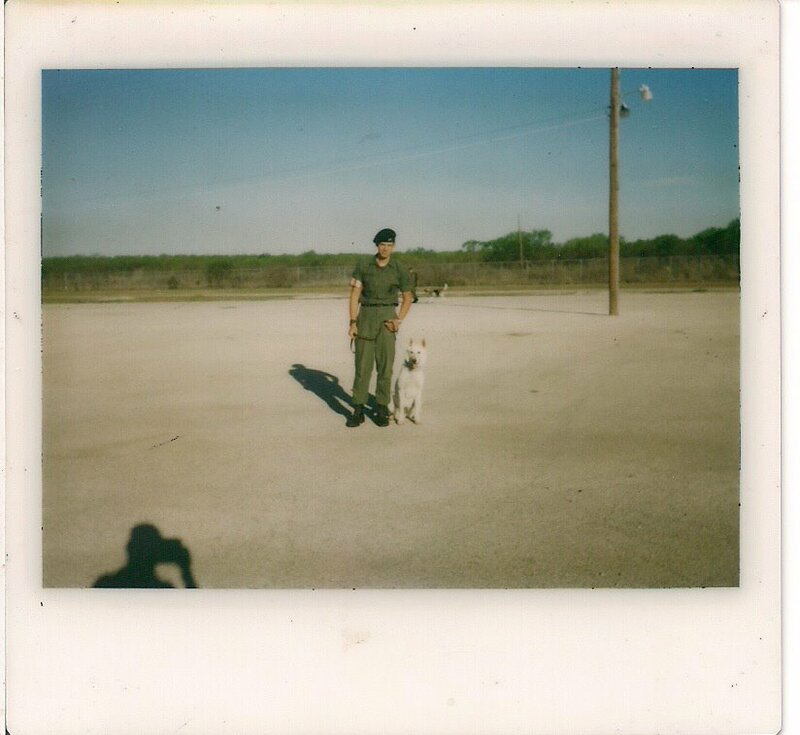 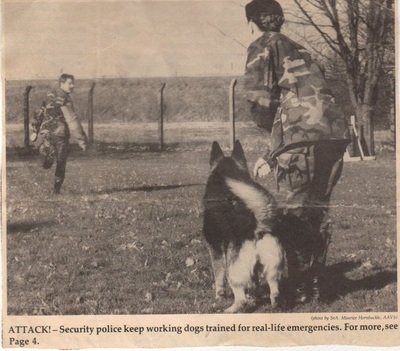 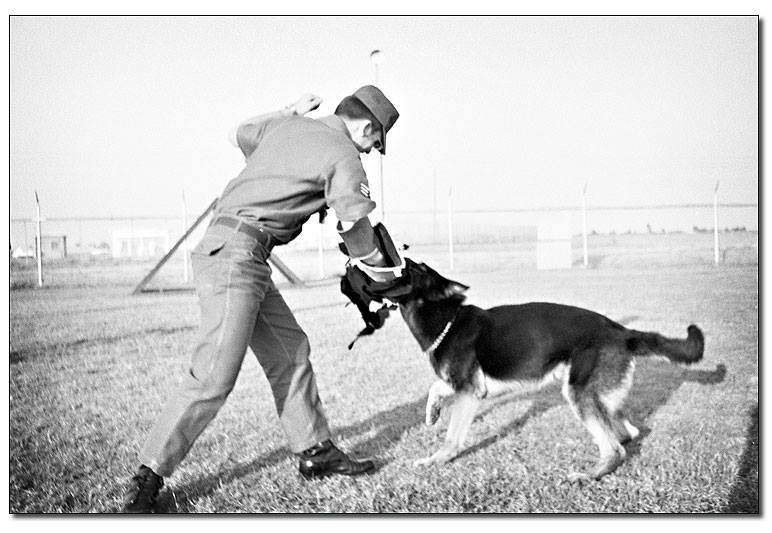 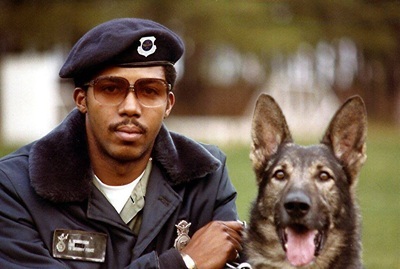 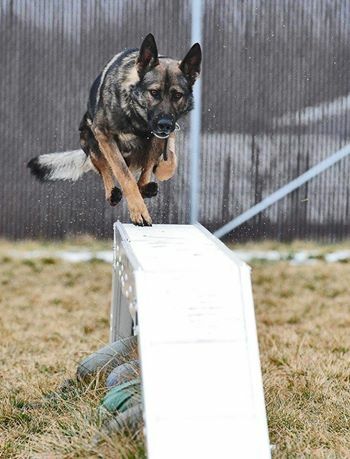 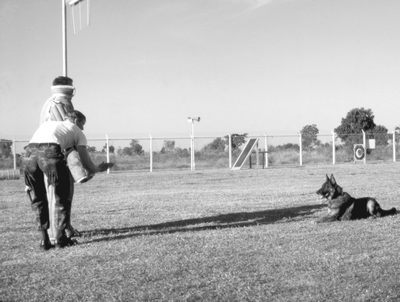 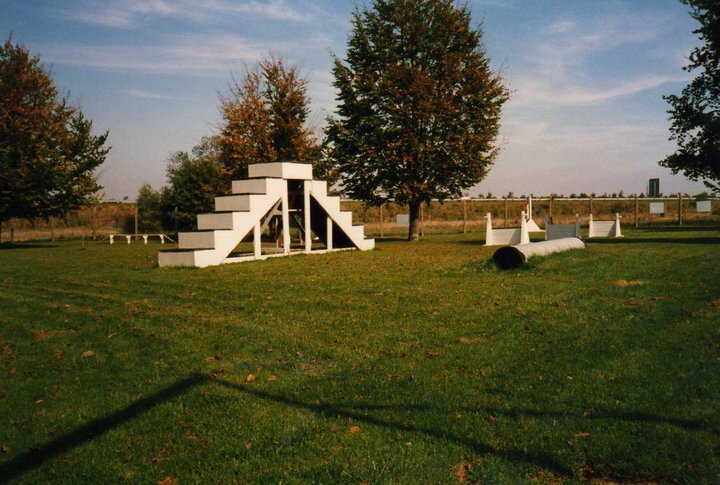 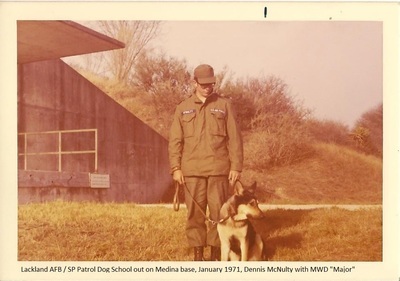 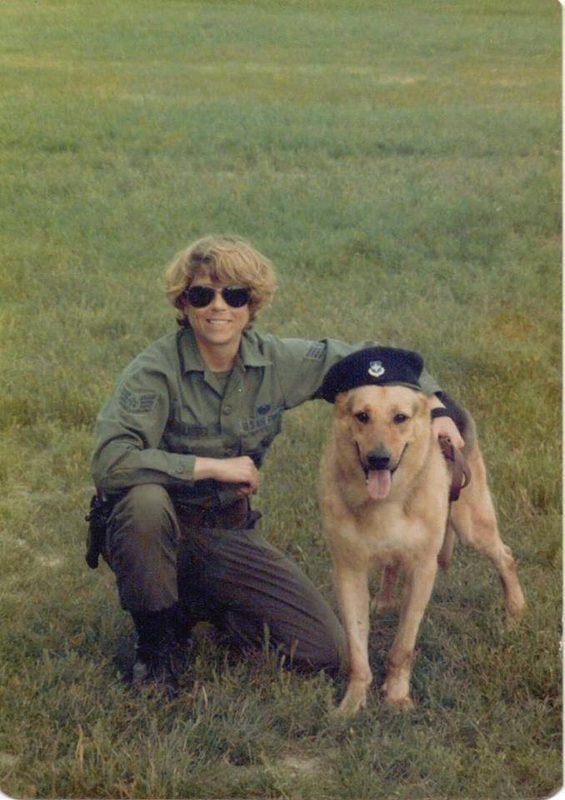 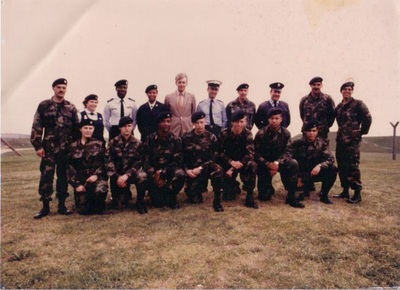 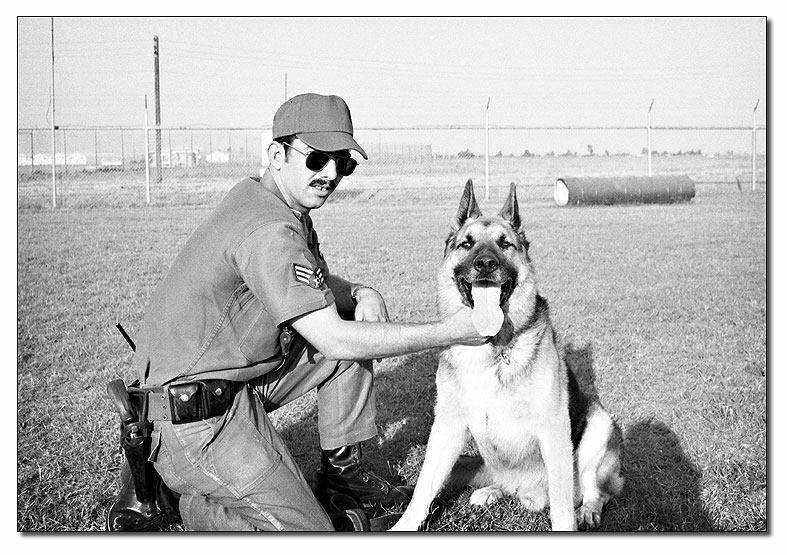 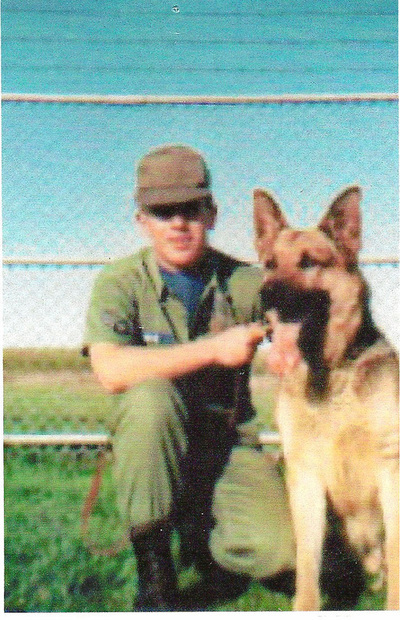 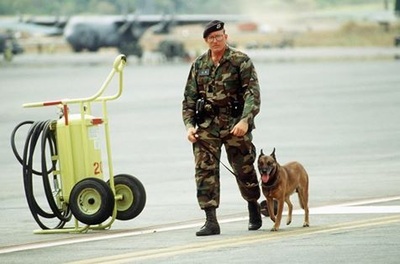 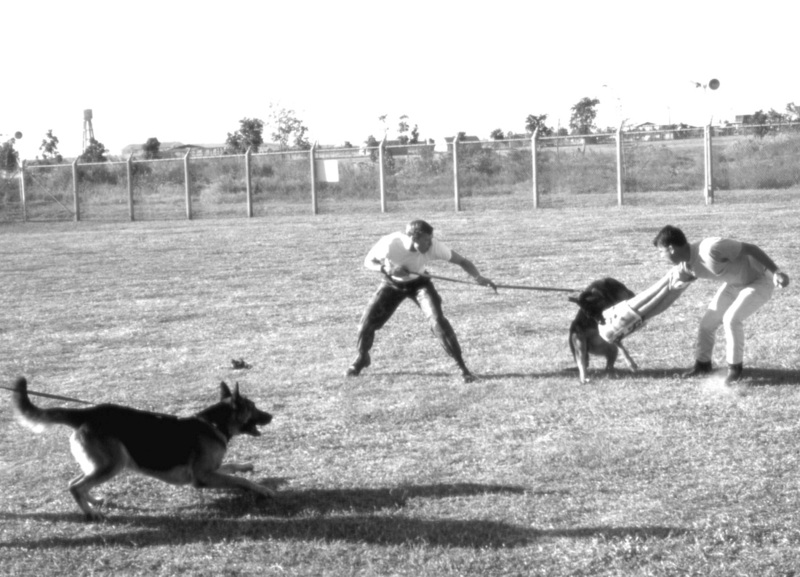 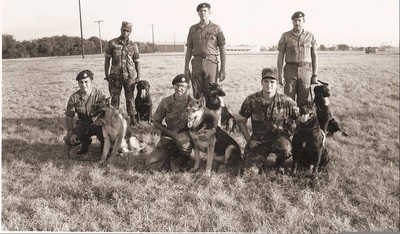 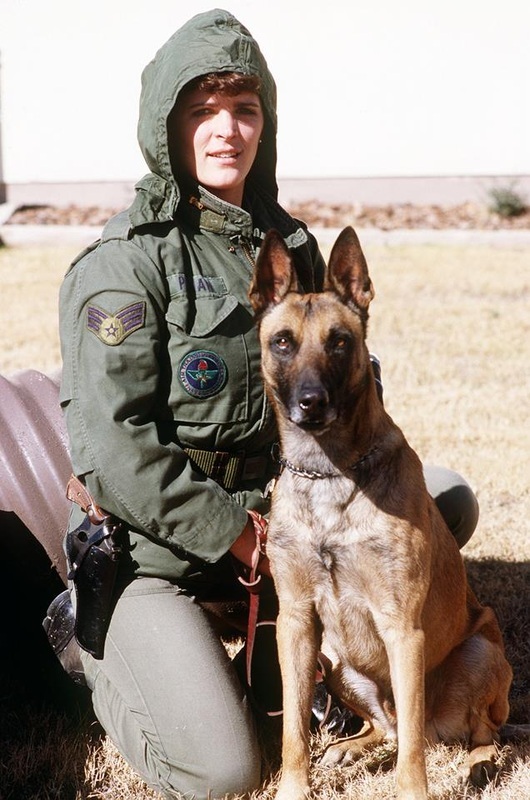 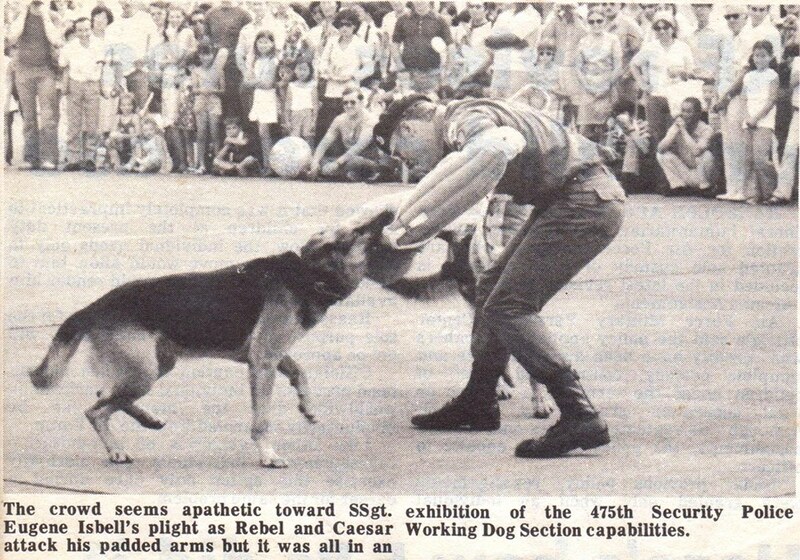 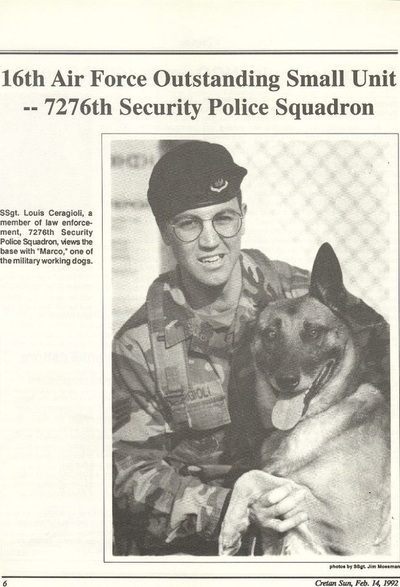 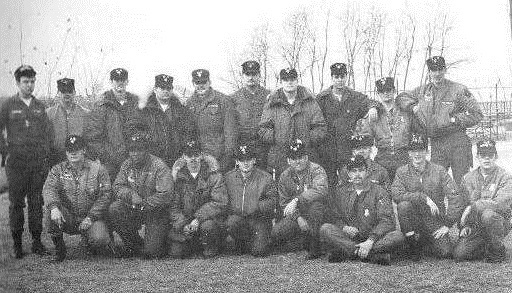 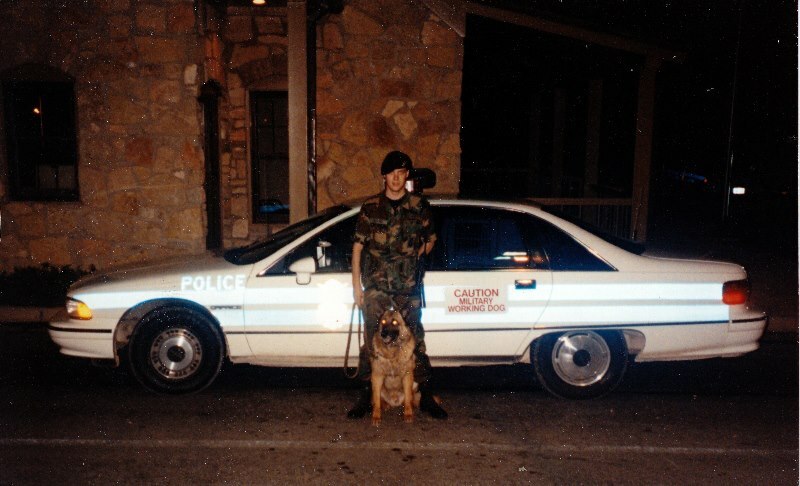 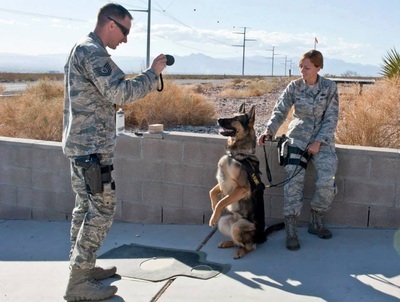 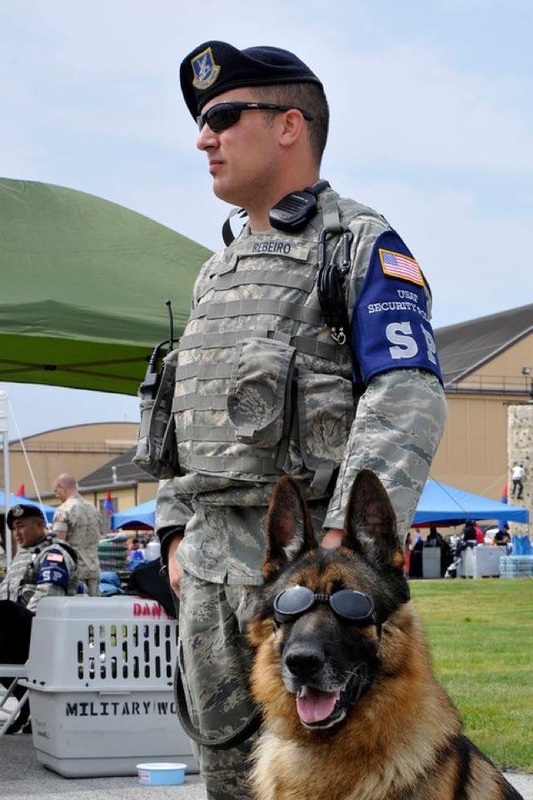 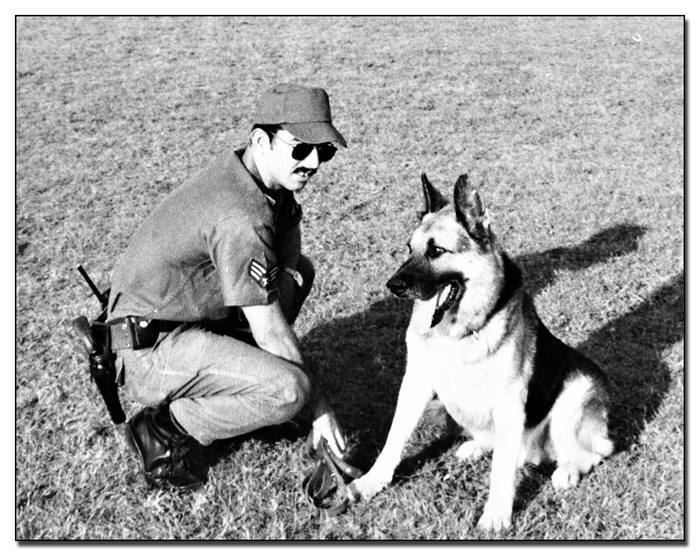 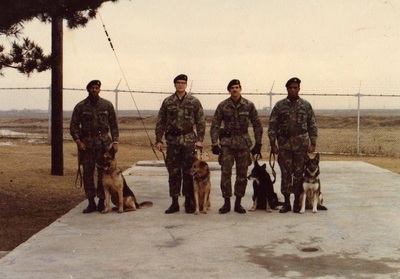 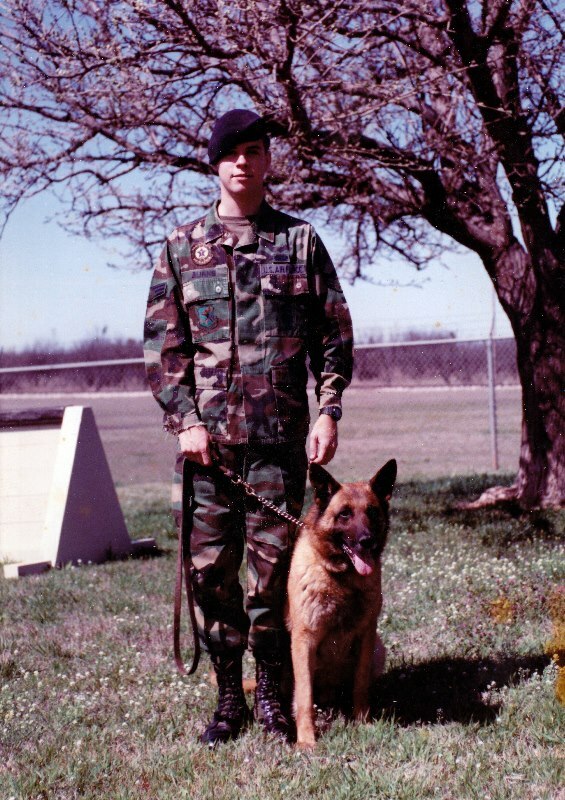 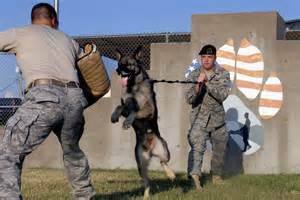 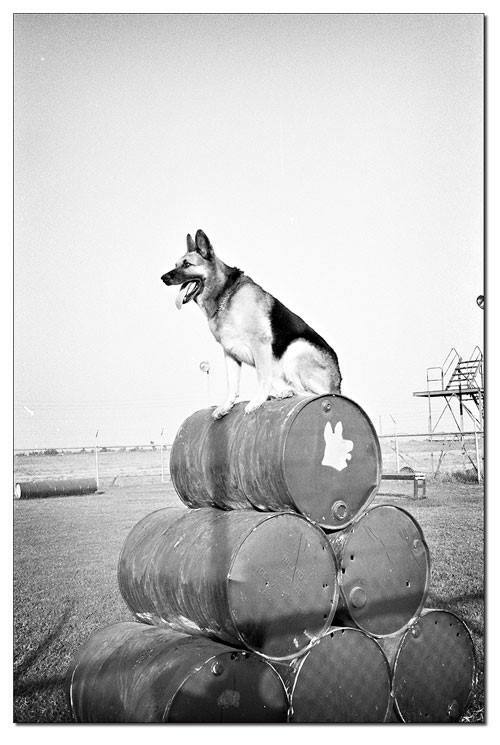 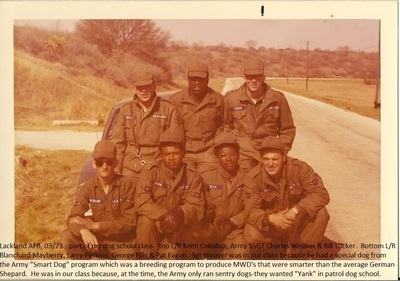 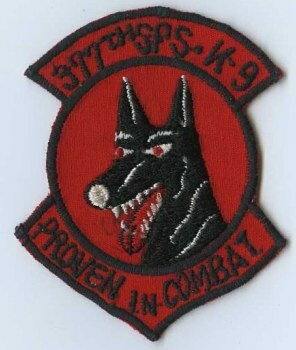 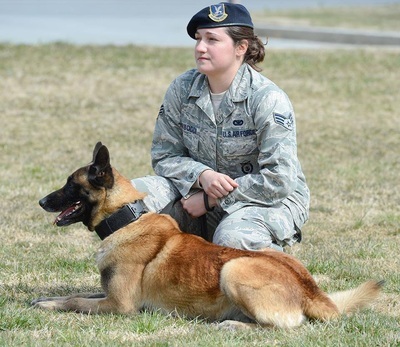 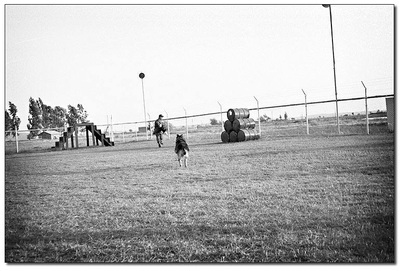 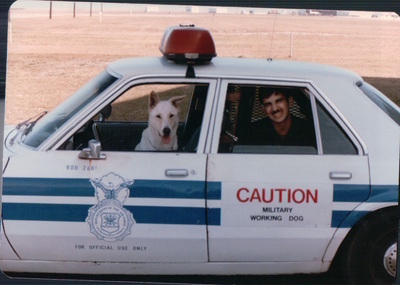 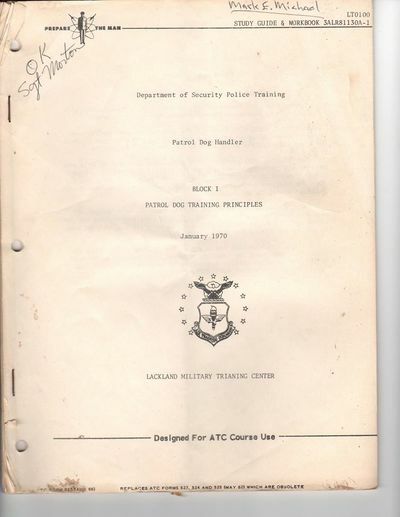 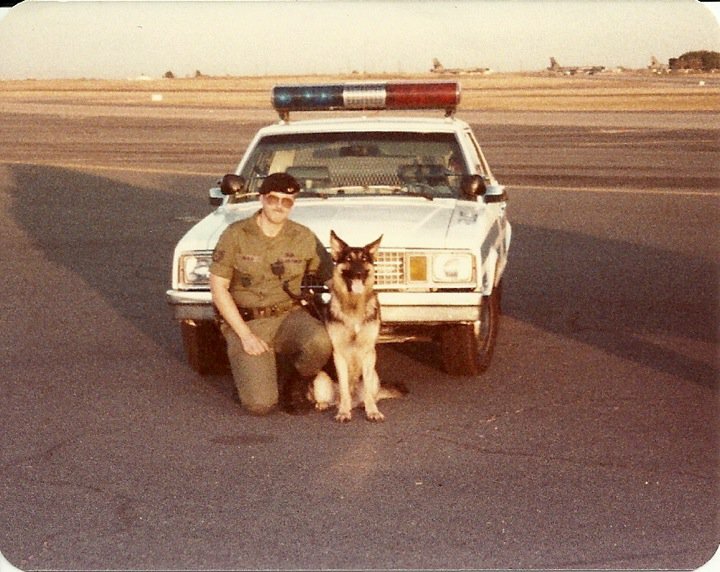 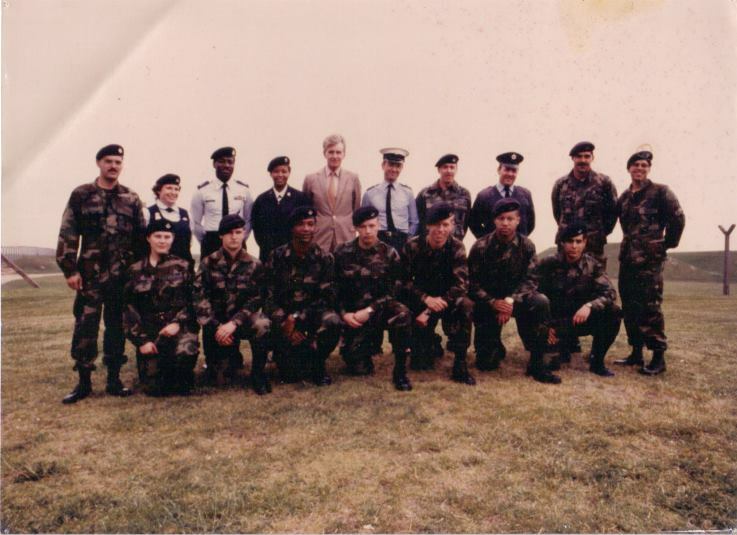 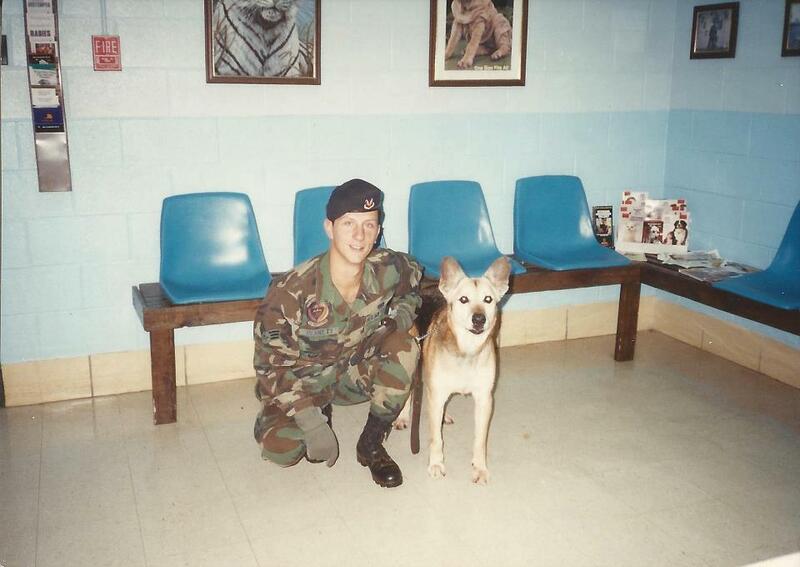 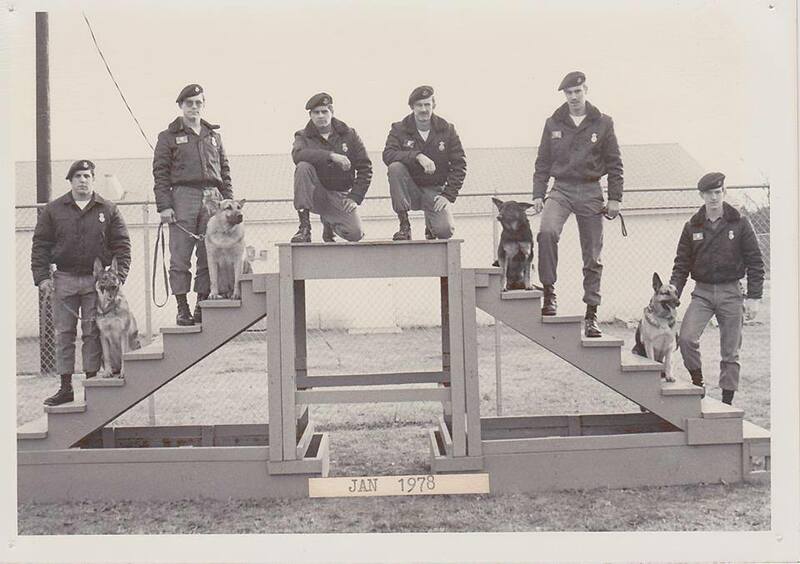 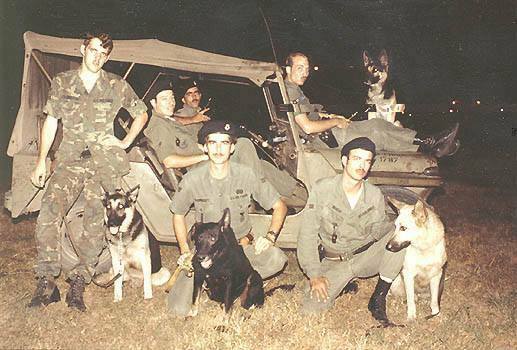 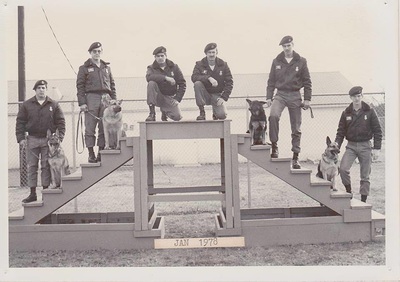 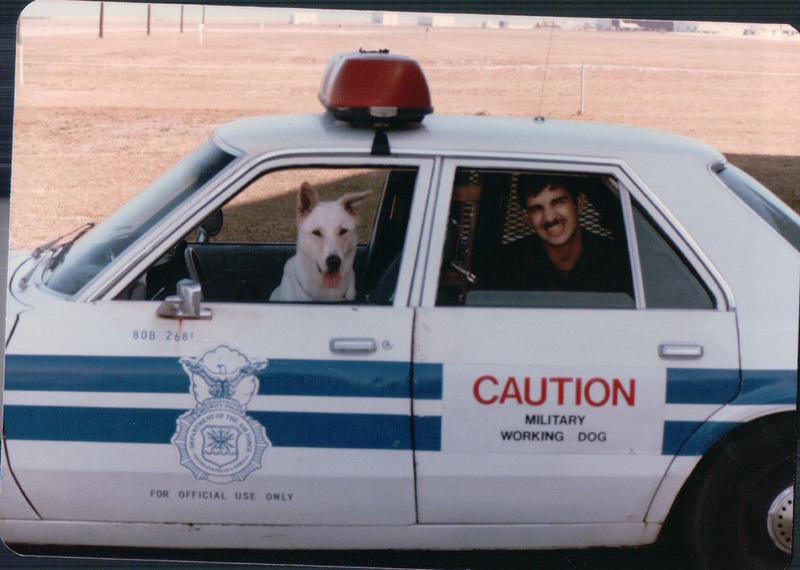 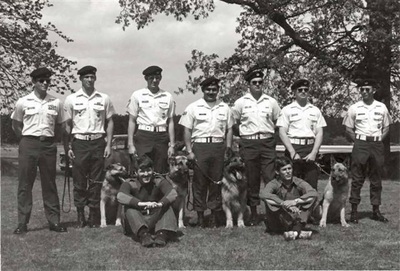 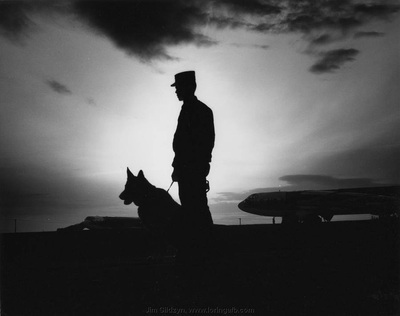 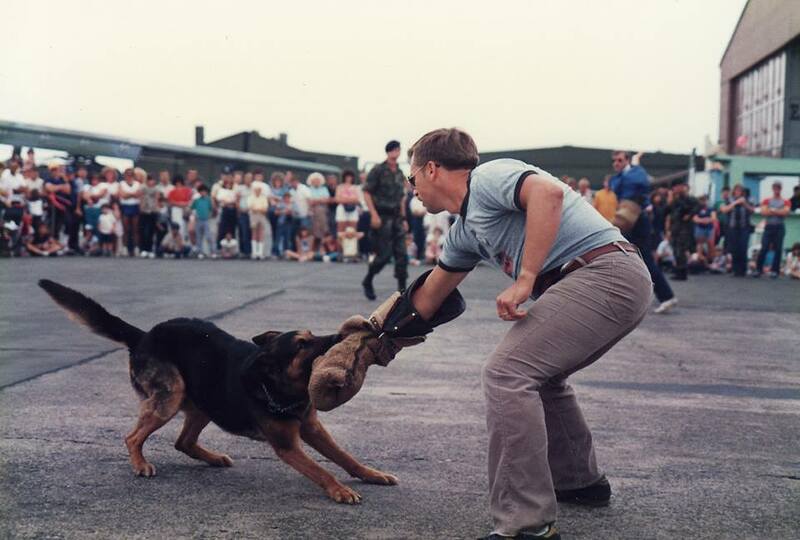 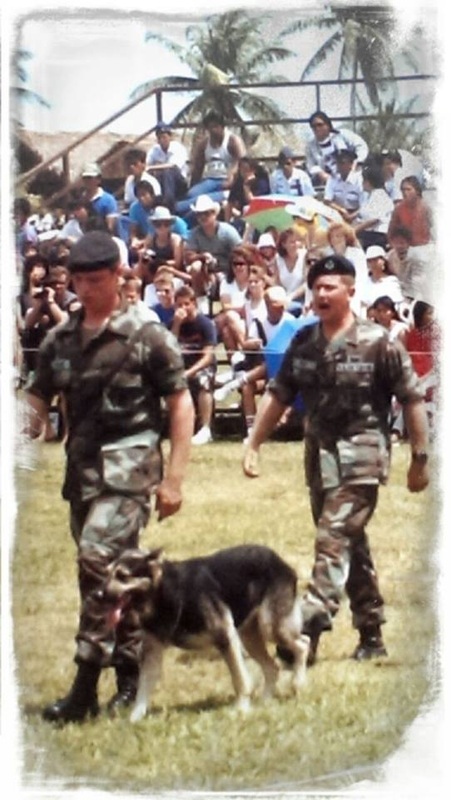 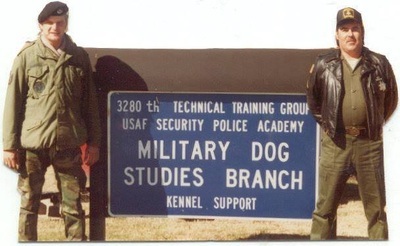 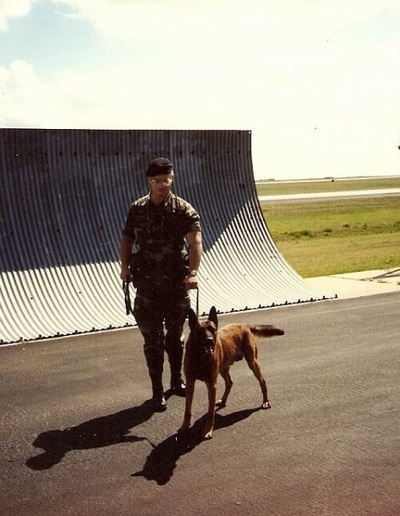 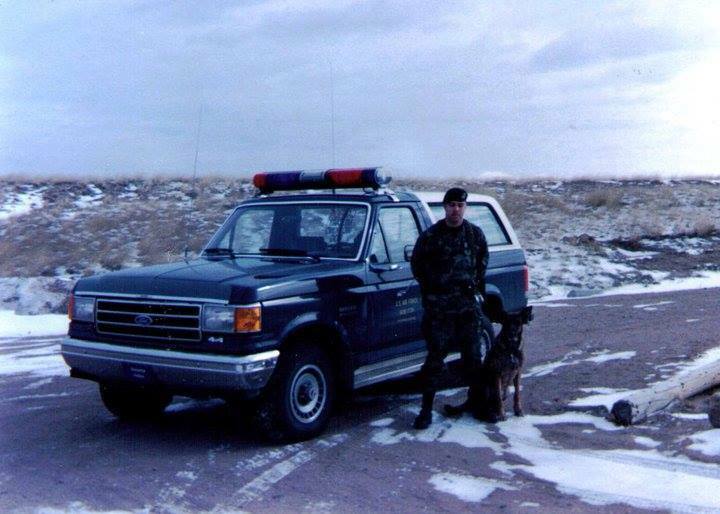 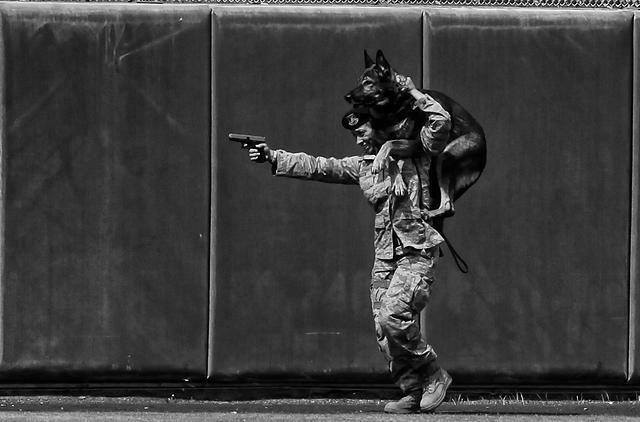 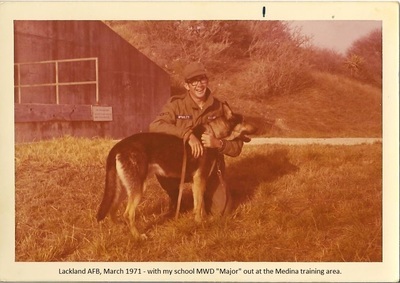 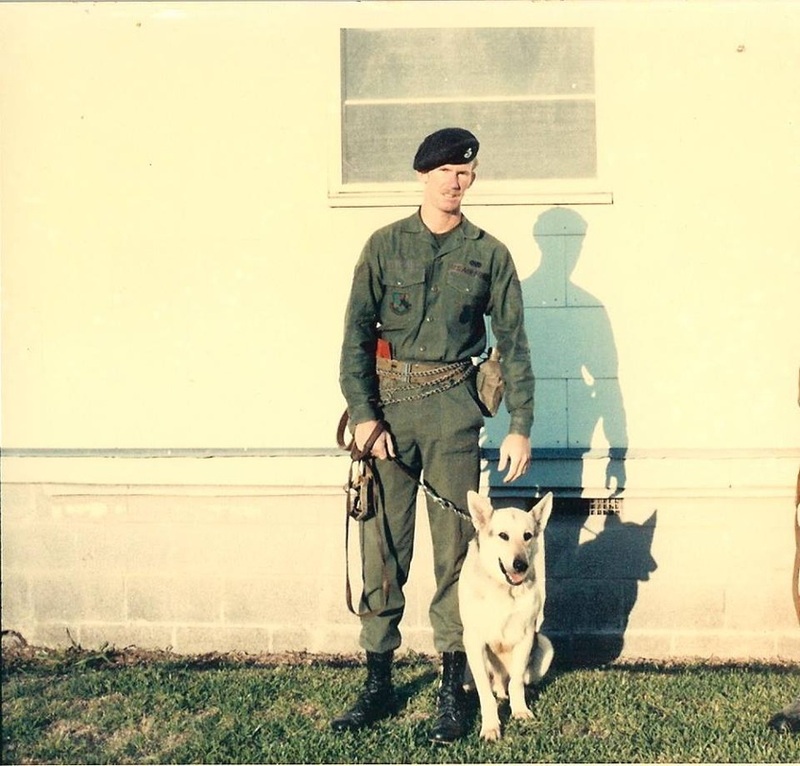 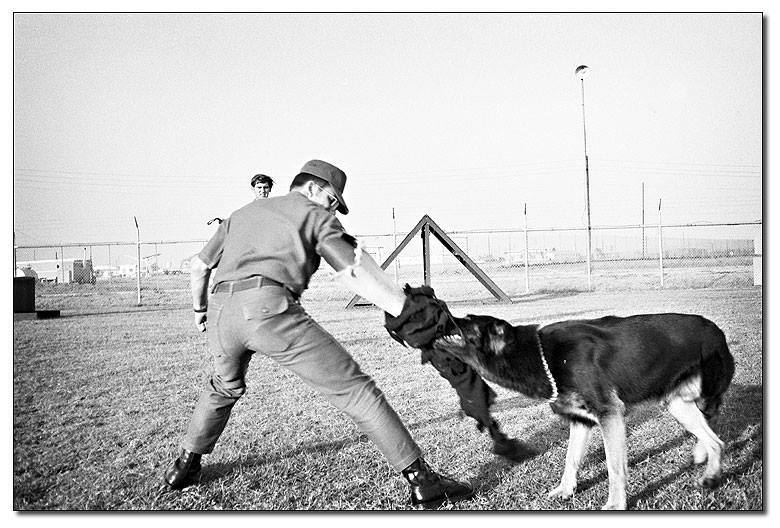 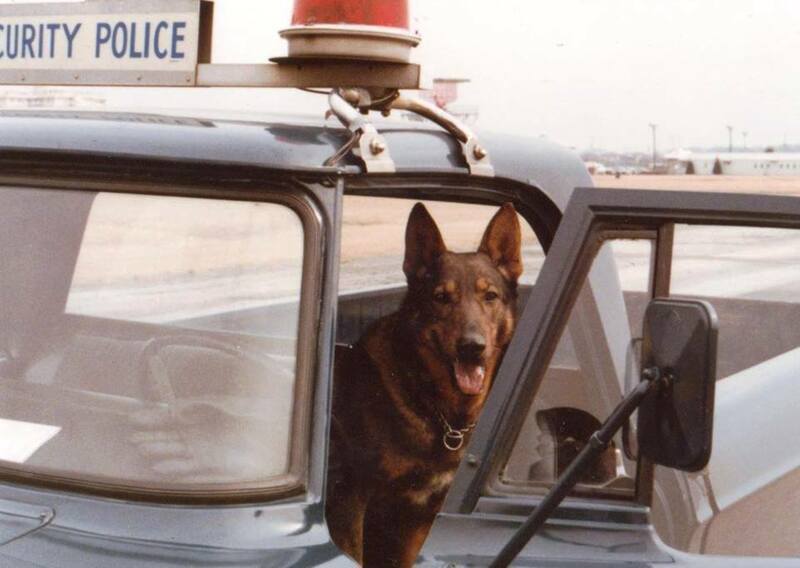 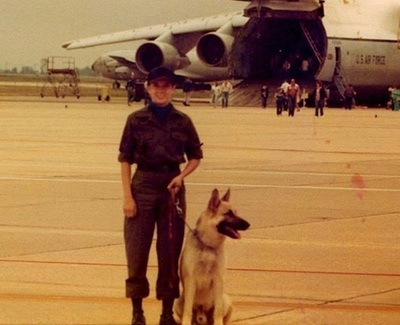 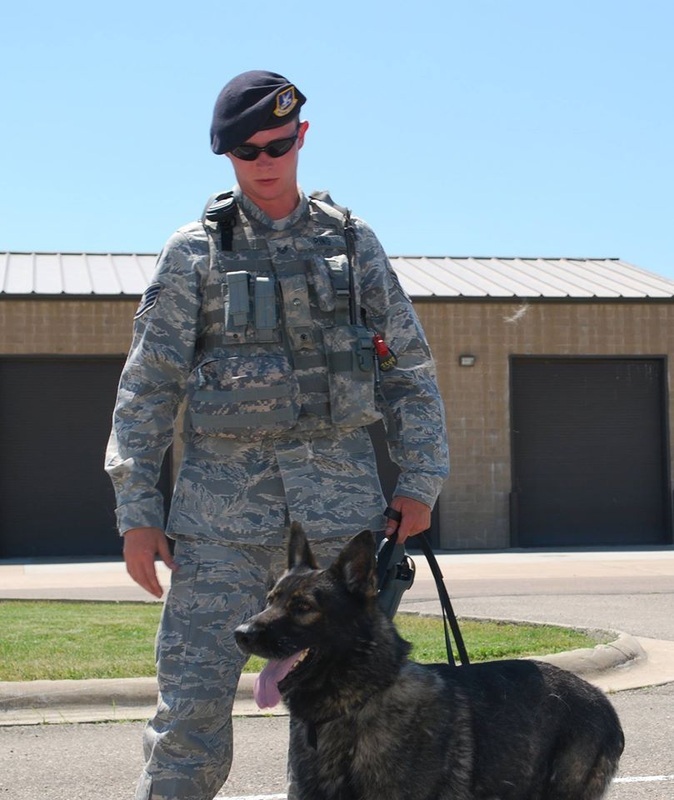 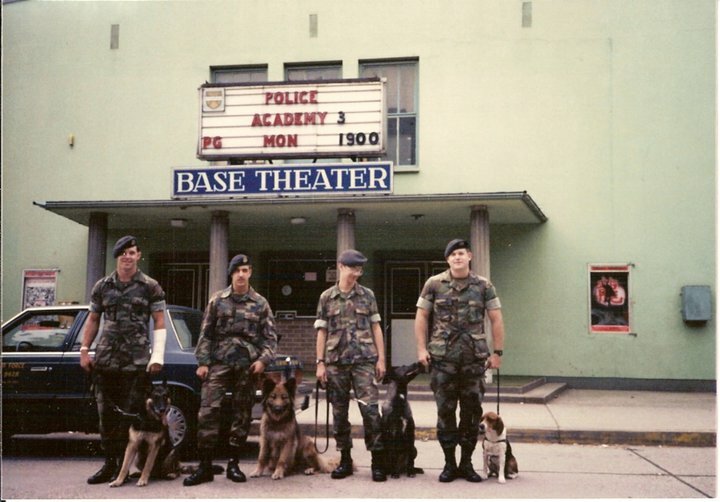 The United States Military Working Dog Demonstration Team was formed in 1975 at Lackland AFB. Click on the title to read a short history. 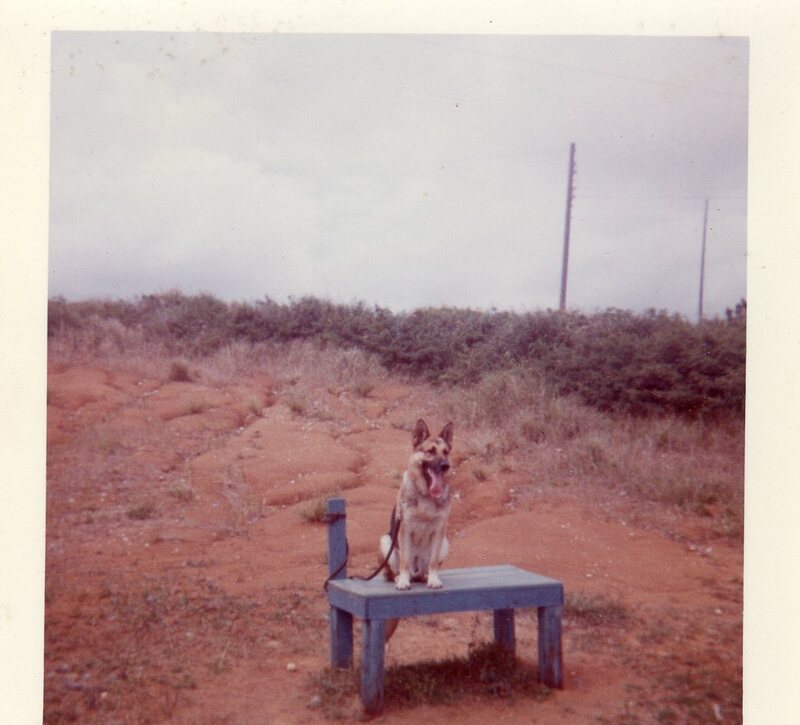 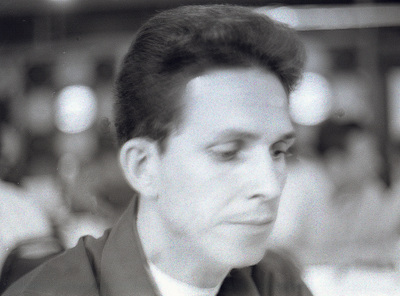 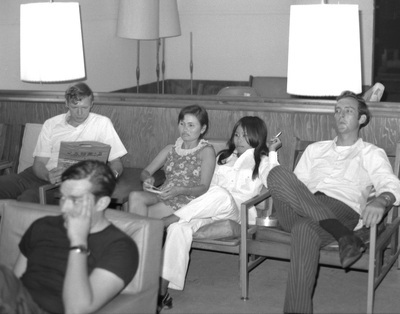 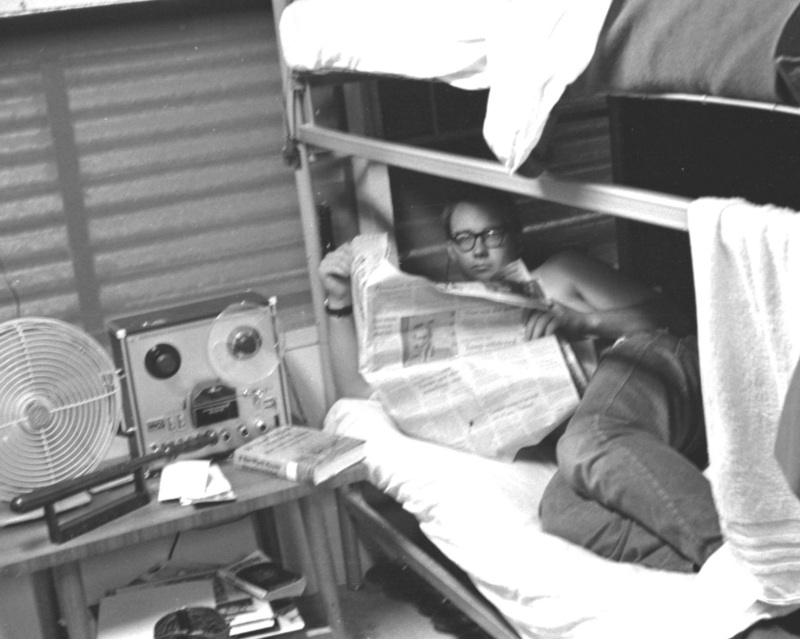 Long after I’d gone home.